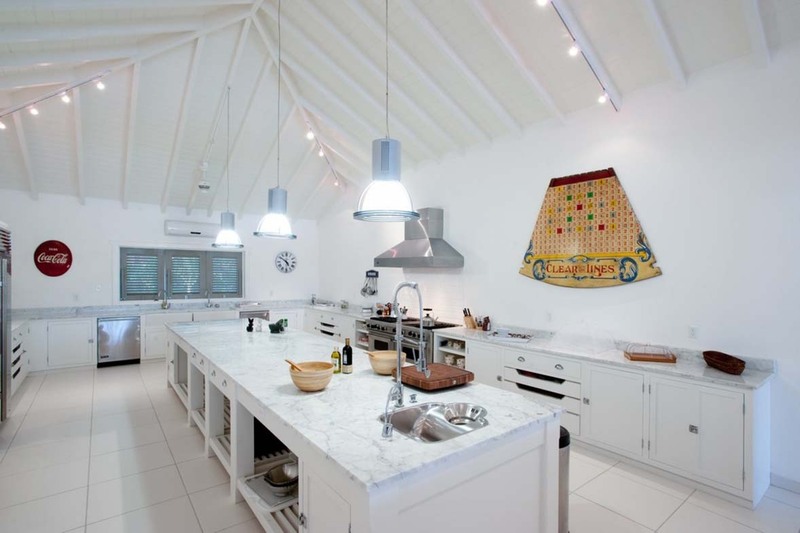 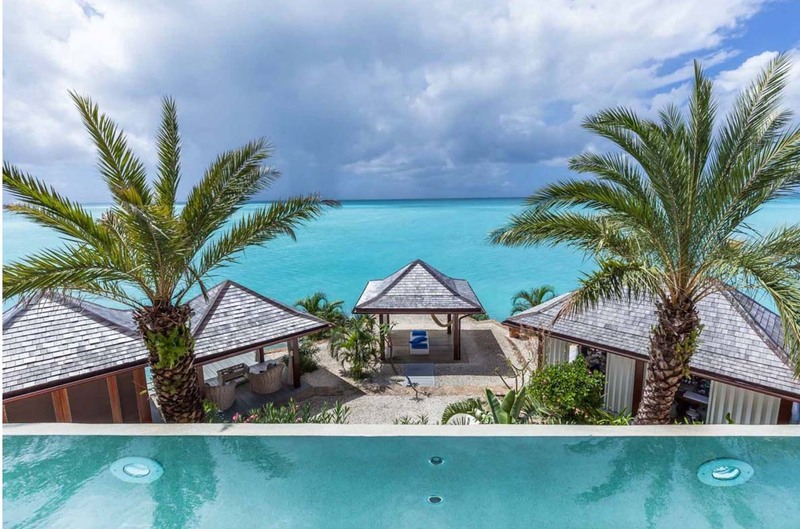 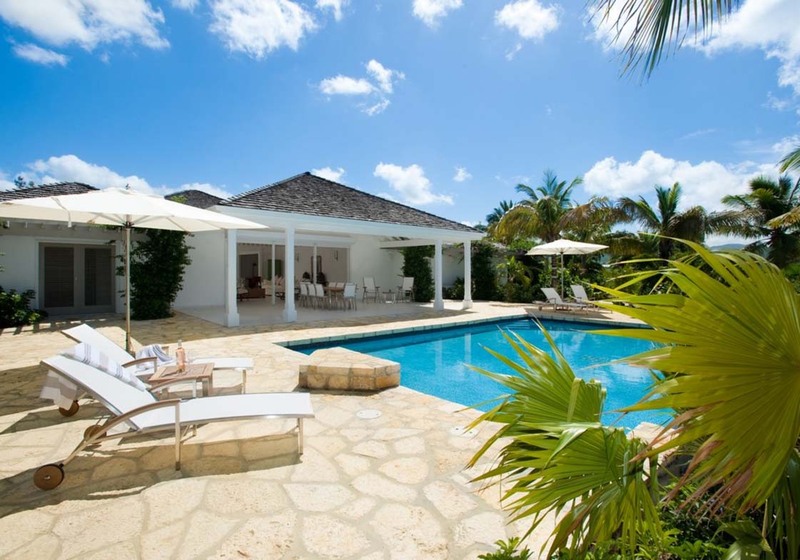 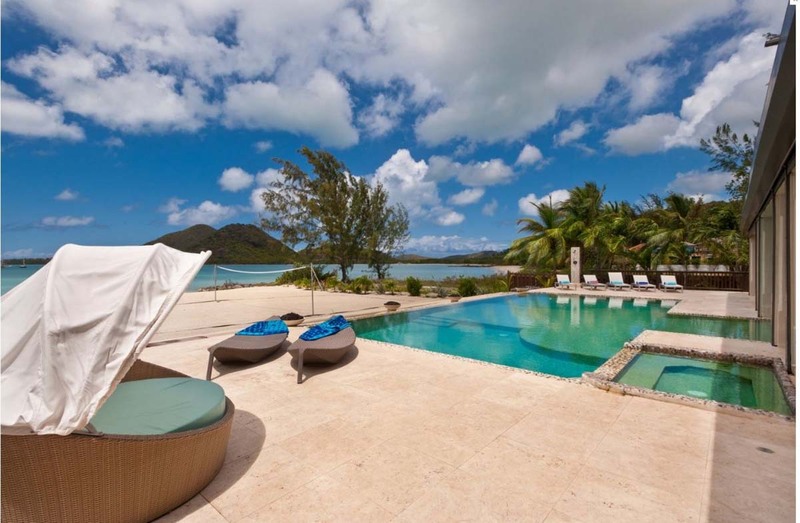 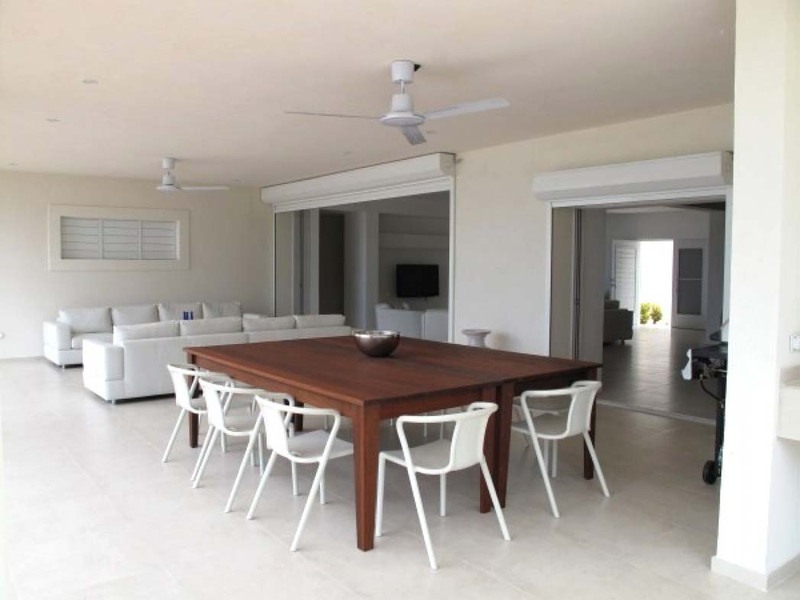 We looked hard and found these 8 best villas for rental in Jolly Harbour. 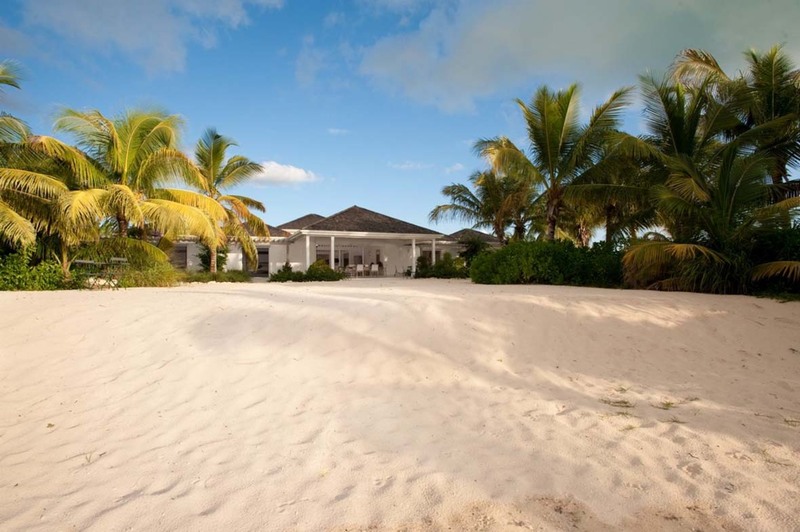 Often located on the beach, and we mean on the beach! 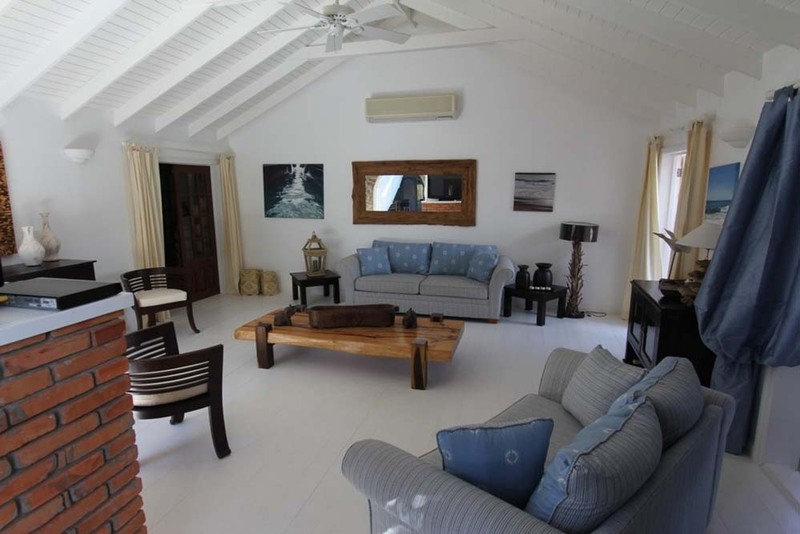 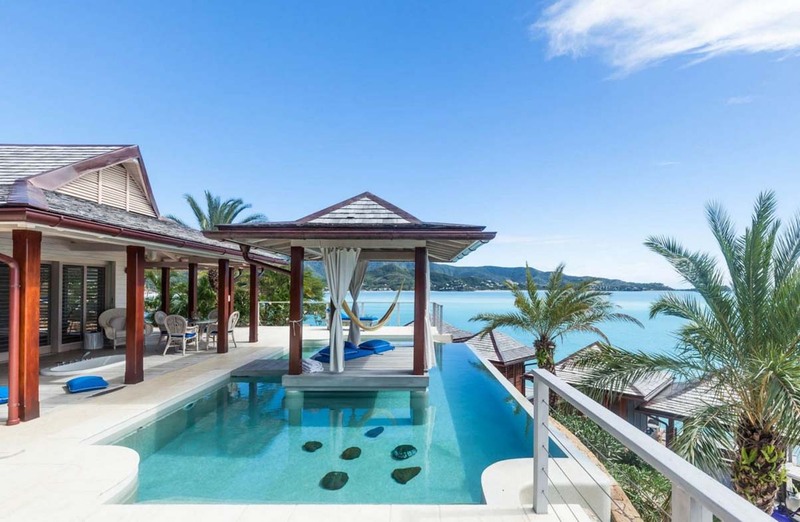 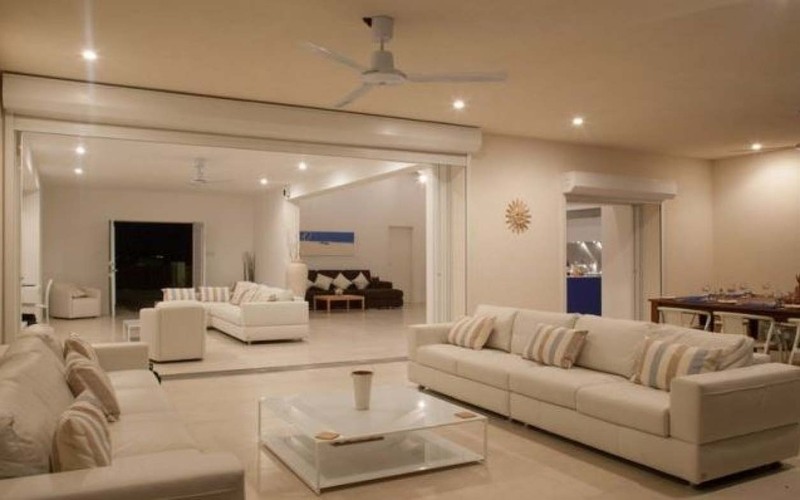 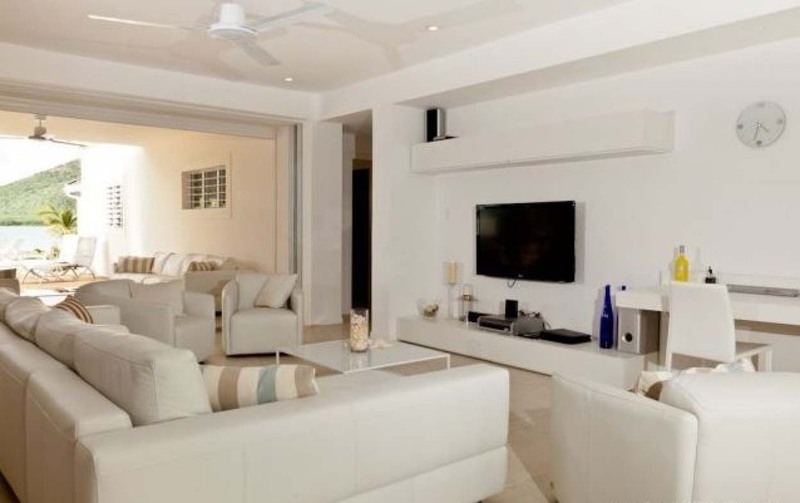 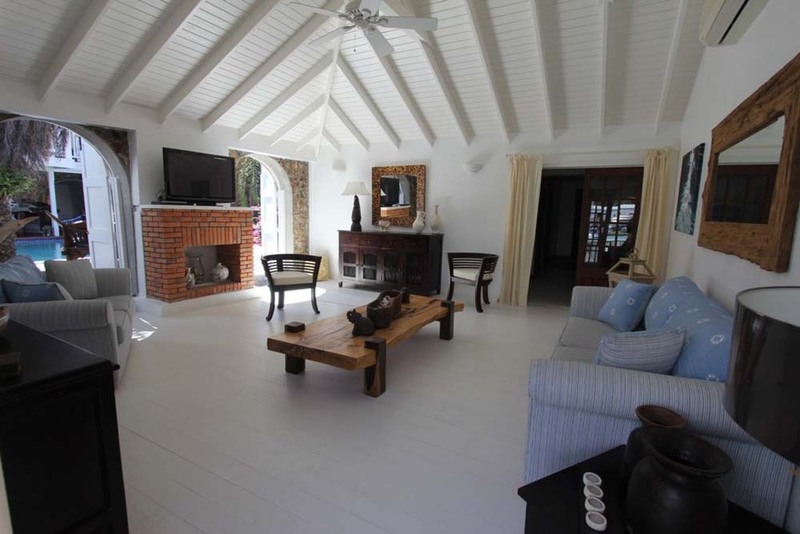 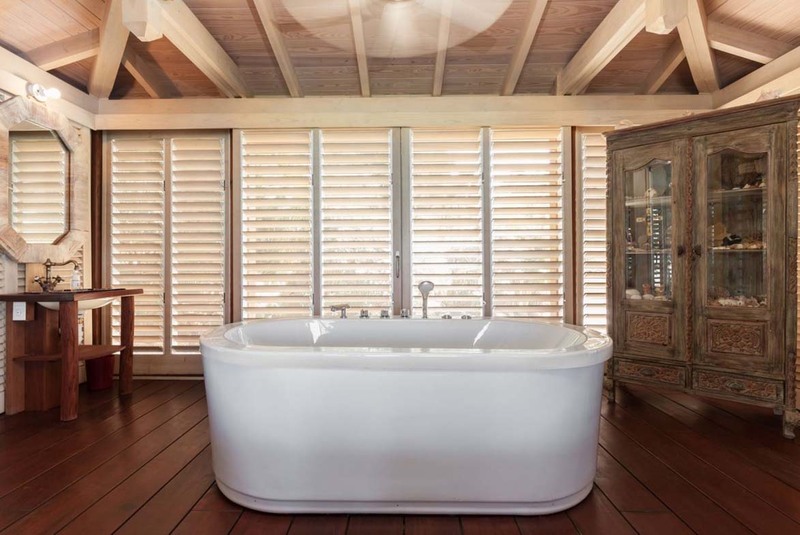 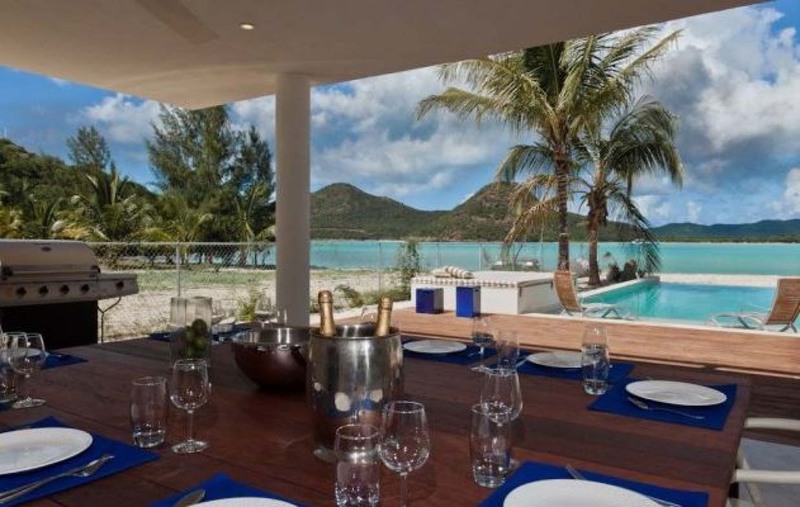 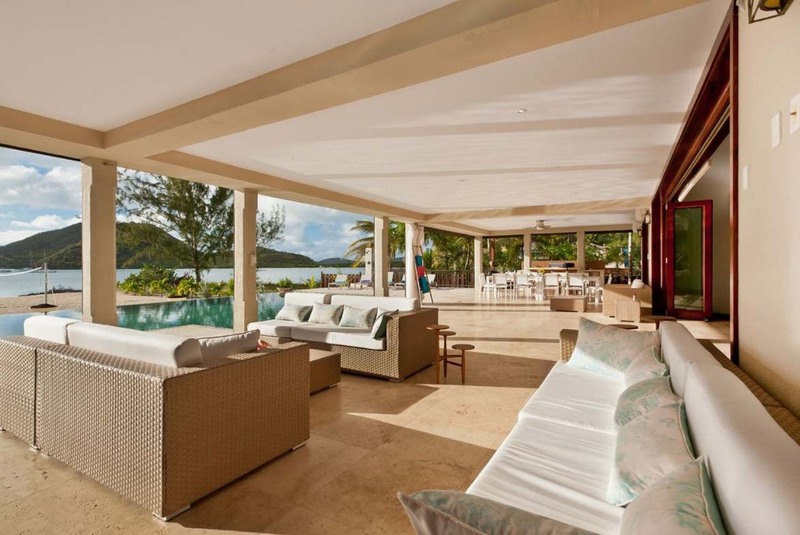 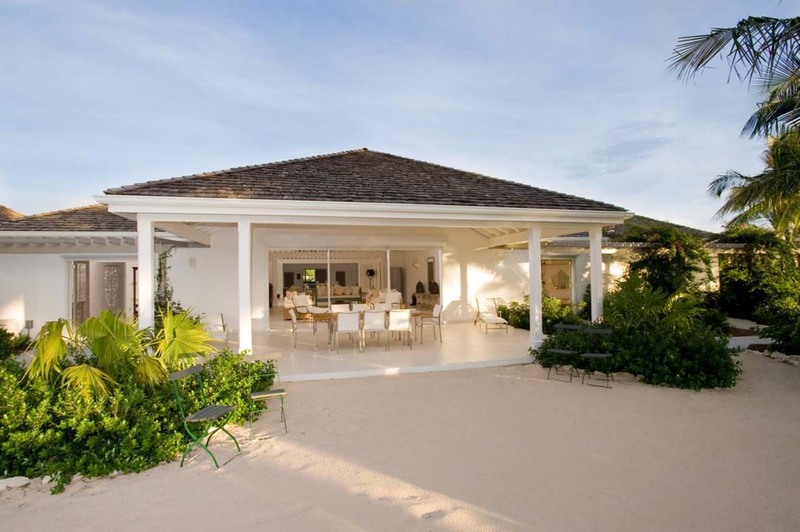 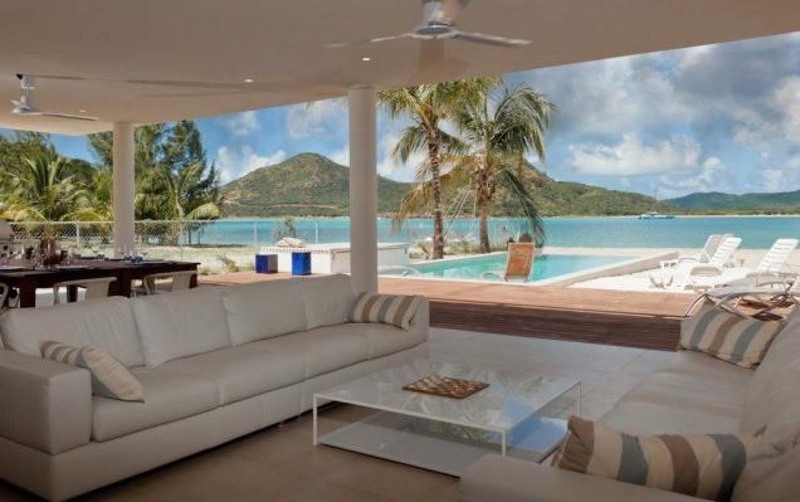 We looked around and examined in detail the best villas available in Jolly Harbour. 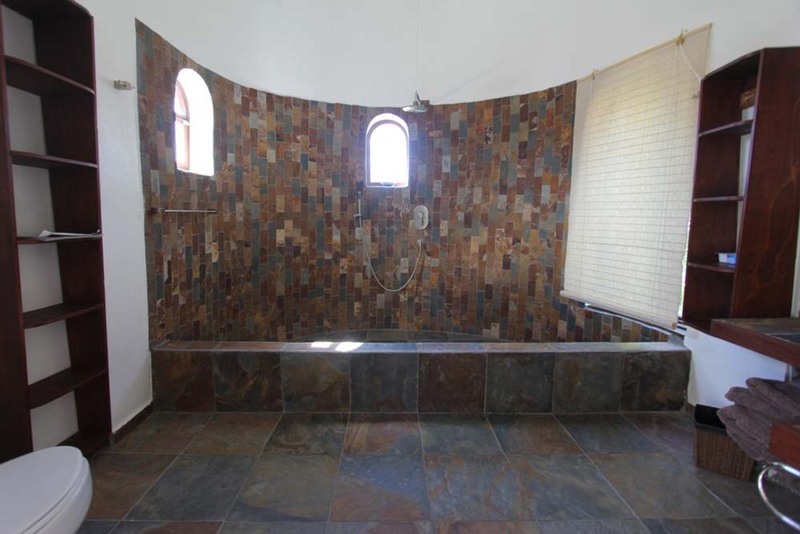 We bring you these in enough detail to get your search off to an efficient start- maybe the search starts and ends here? 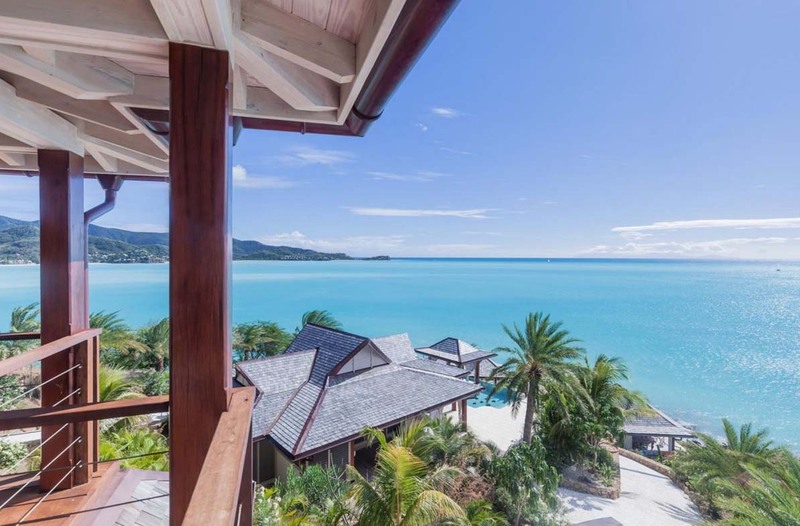 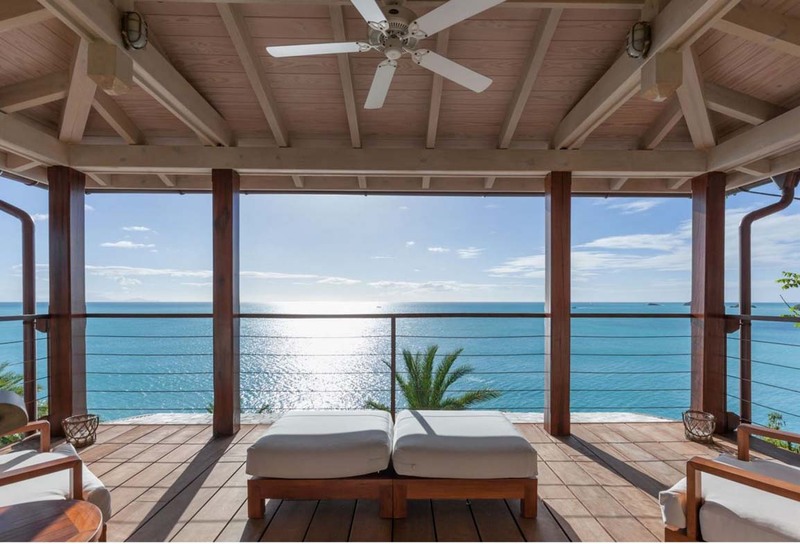 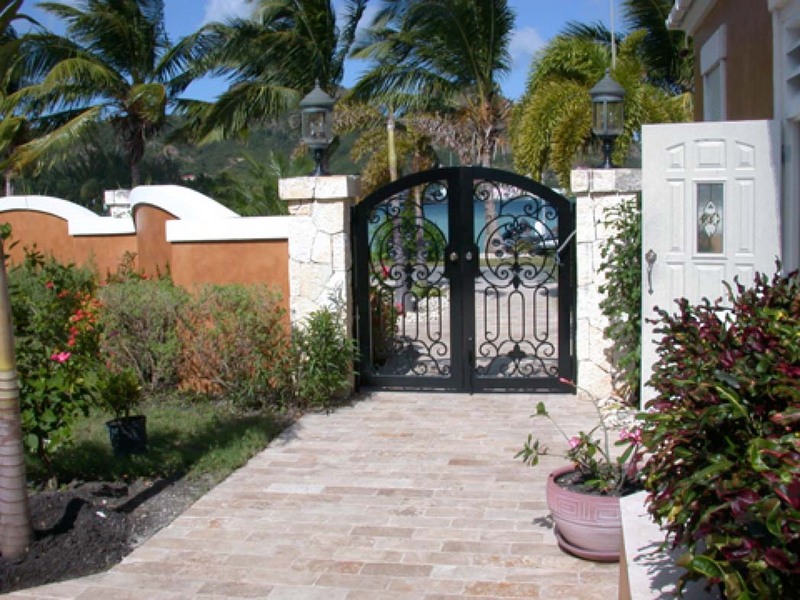 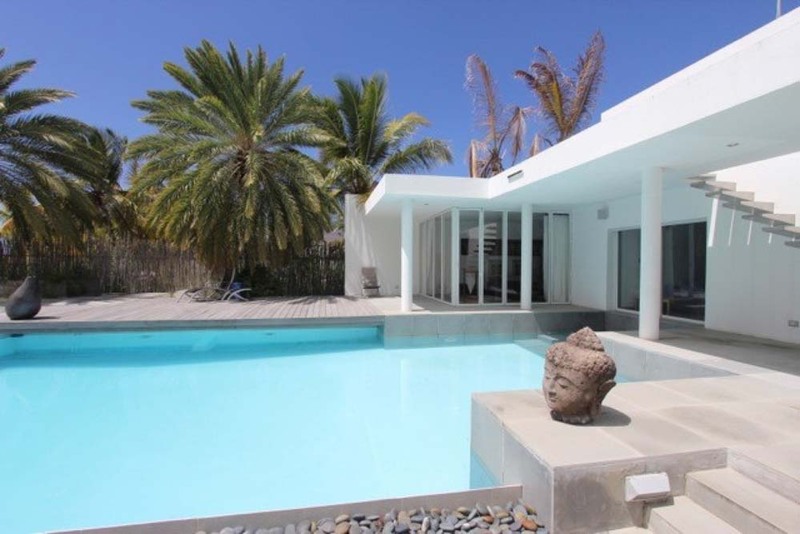 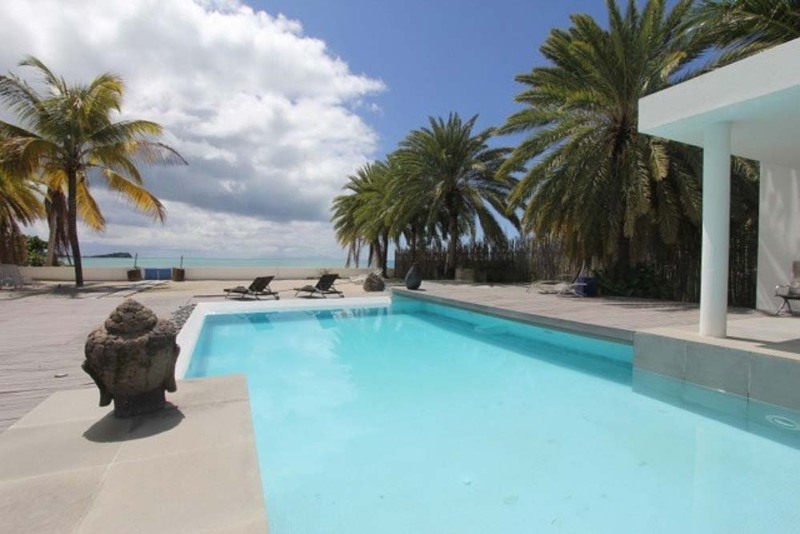 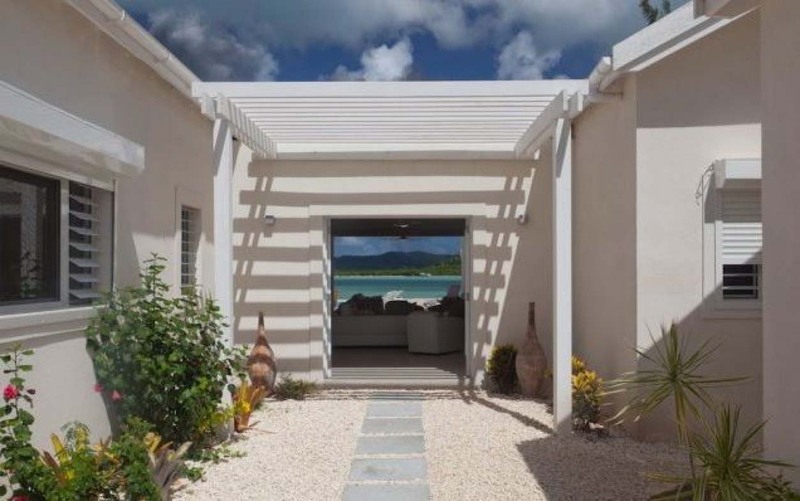 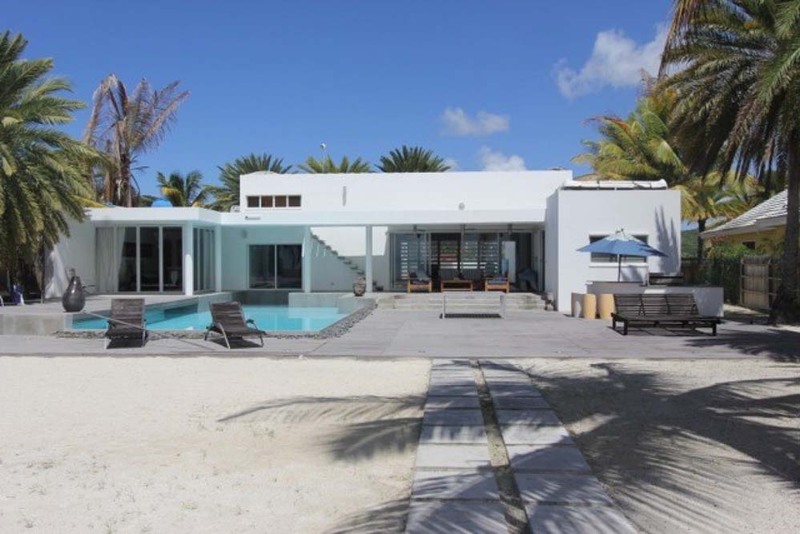 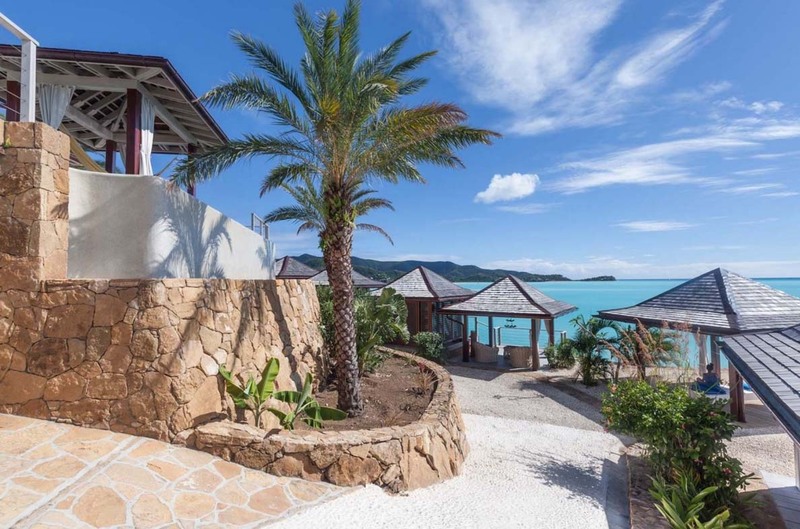 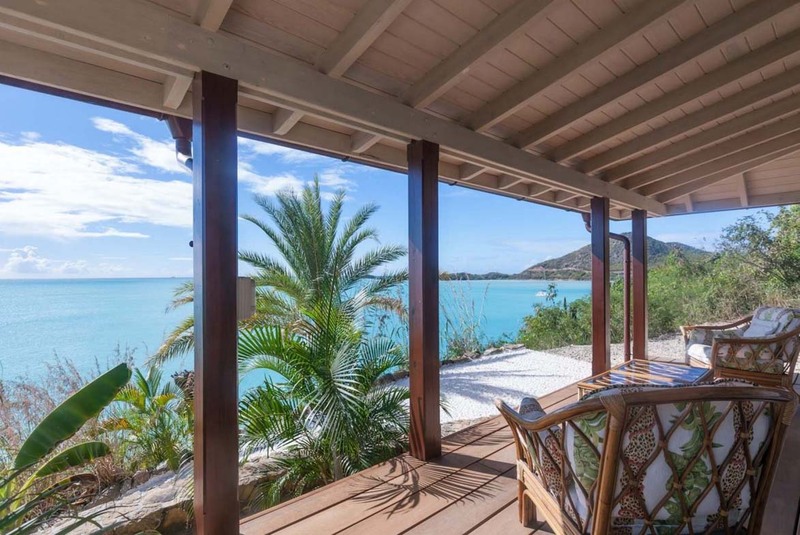 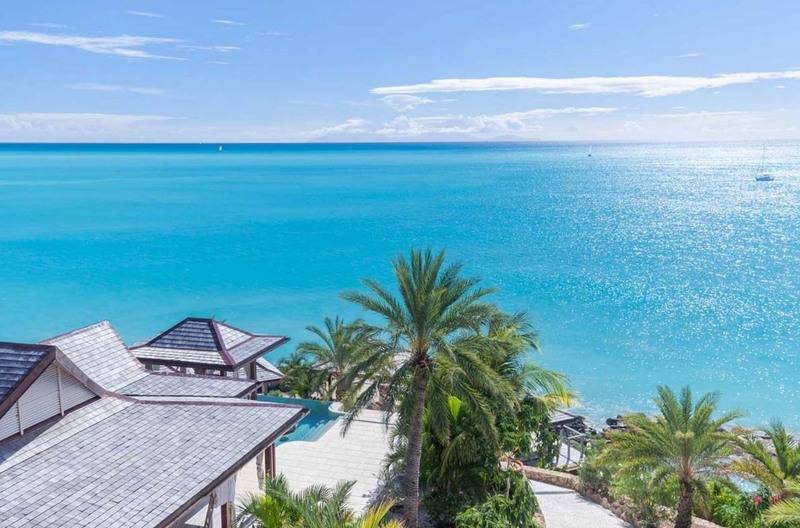 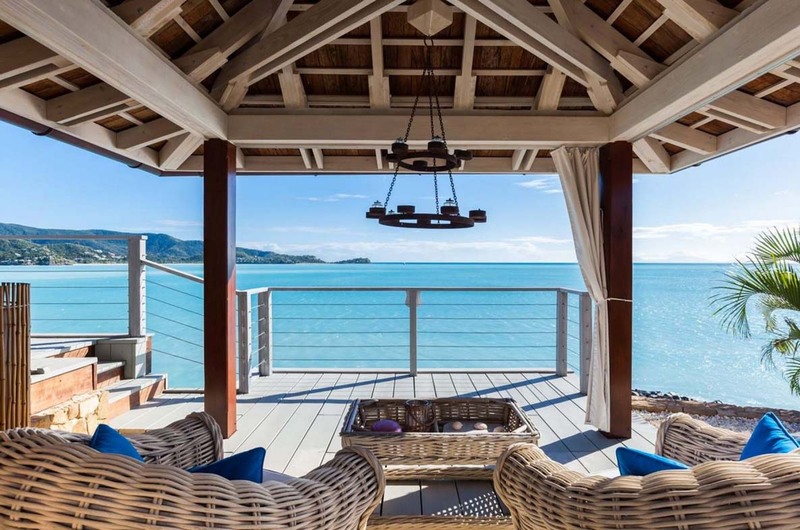 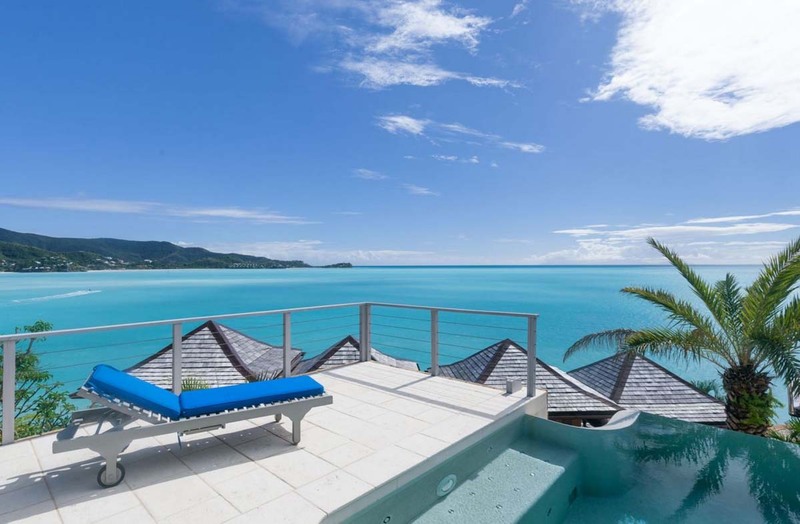 Situated on one of the best beaches in Antigua and located within the gated community of Jolly Harbour with all it's ammenities these villas have a lot to offer. 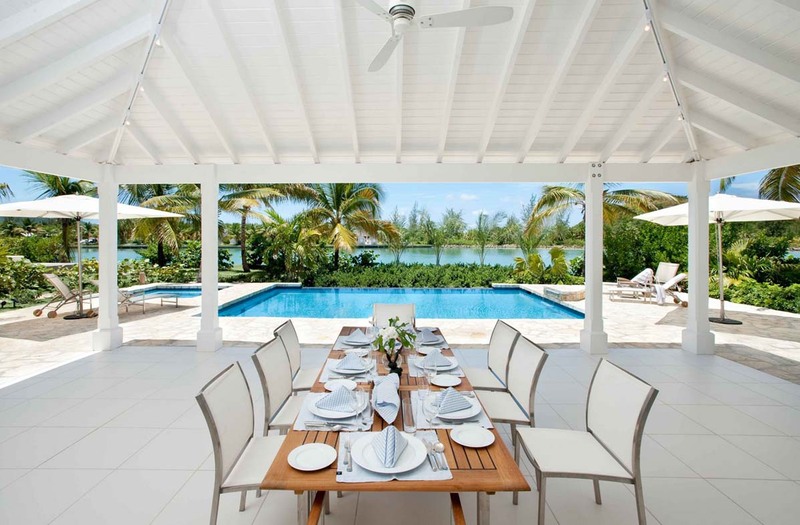 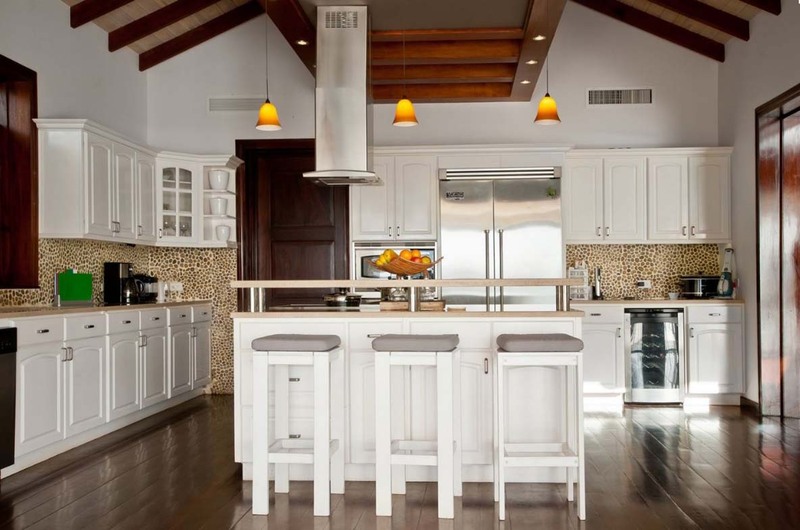 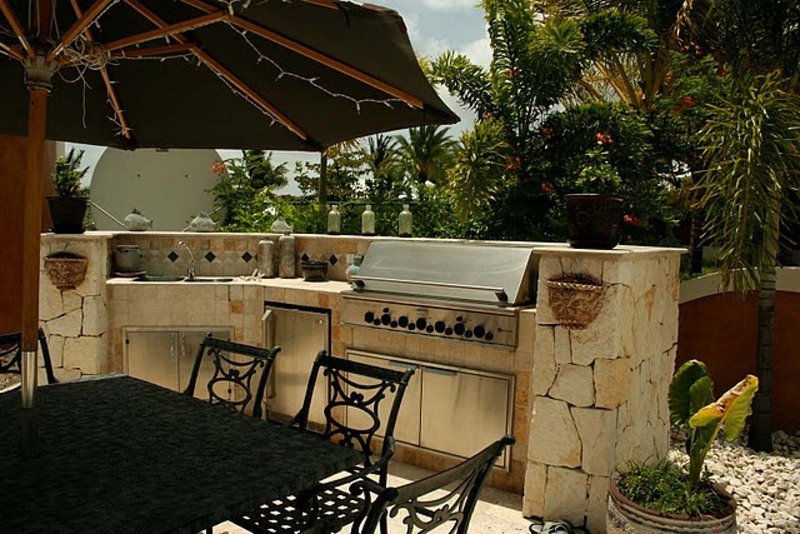 Often catering to larger groups of nice sized families you will be assured privacy and facility, steps away from the turquoise waters of the Caribbean sea on one of the calmest beaches. 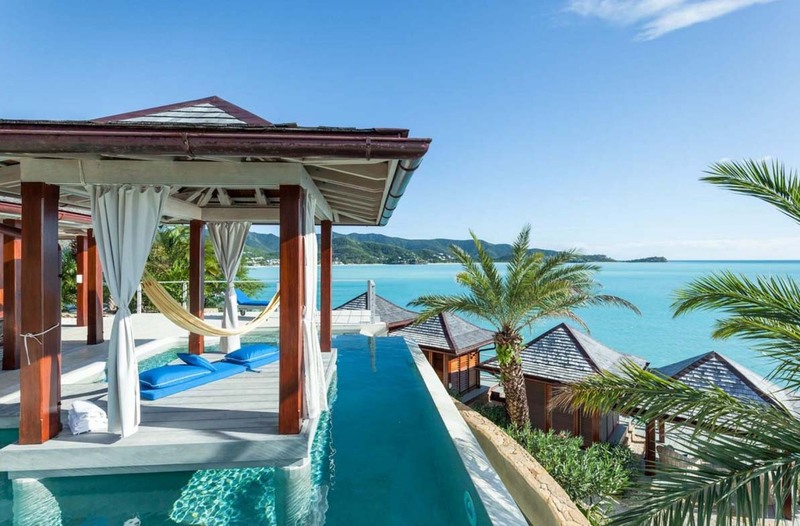 The following 8 top villas are not in order of prefference and all are spectacular. 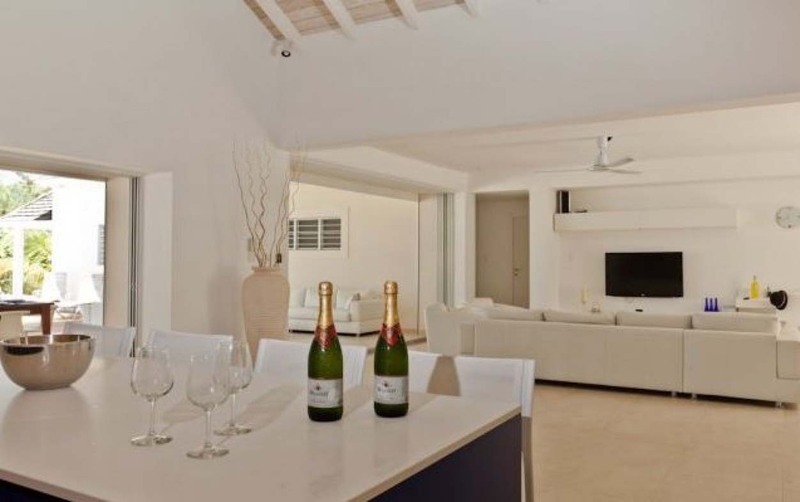 With handy blurbs for each villa you can decide if they are right for you quickly saving you time. 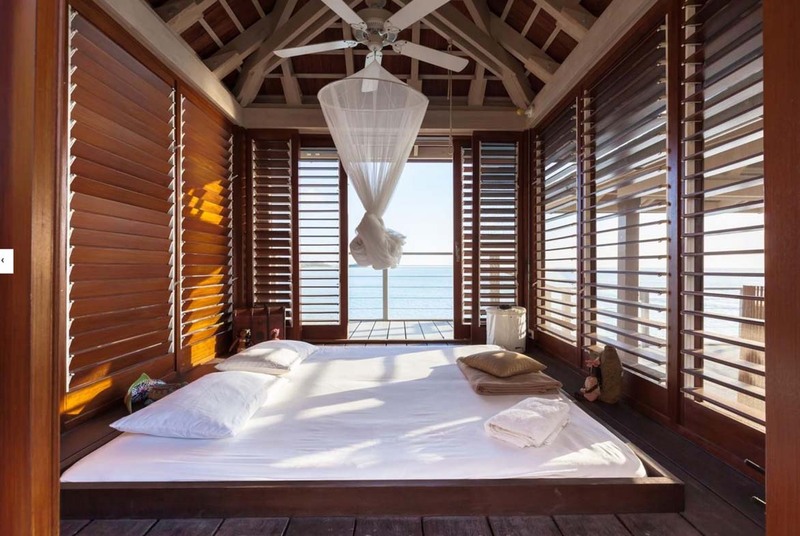 If none suit you then don't fret there were many that did not make the cut which doesnt mean they are not worth of a week or two's stay! 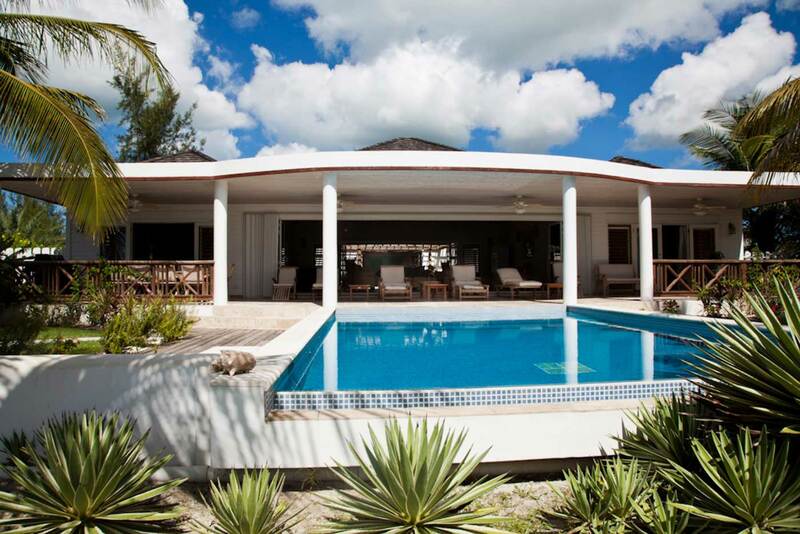 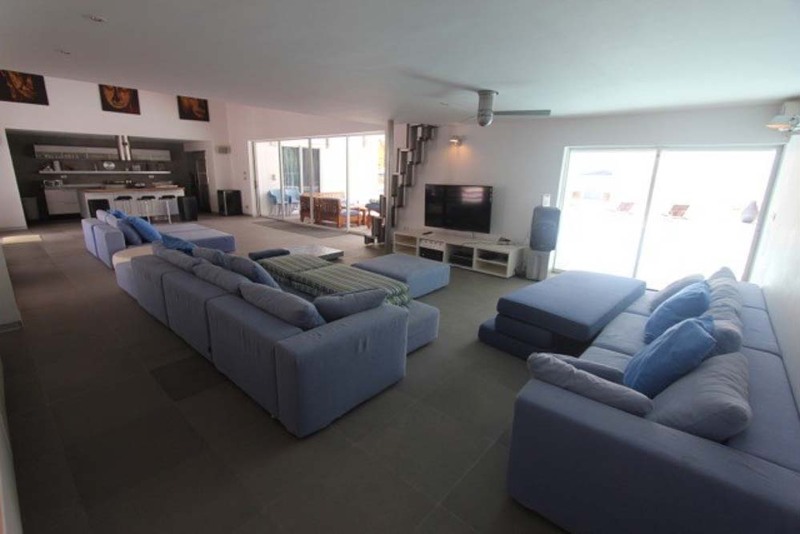 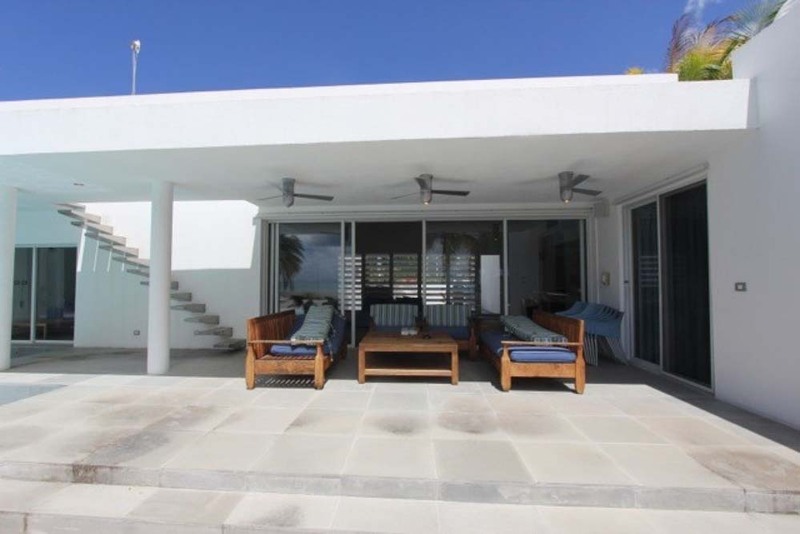 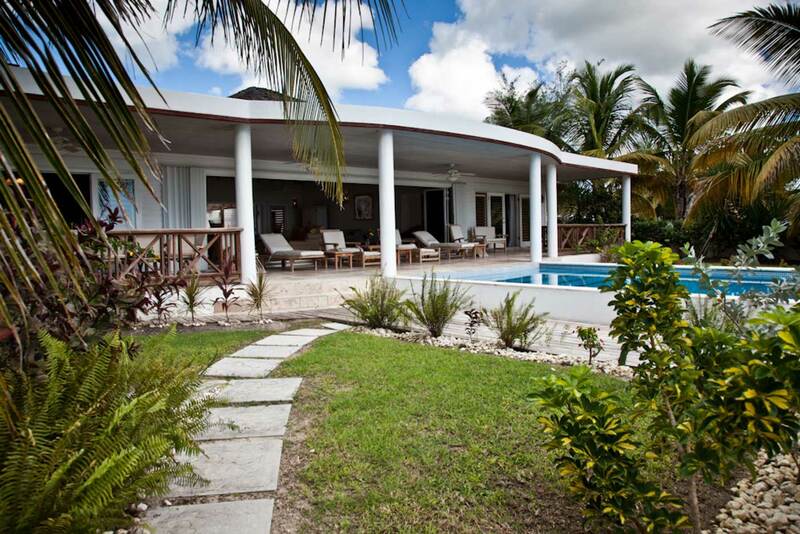 This is a 5 bedroom villa right on the beach that sleeps 10! 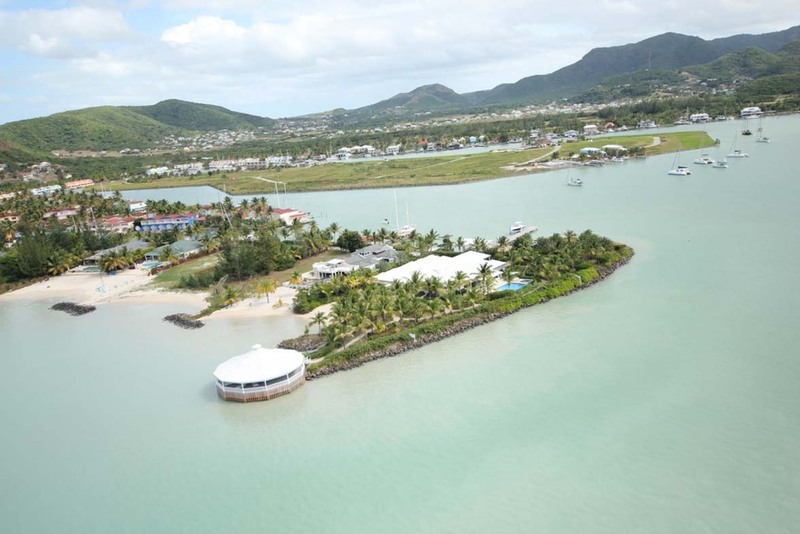 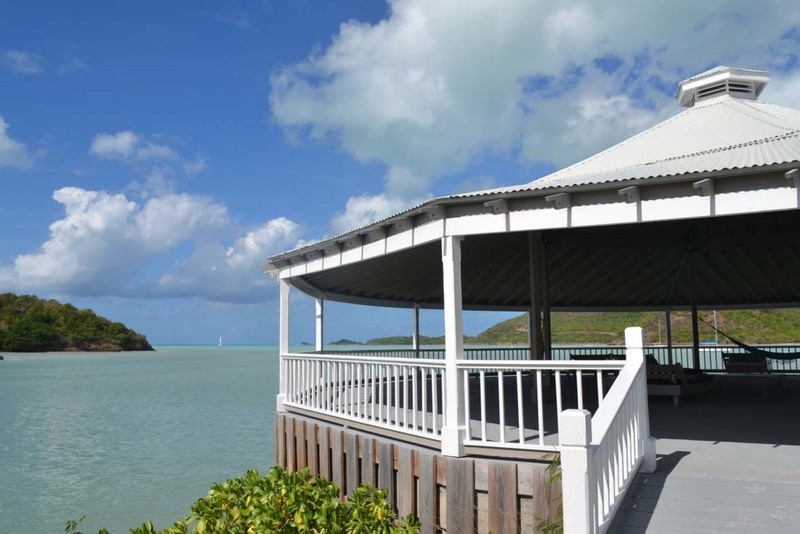 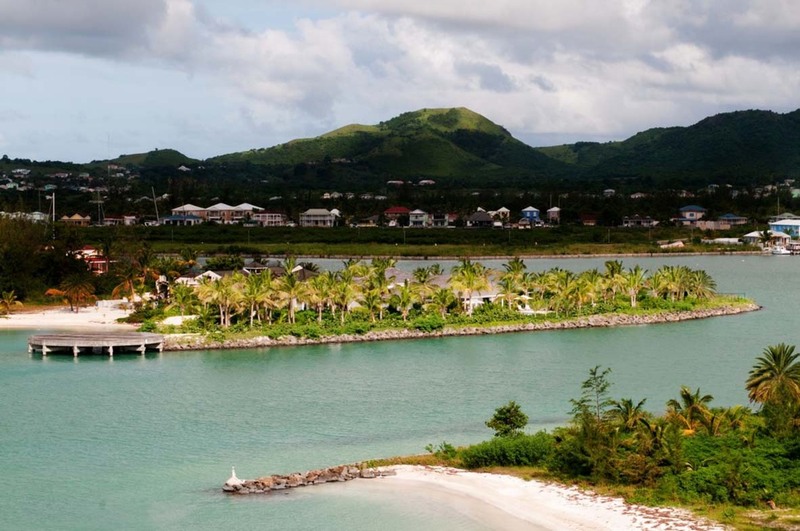 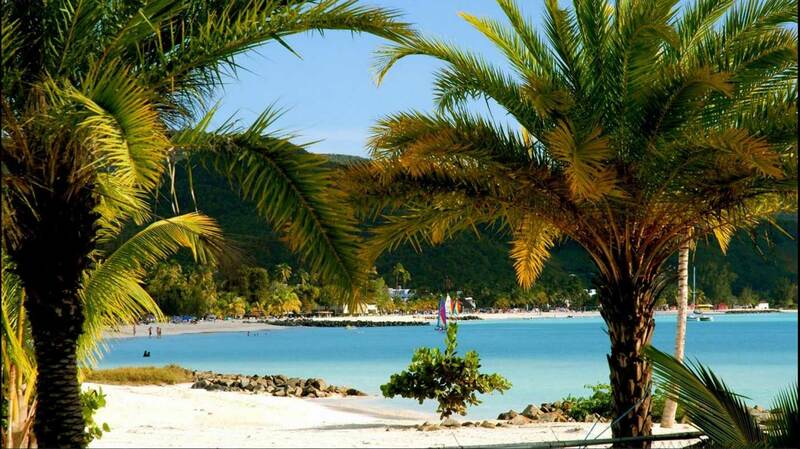 It's a terrific beach location and convenient for Jolly Harbour and the South West hub of Antigua. 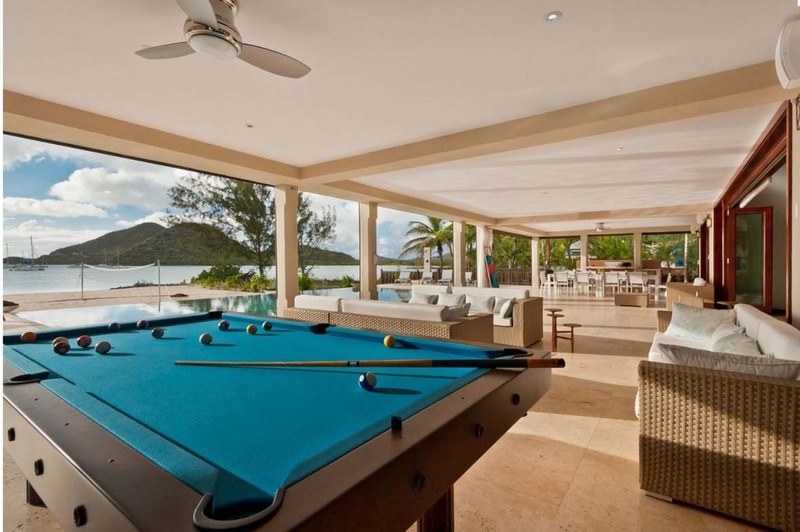 The pool is on the patio in front of the beach and everything is close by. 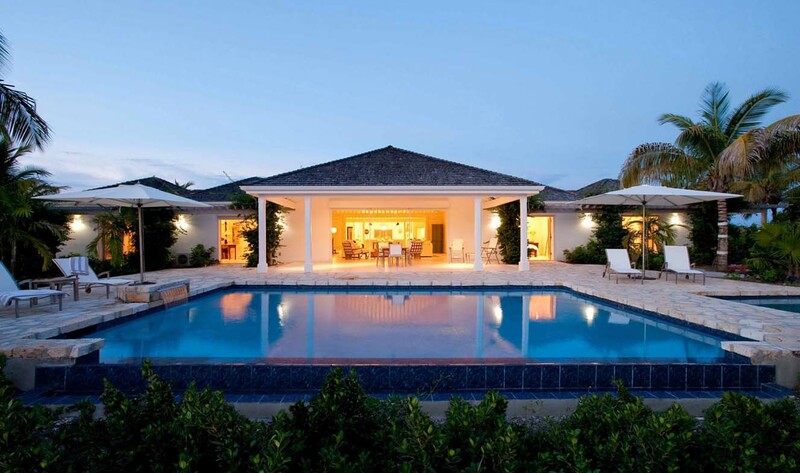 This is an ideal villa for many group sizes. 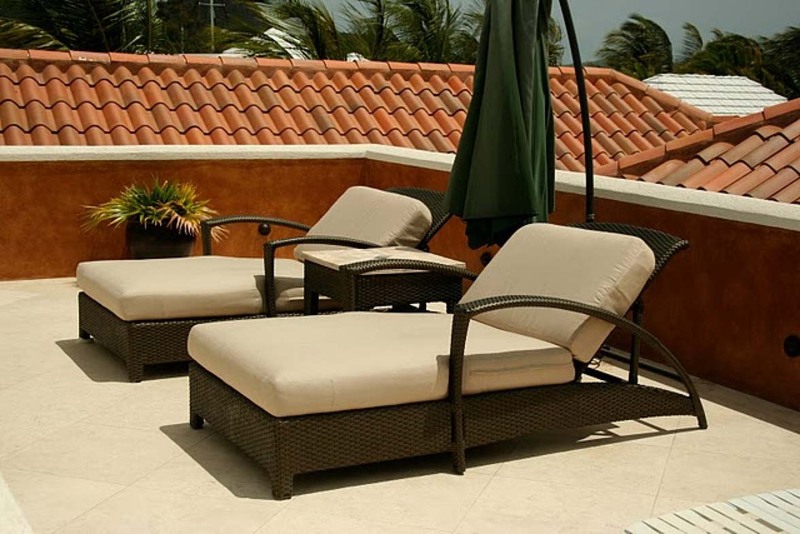 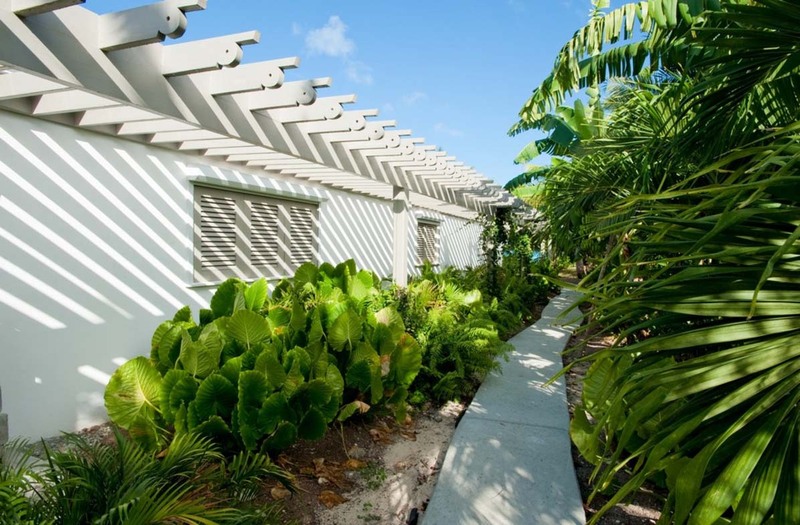 With secure parking, night watchman and concierge you will feel fully secure relaxing on your well earned vacation. 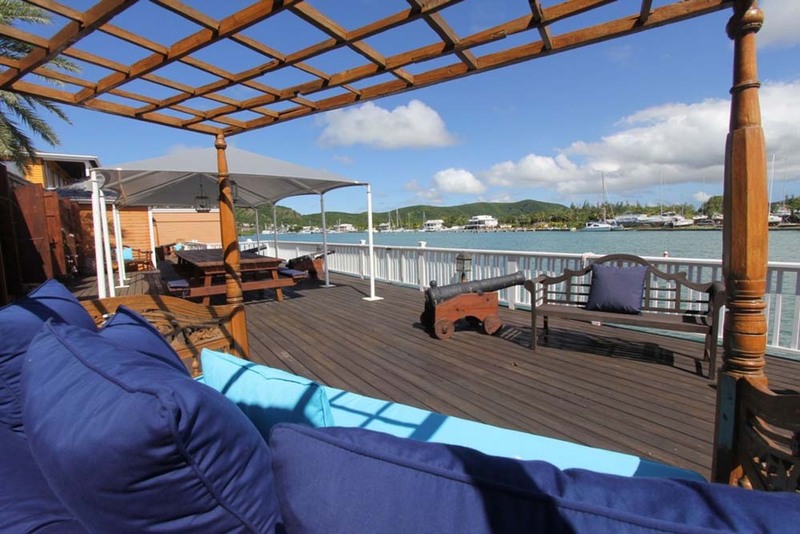 The seascape can be yours depending on availability for $15,000 USD per week. 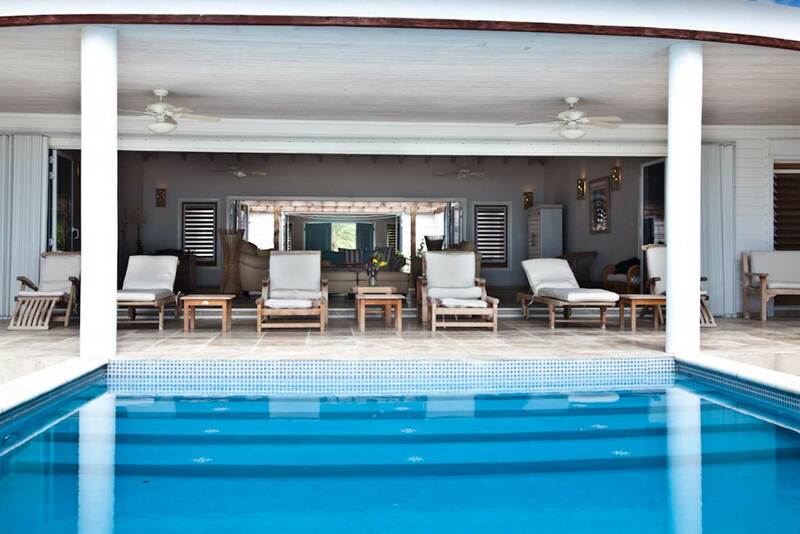 Contact us to see if we have availability and to enquire about special offers. 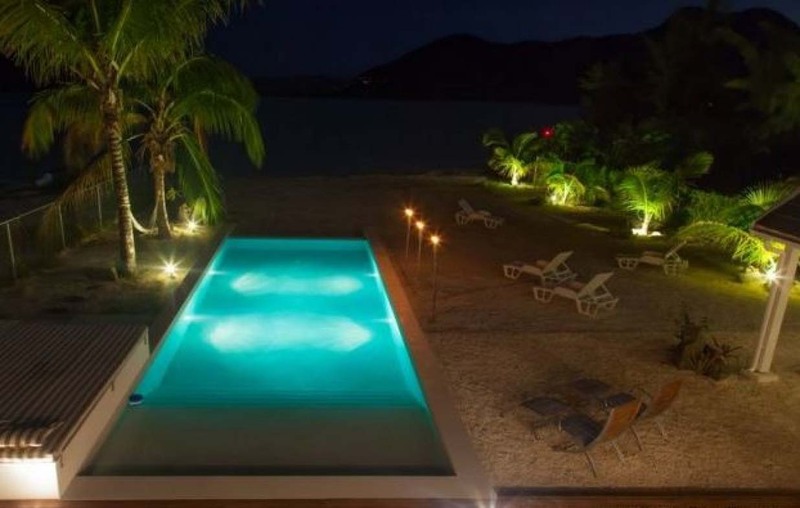 This villa was chosen for the location direct on one of the best beaches while at the same time demonstrating a level of quality and facilities to keep everyone happy. 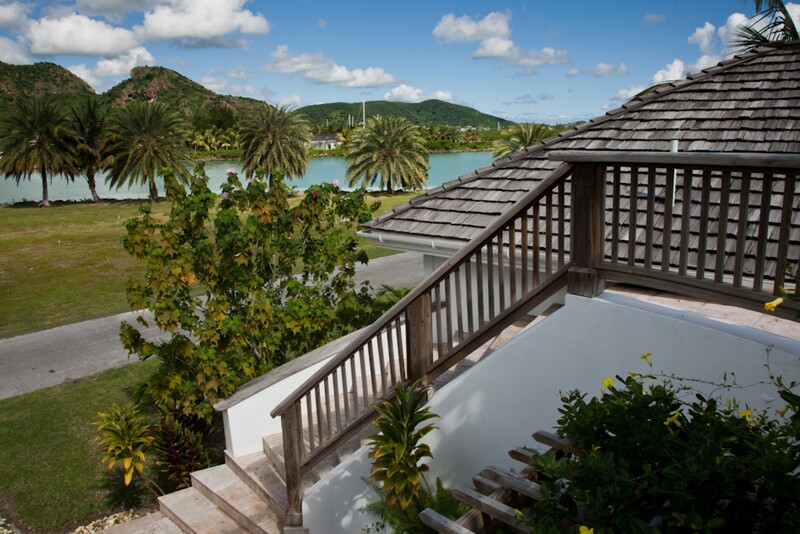 It's really good for families looking for the best in Antigua. 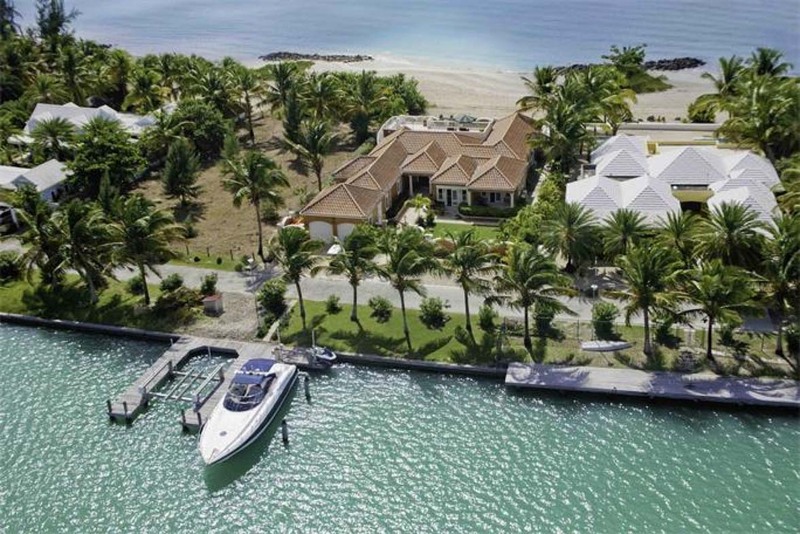 Secure parking and beach access. 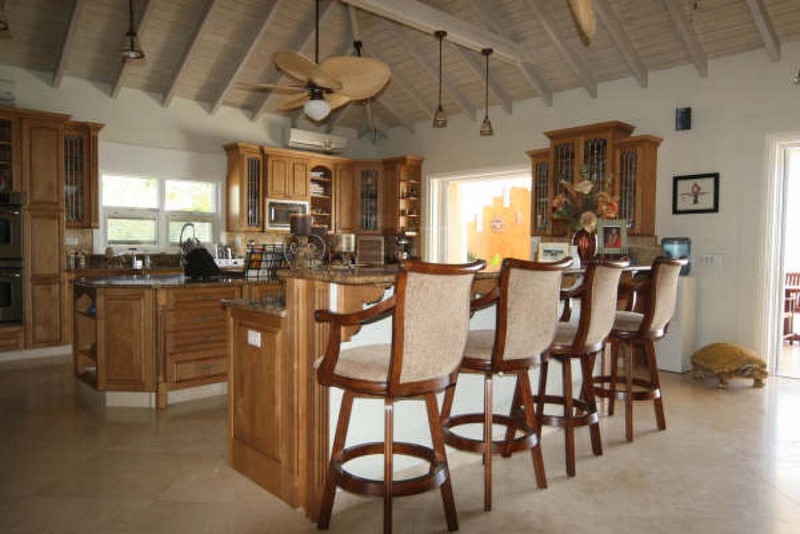 There are few properties that provide the privacy of North Finger in Jolly Harbour with the stunning facilities and space of this property. 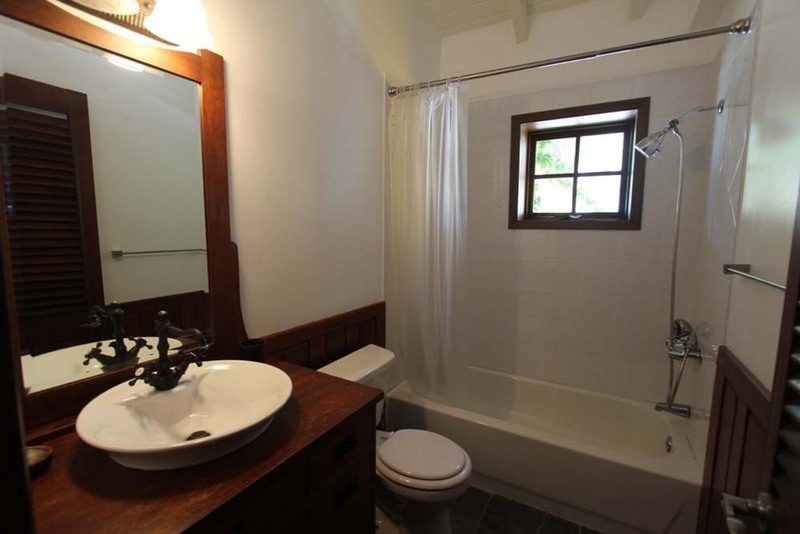 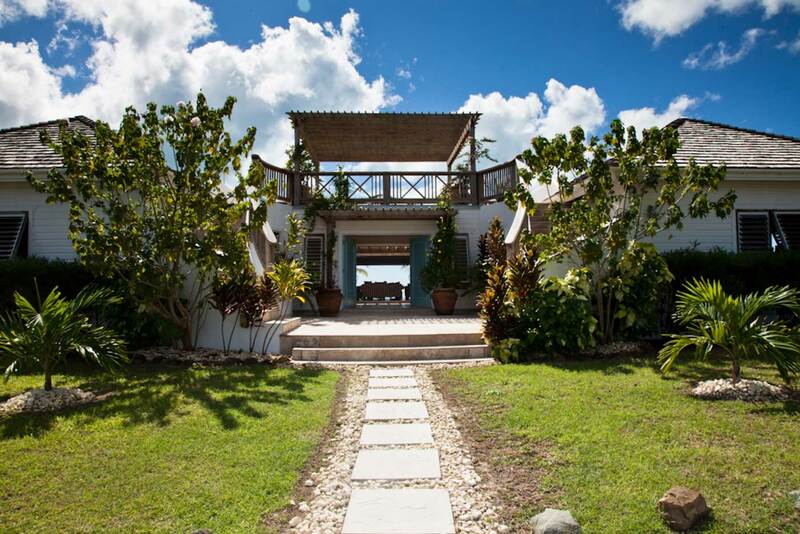 With a special option of an annexed round house this can be a fantastic property for your dream Antigua wedding with all the family in house. 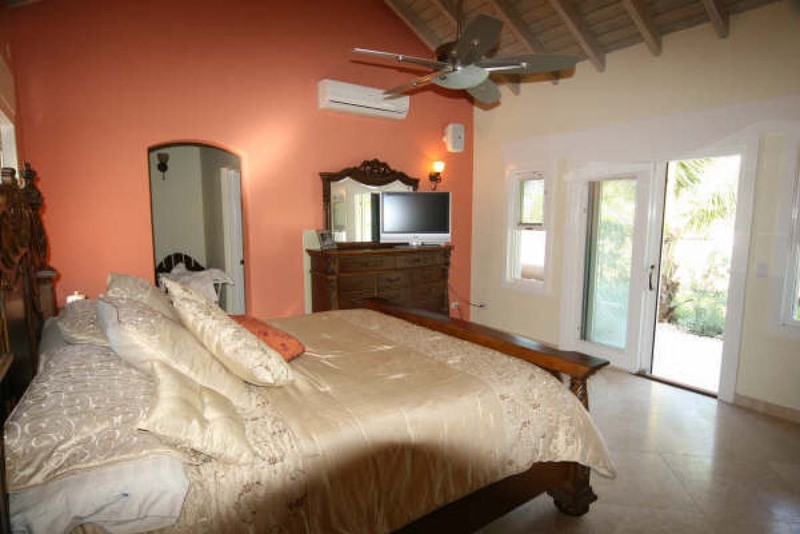 A comfortable 7 bedrooms allow your party of 14 the fun and relaxation you demand. 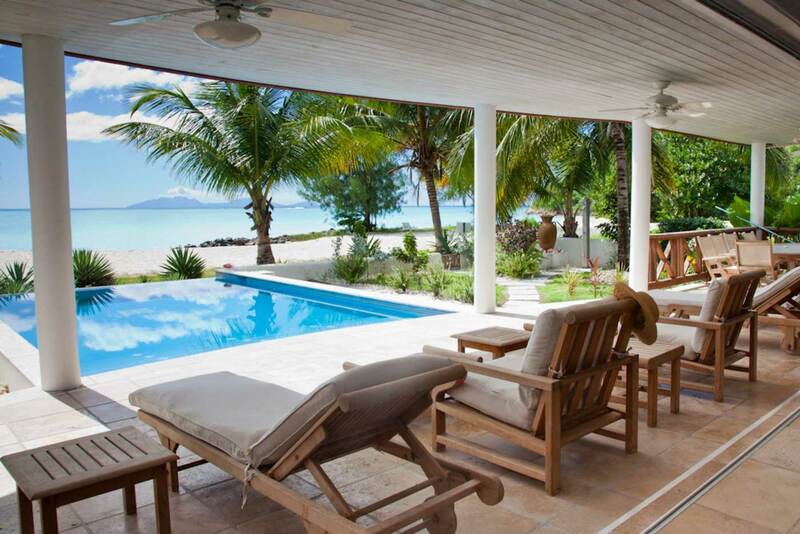 In the regular winter season this villa will cost you $36,750 USD per week, this drops to $26,250 in the summer. 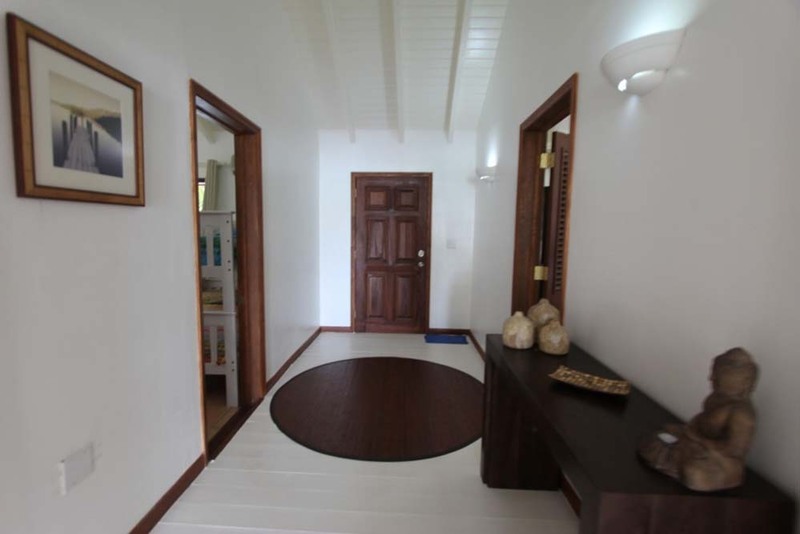 Please contact us with your special requirments. 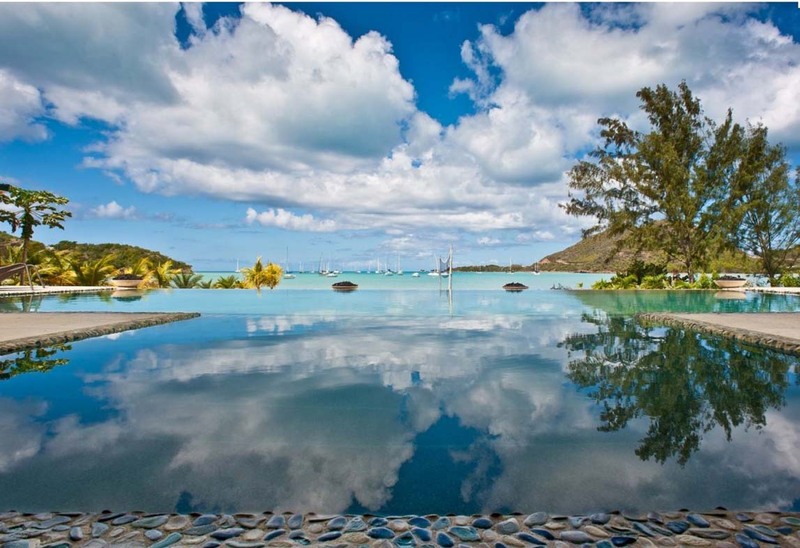 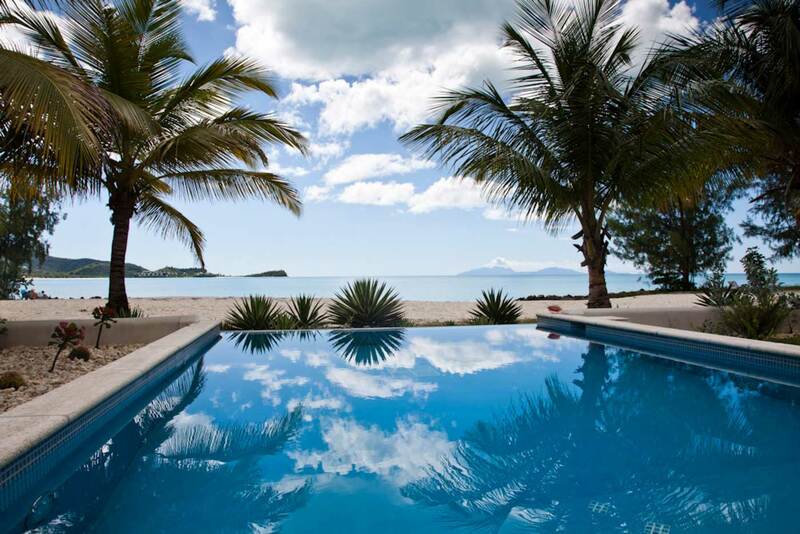 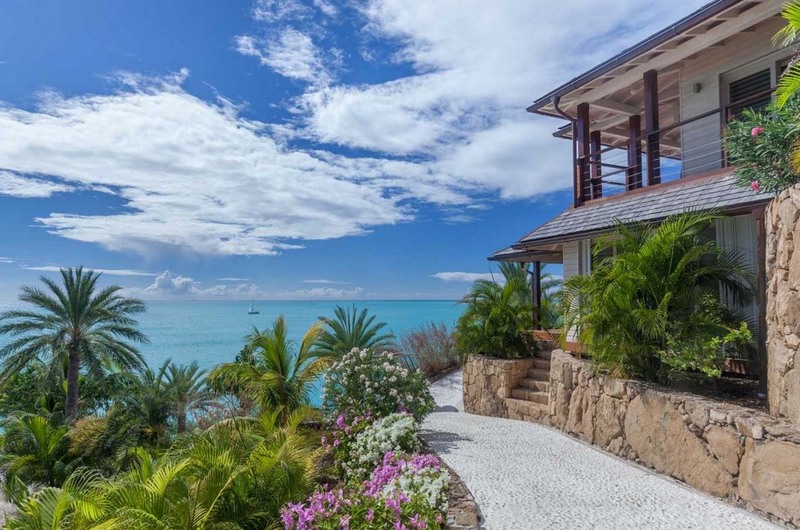 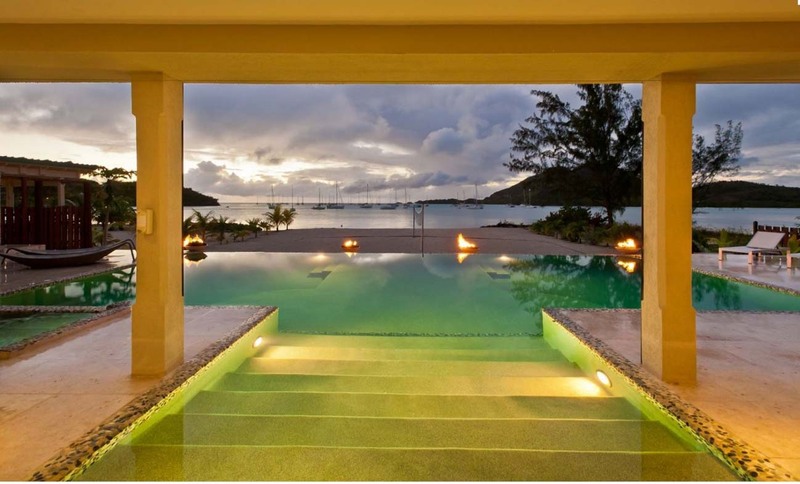 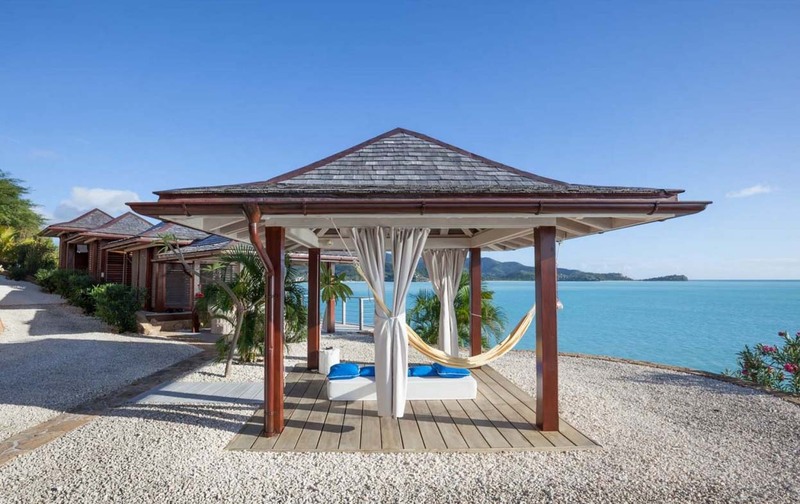 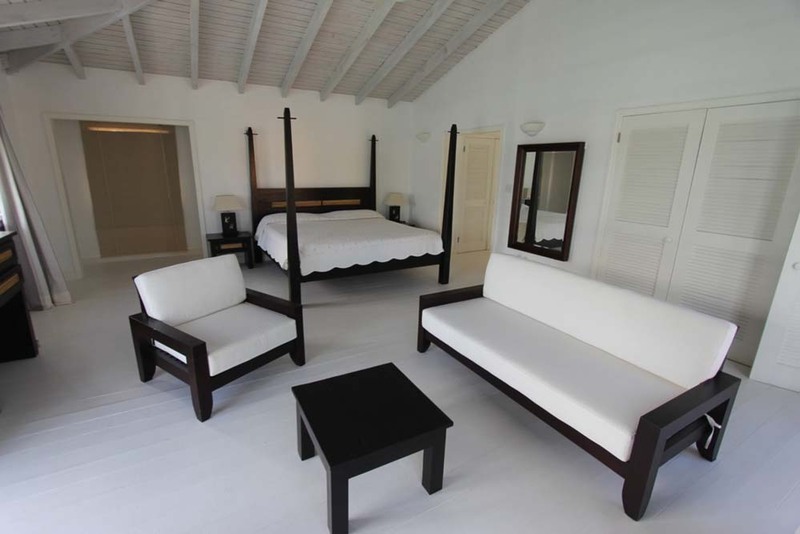 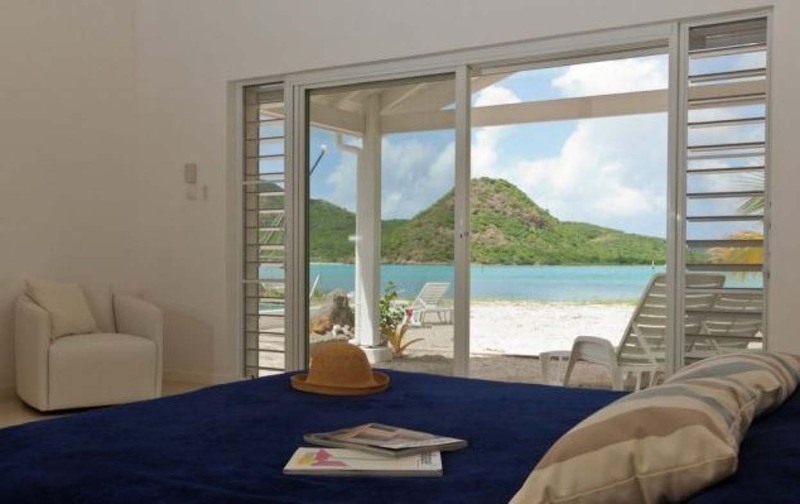 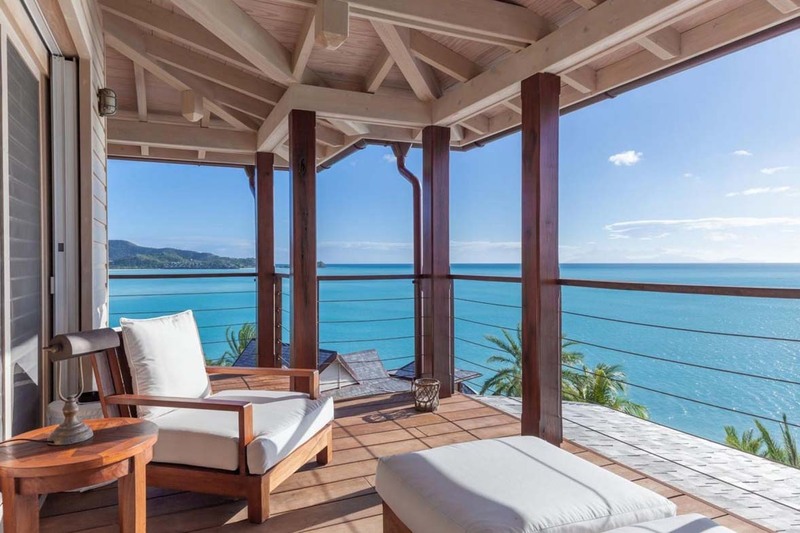 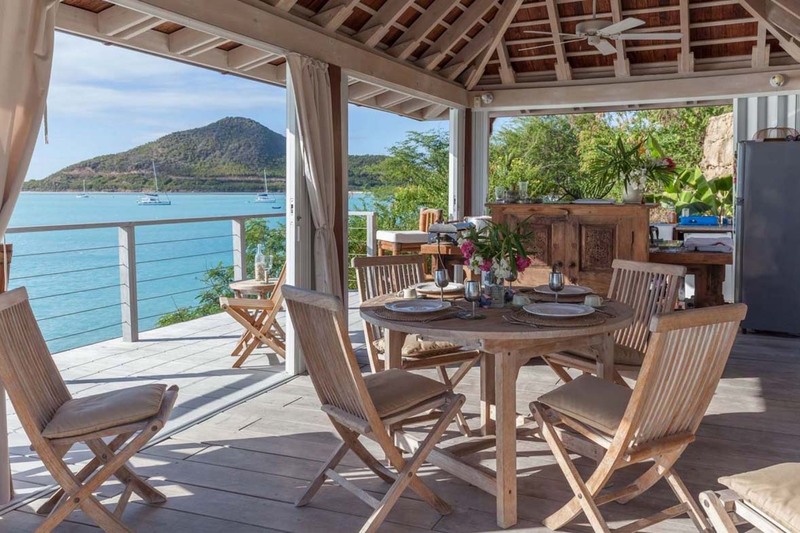 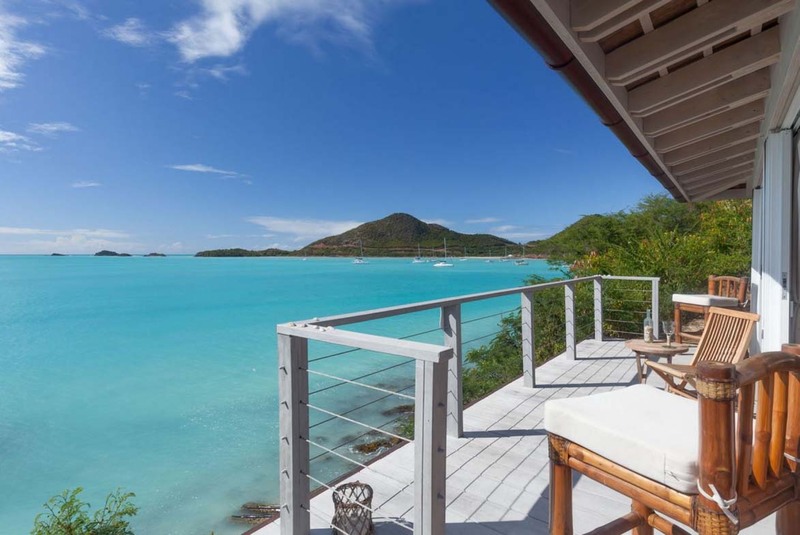 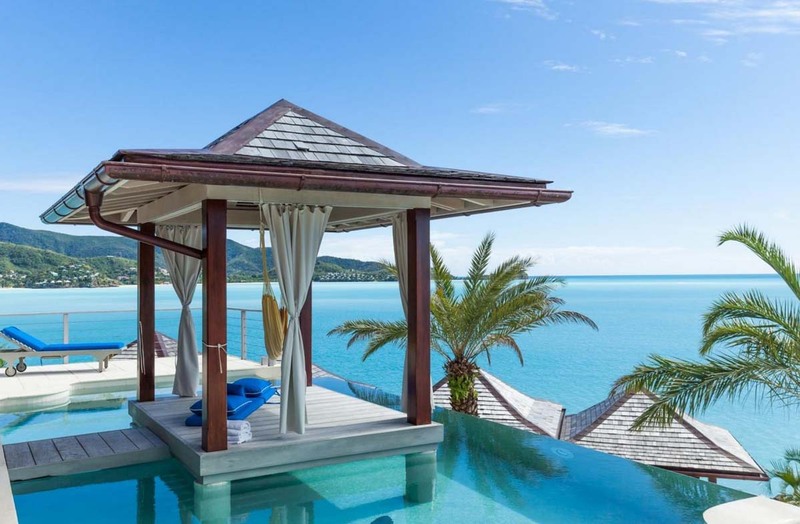 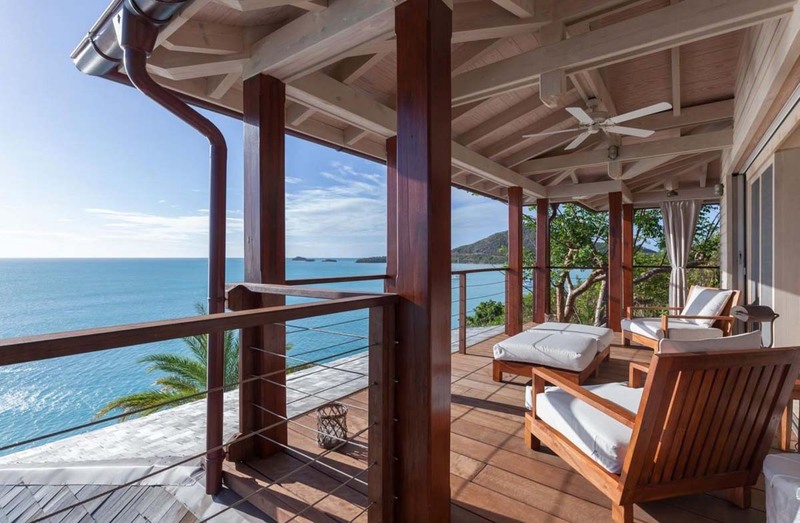 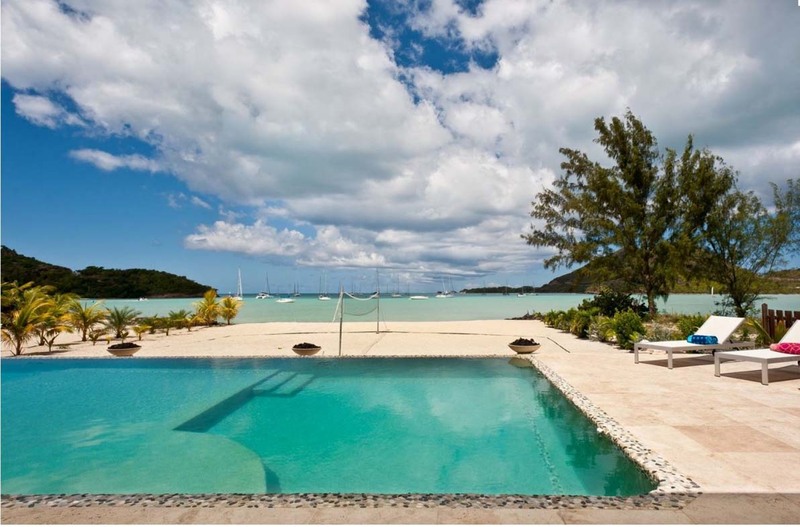 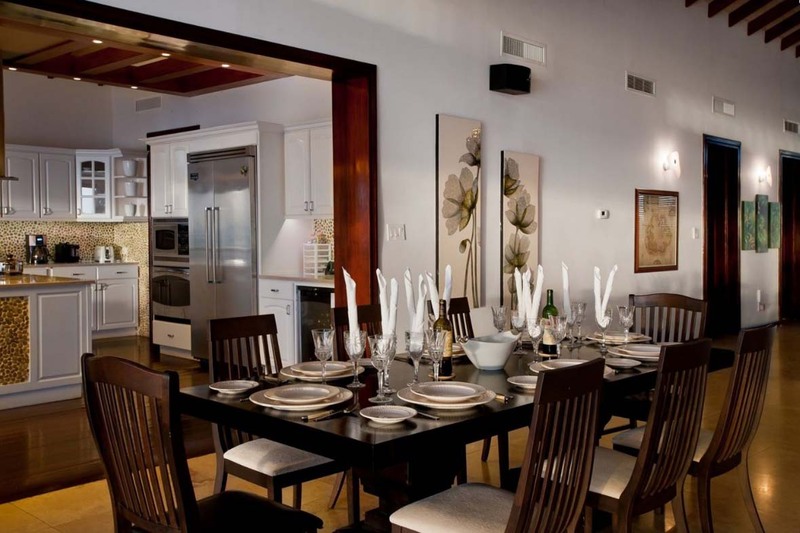 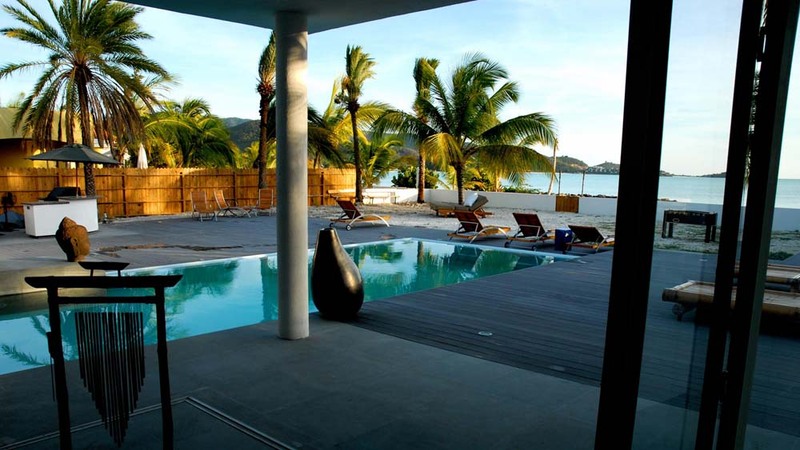 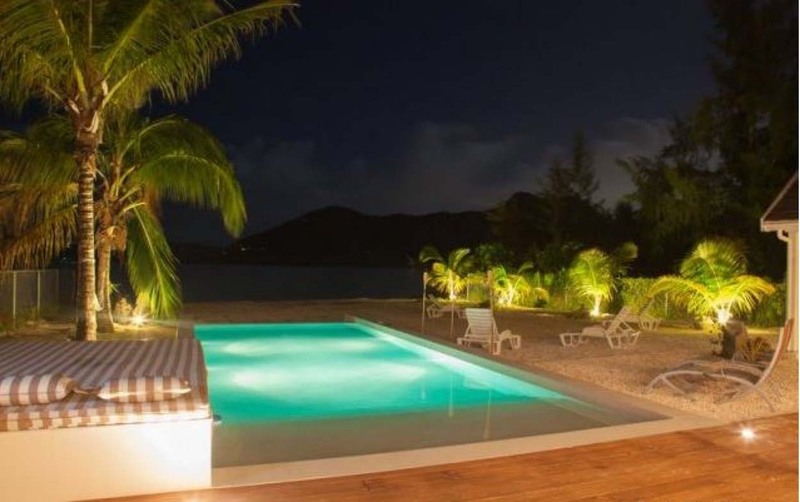 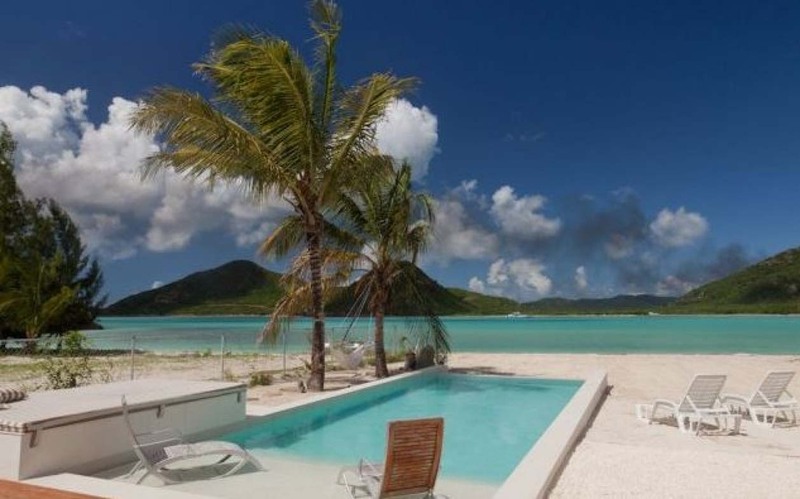 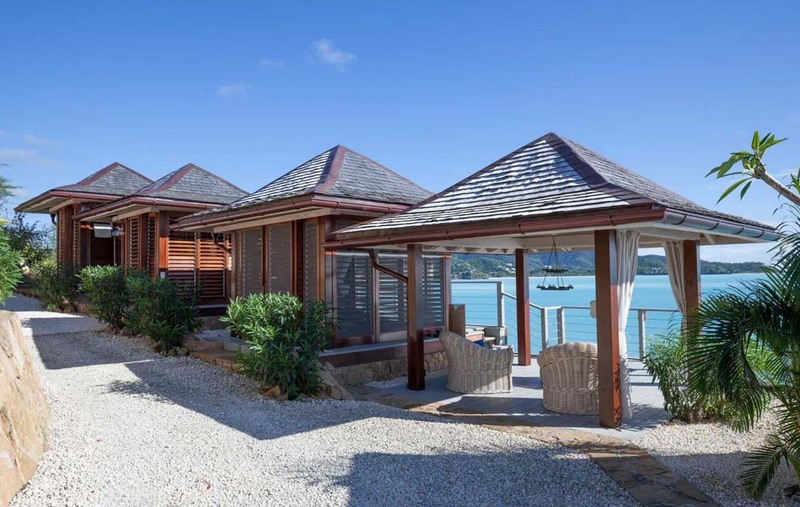 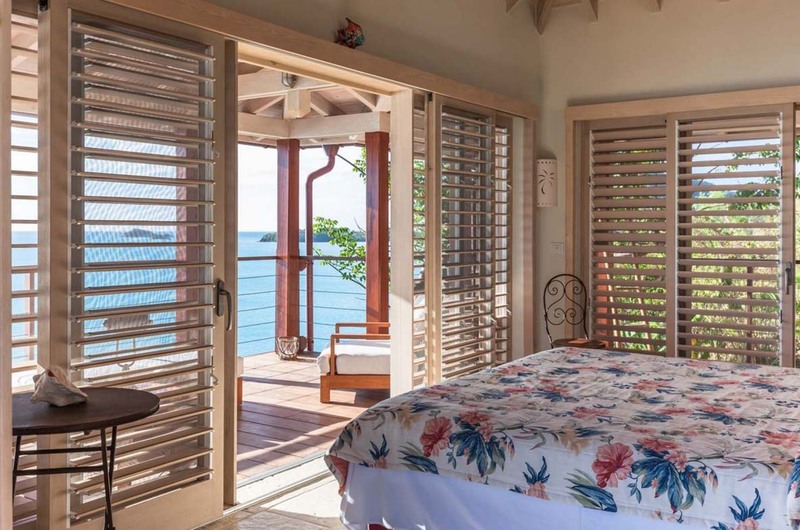 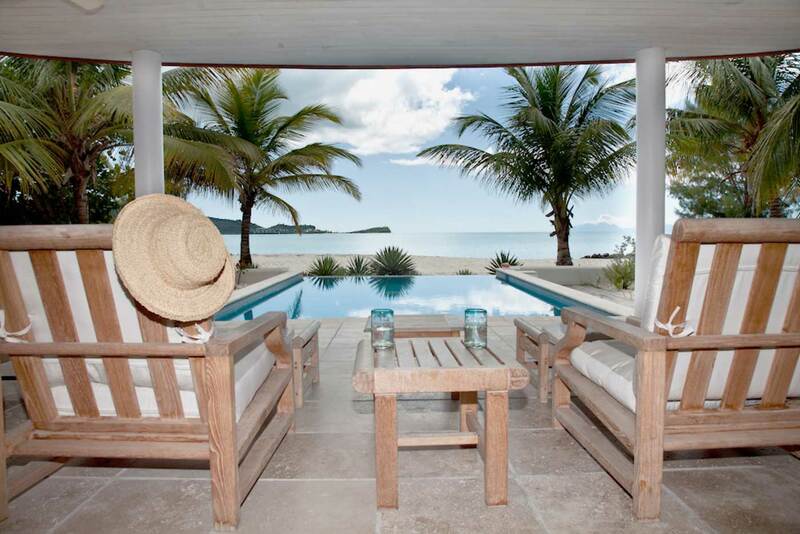 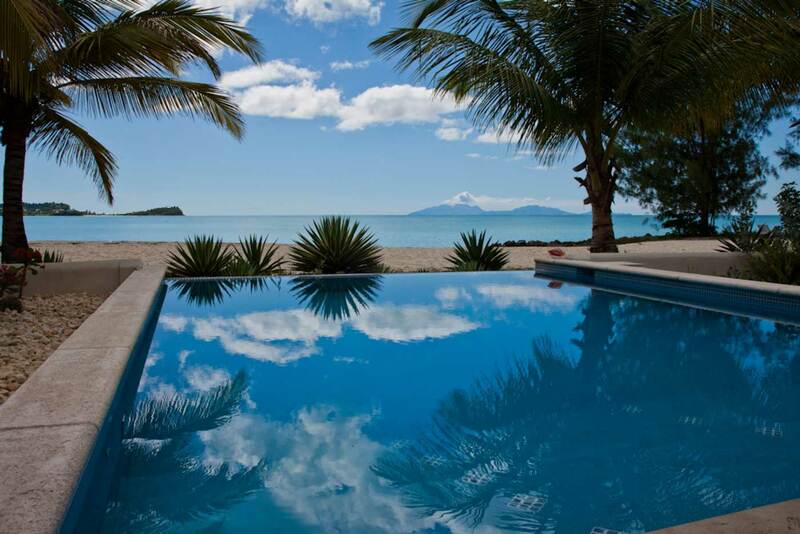 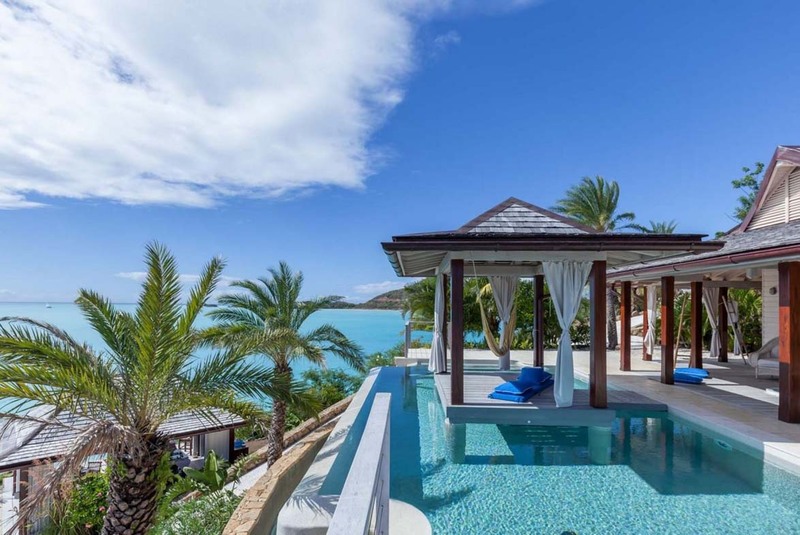 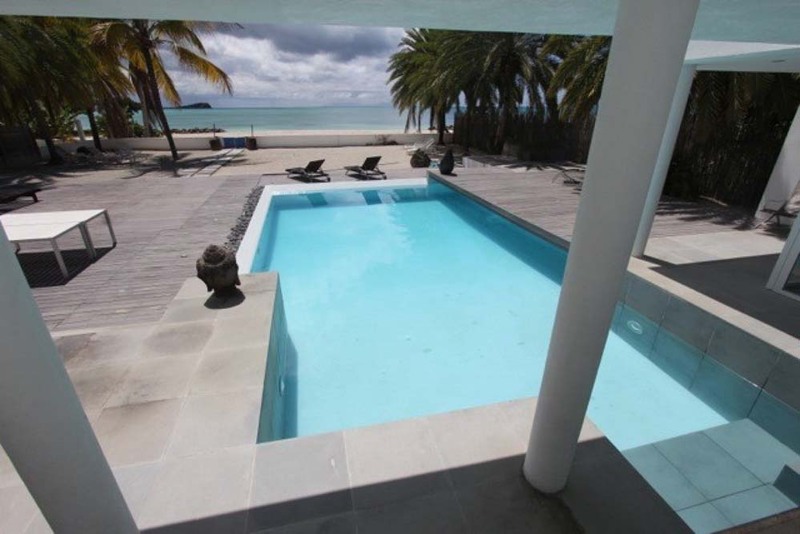 This is one of Antigua's best villas and you will have few choices like this island wide. 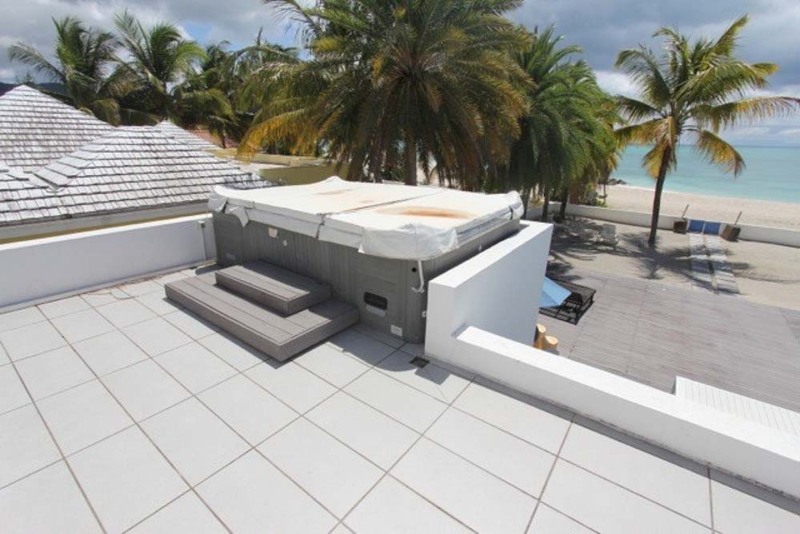 It has a fantastic capacity while still being right on the beach. 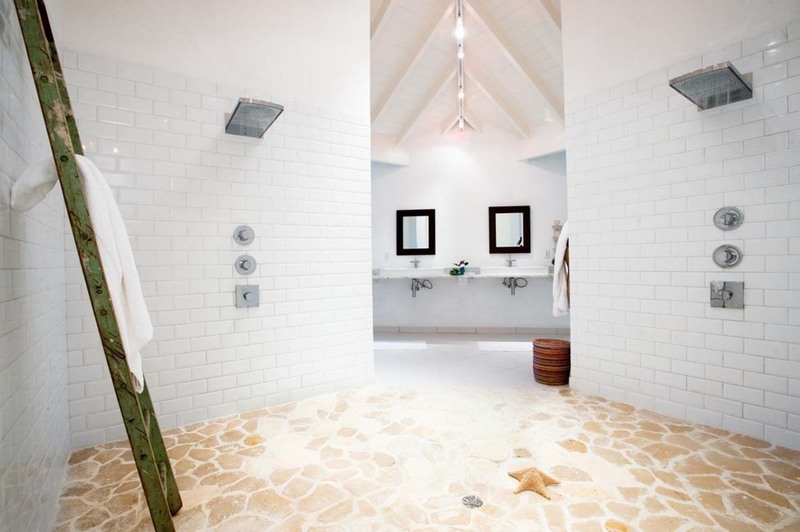 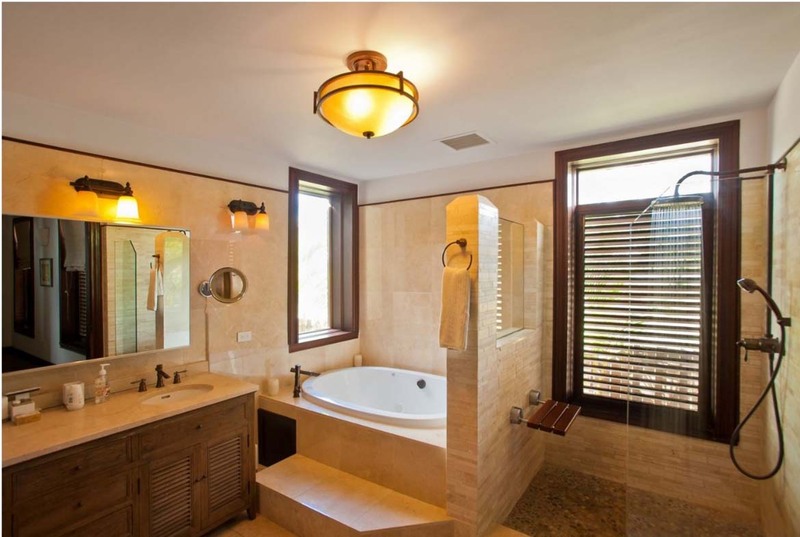 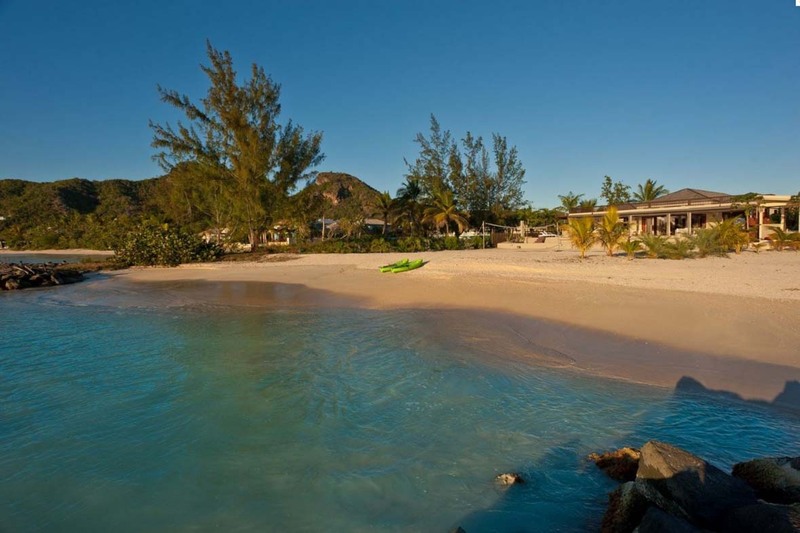 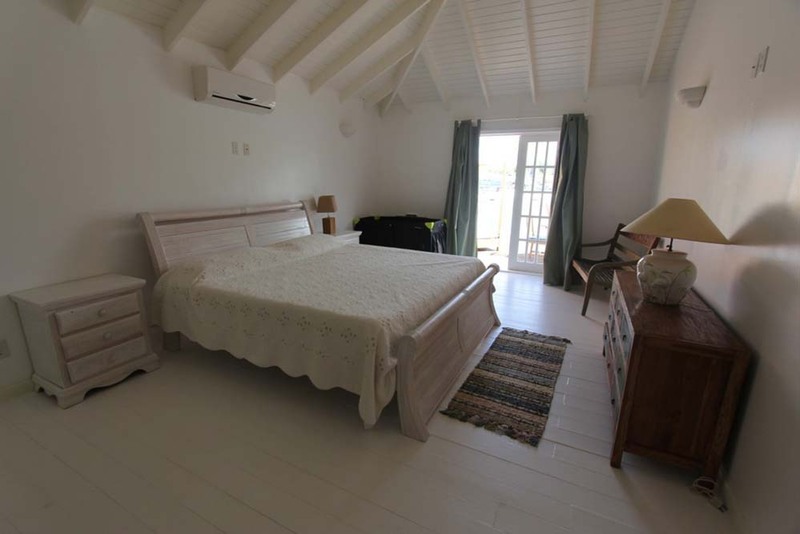 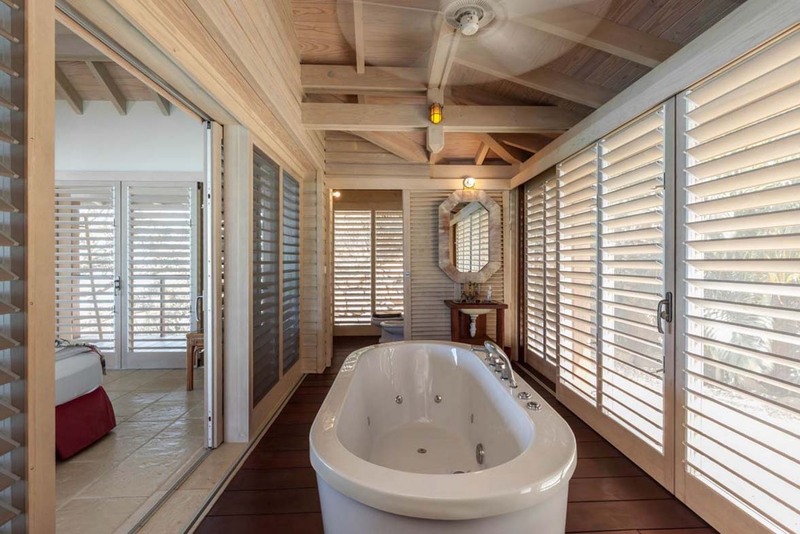 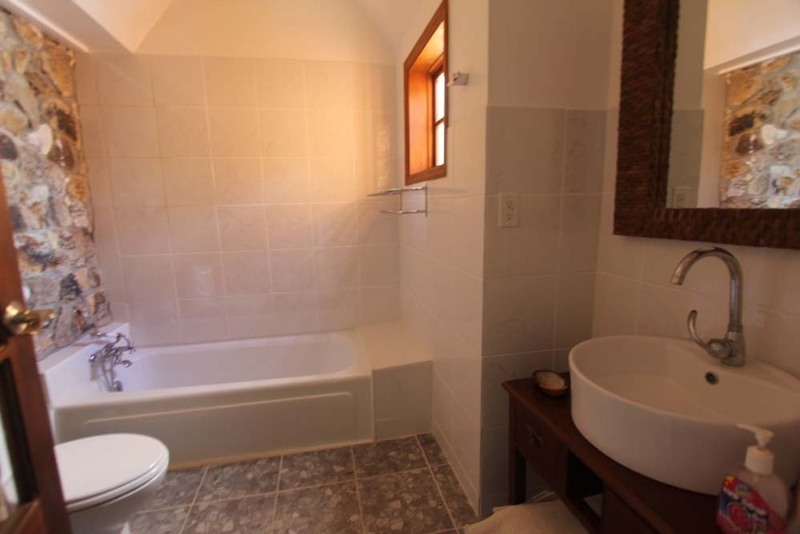 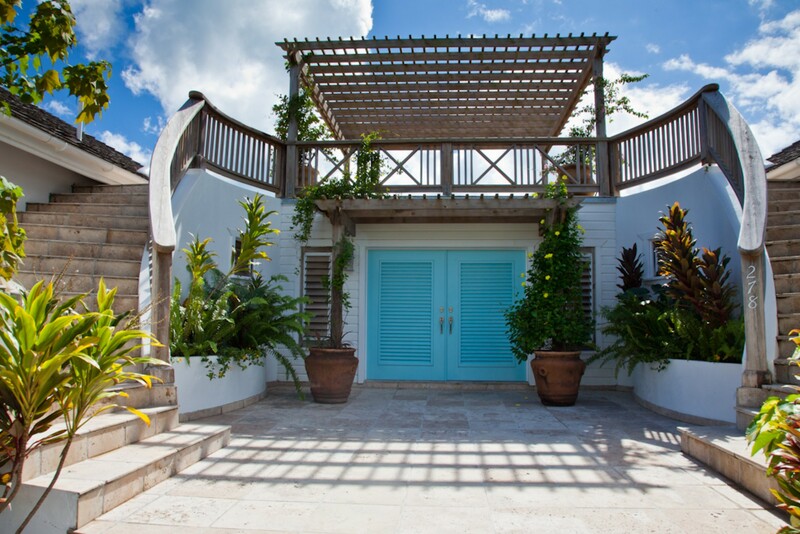 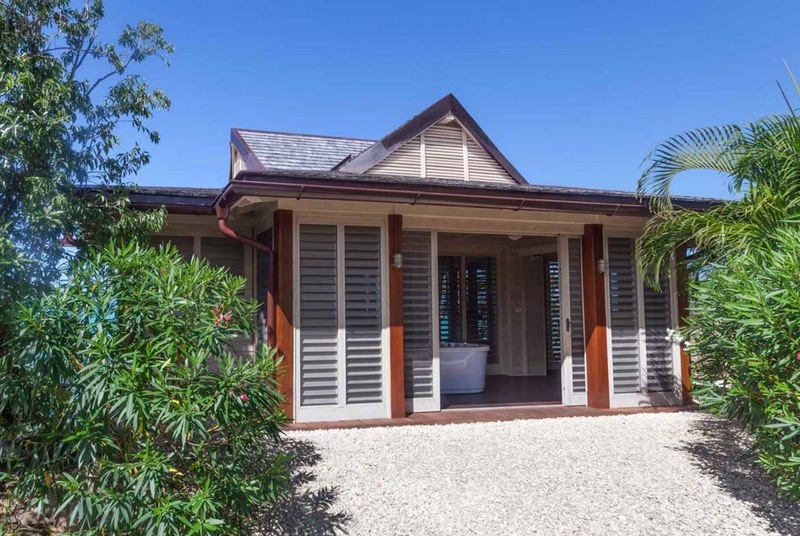 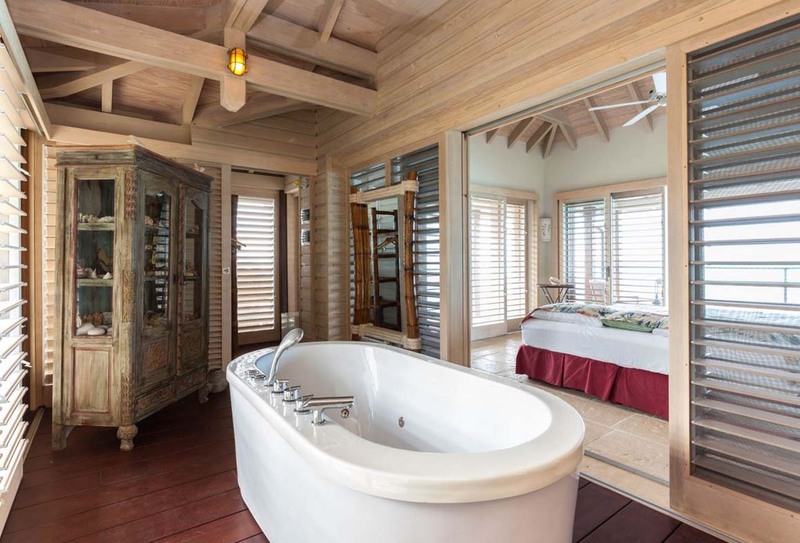 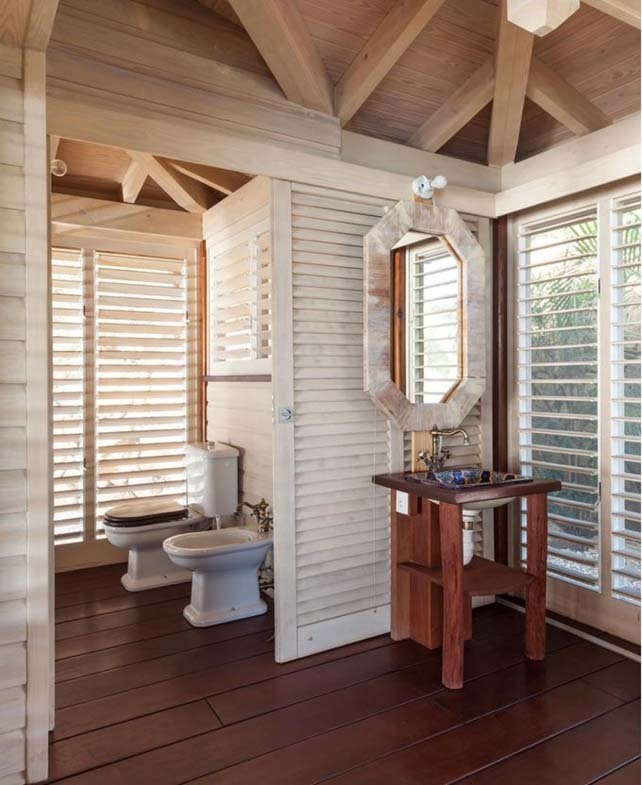 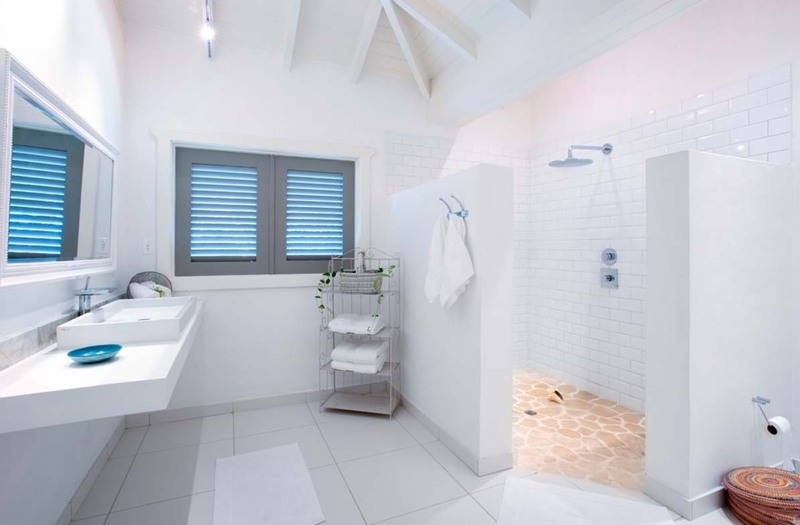 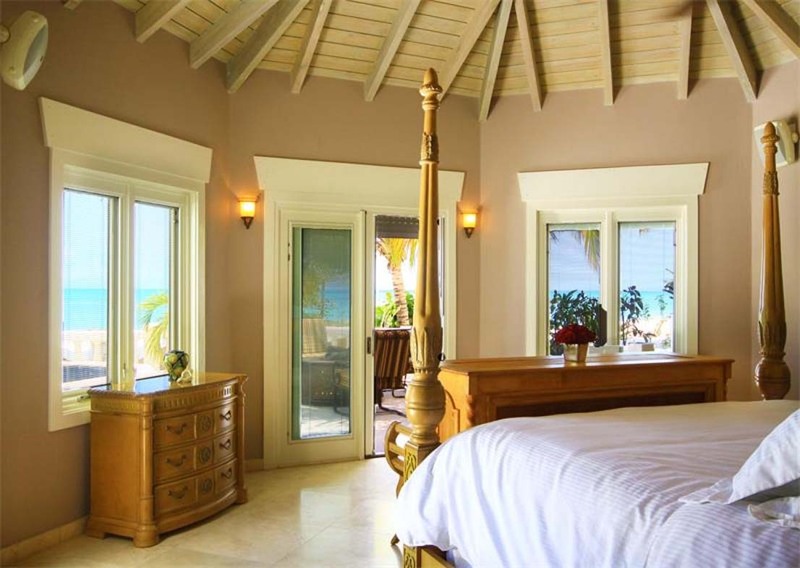 The privacy also is unparalleled with the beach being private and being inside the Jolly Harbour complex. 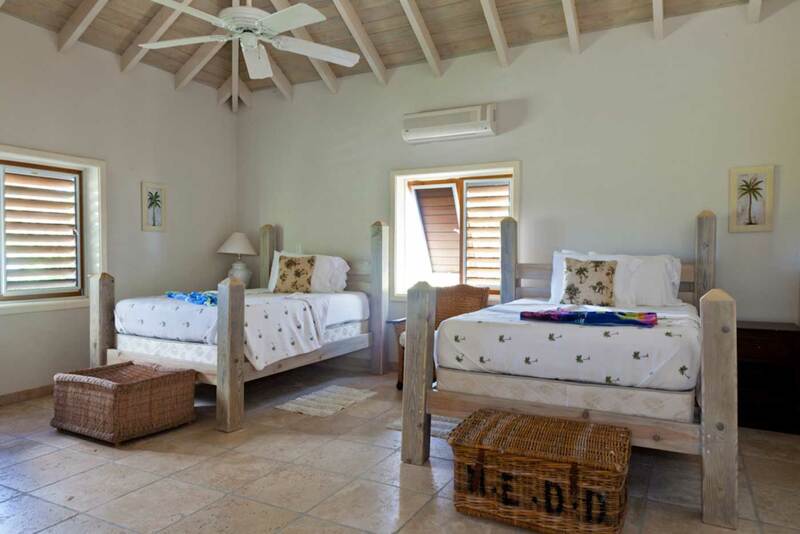 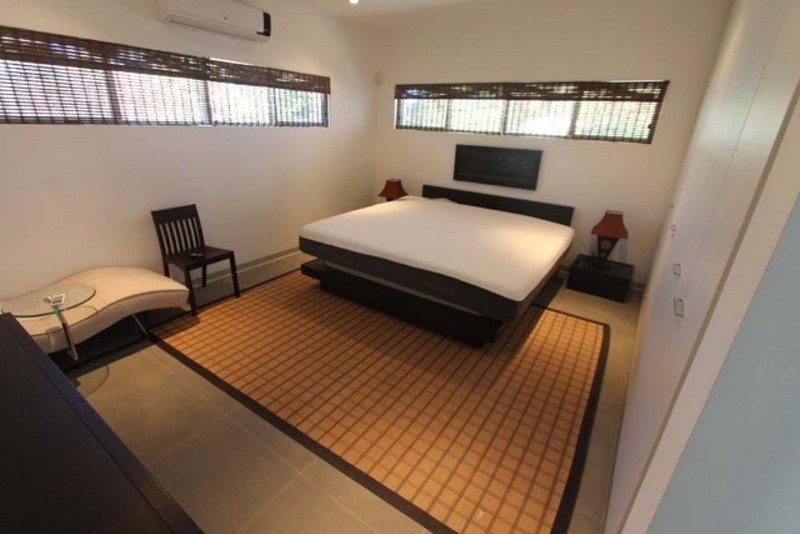 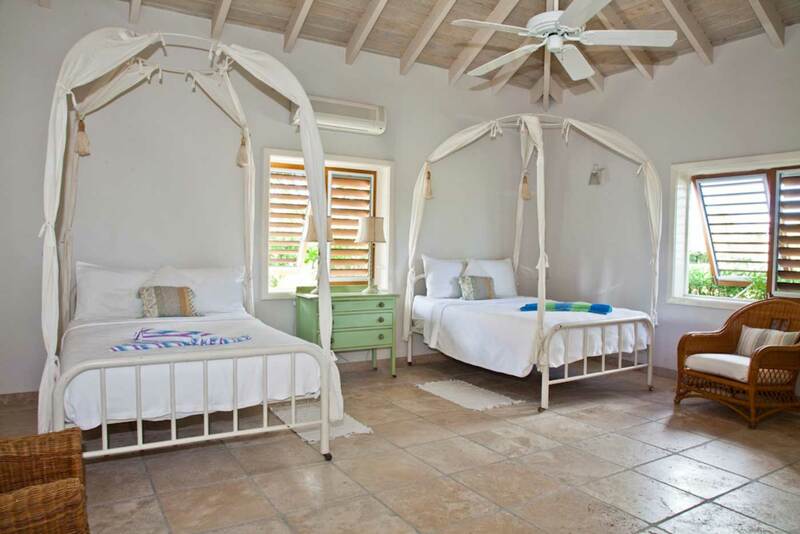 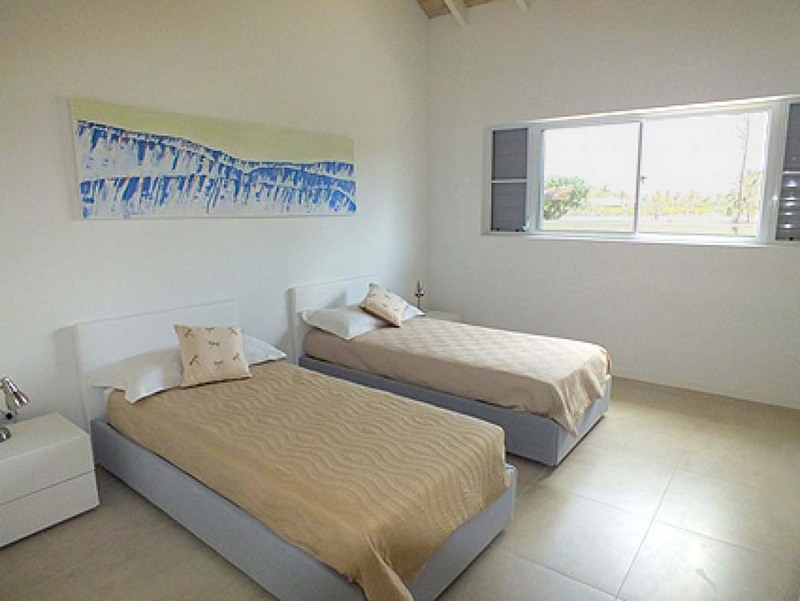 Three doubles and a twin provide sleeping in style at out of the blue, all have ensuite bathrooms so this can be a great property for a group of couples or family style arrangement. 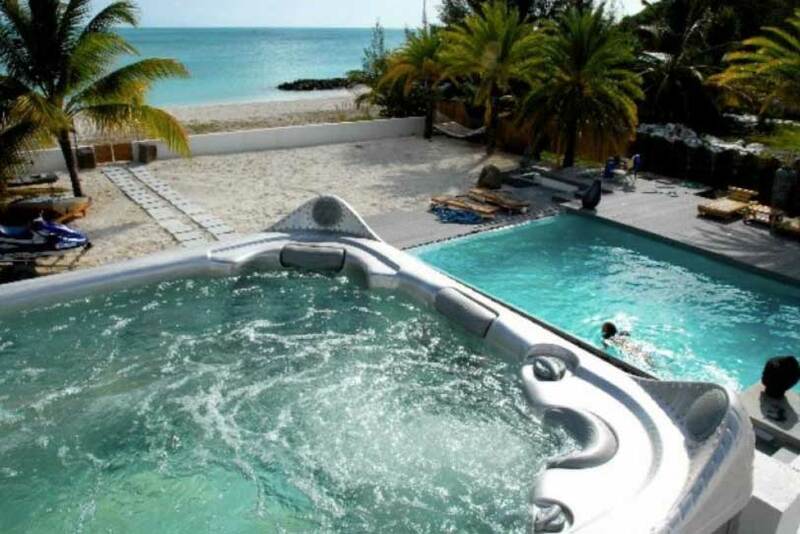 Suitable for wedding parties also. 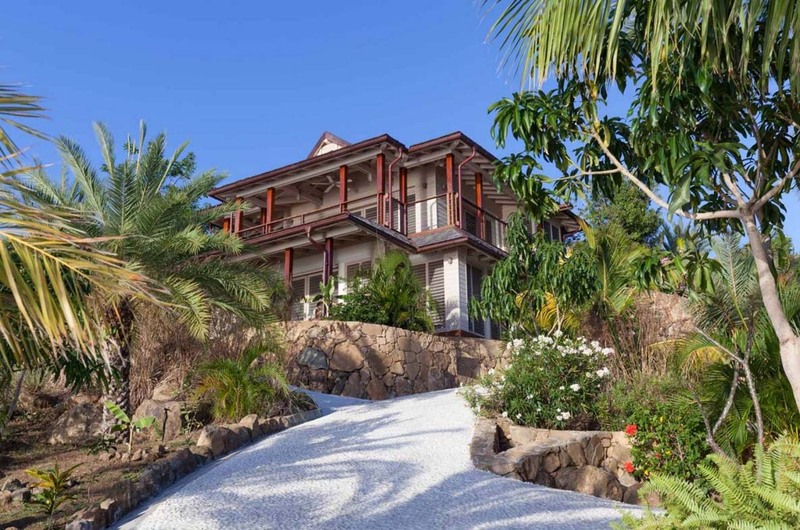 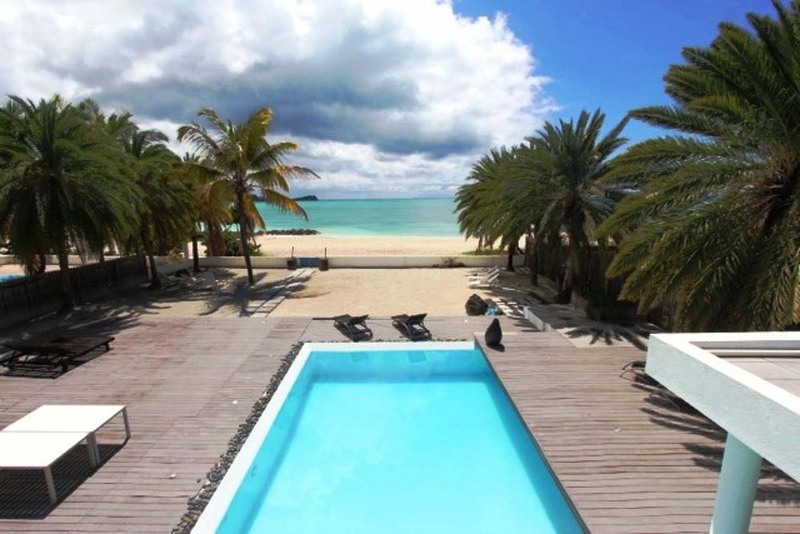 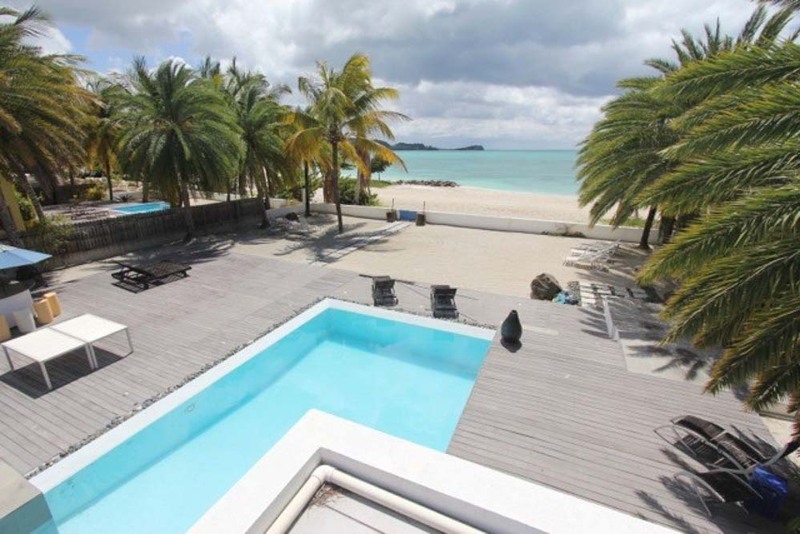 From $10,000 per week low season this can be split between 4 for 2,500 each making this a stunning beachside option. 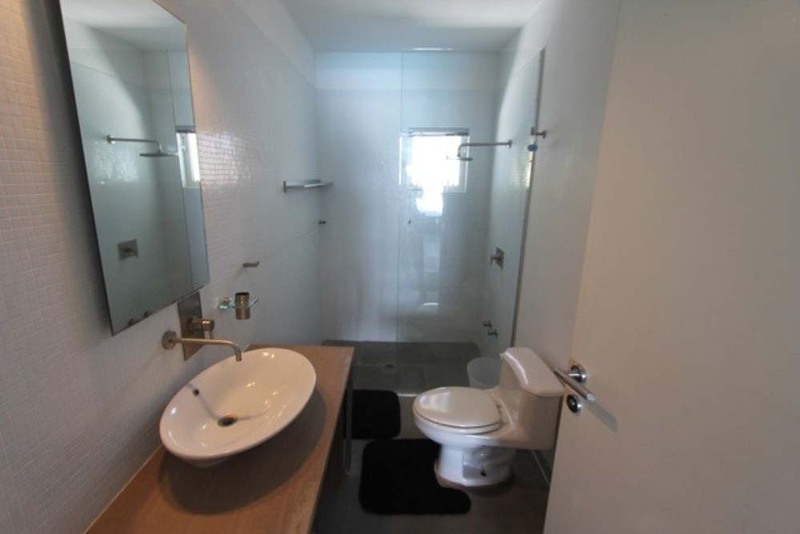 This represents great value. 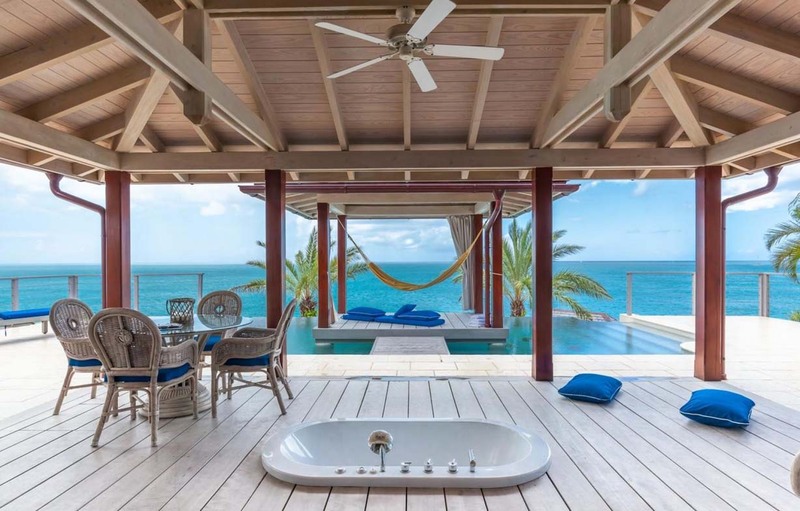 Editors choice for strinking a wonderful price point that in the highest season doubles to around 19,000 per week with differing rates between. 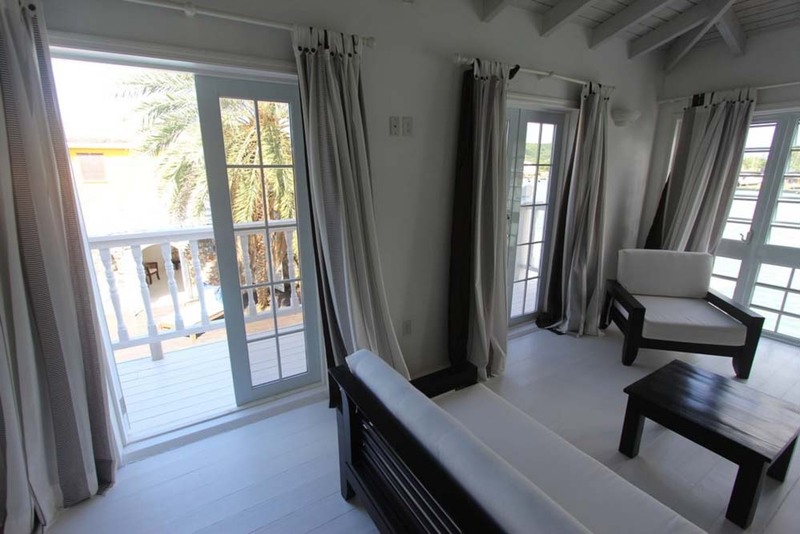 Balcony / Deck, Ceiling Fans, Electronic Security, Garden, Garden View, Gas Grill, Gated Entrance, Ice Maker, Panoramic Views, Parking, Pool, Private Location, Private Terrace, Safe, Safes In All Bedrooms, Security, Terrace, Wifi. 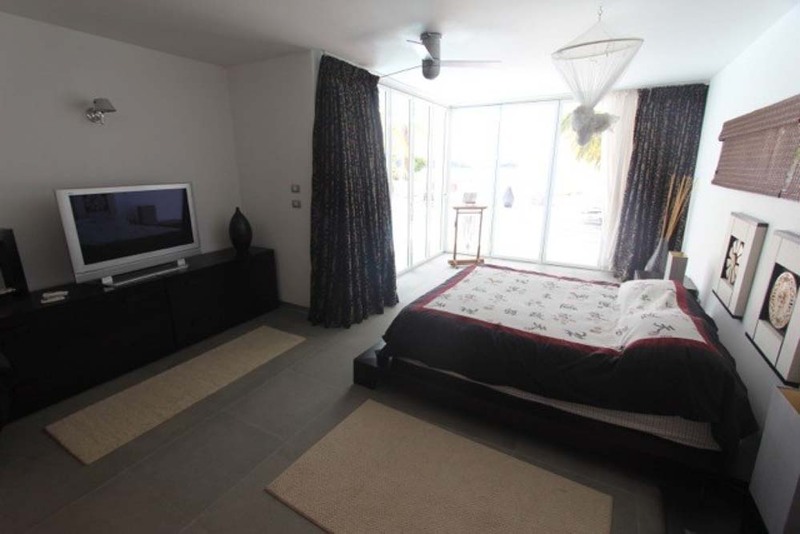 Air conditioning, All Bedrooms air conditioned, All Bedrooms En Suite, Blender, CD Player, Coffee Maker, Dishwasher, DVD Player, Freezer, Iron and Board, Luxury Finishes, Microwave, Phone, Safe, TV, Washing Machine. 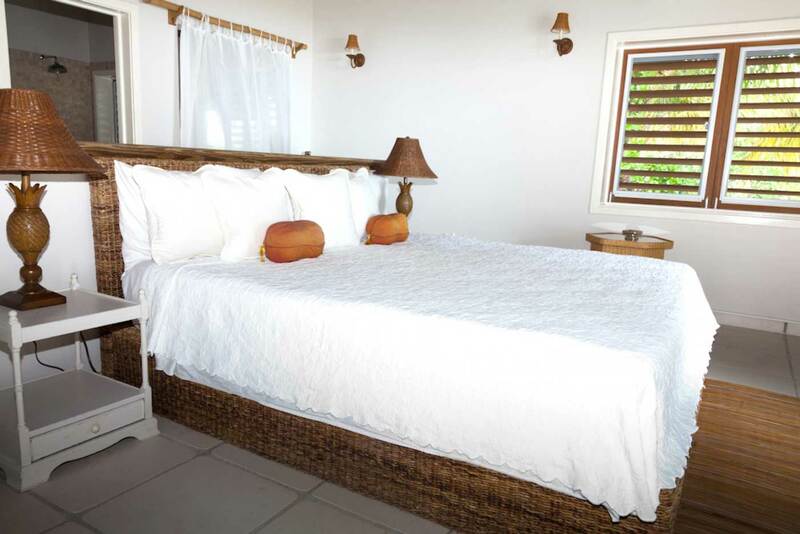 Cleaning inclusive, Concierge Service, Linen provided, Maid service, Towels provided. 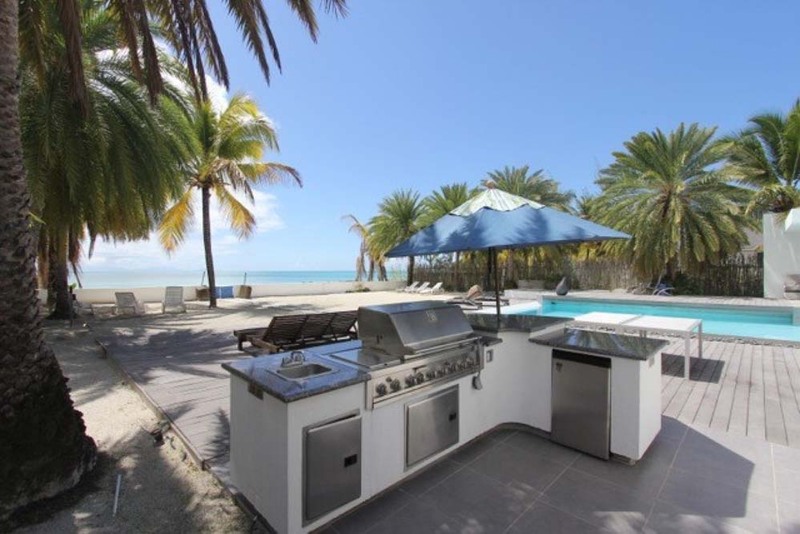 Bbq, Beach Access, Beach Front, Enclosed Garden, Ocean Front, Parking, Private Terrace, Restaurants nearby, Sea Views, Sun Loungers, Sun Umbrellas, Swimming pool, Water sports equipment Services Cleaning inclusive, Concierge Service, Linen provided, Maid service, Towels provided. 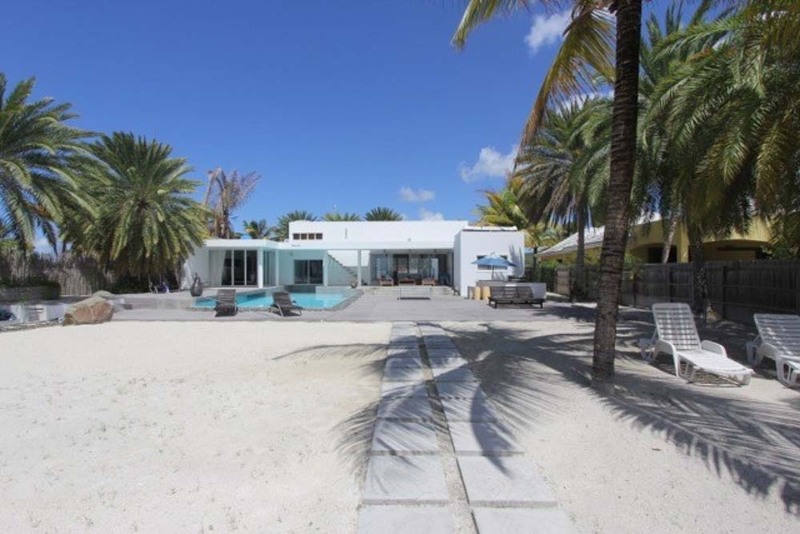 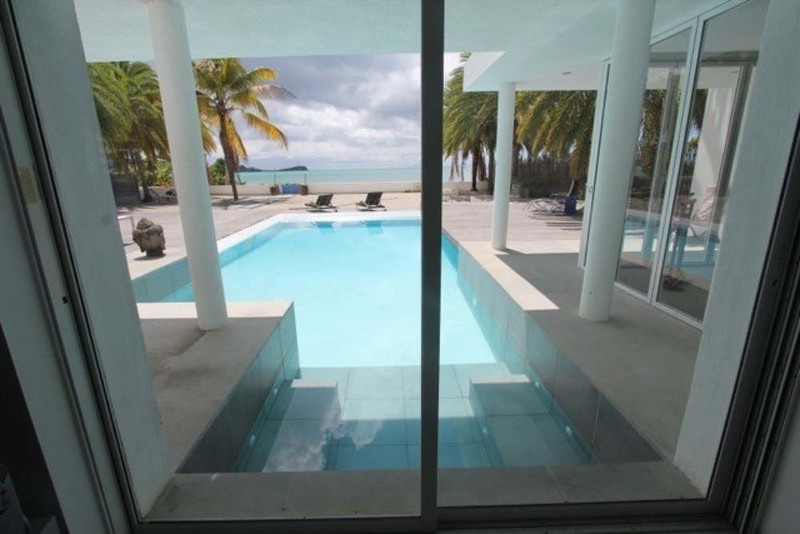 Access to South Beach is via the rear of this villa. 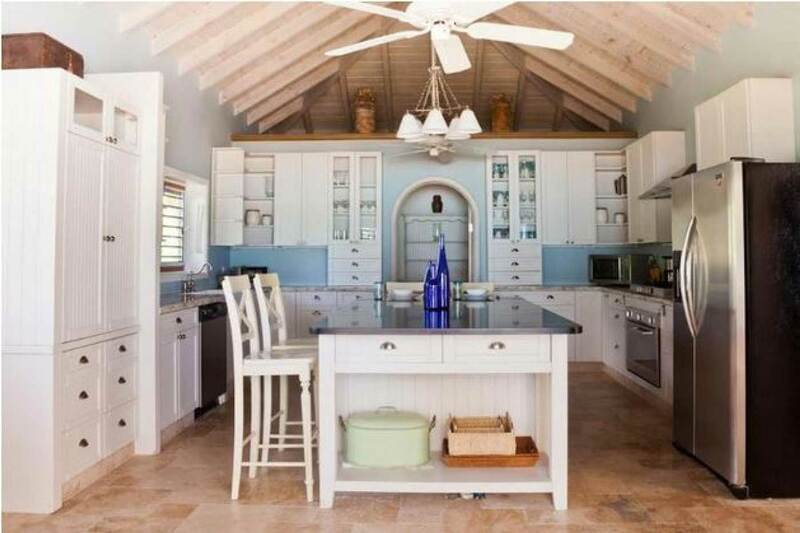 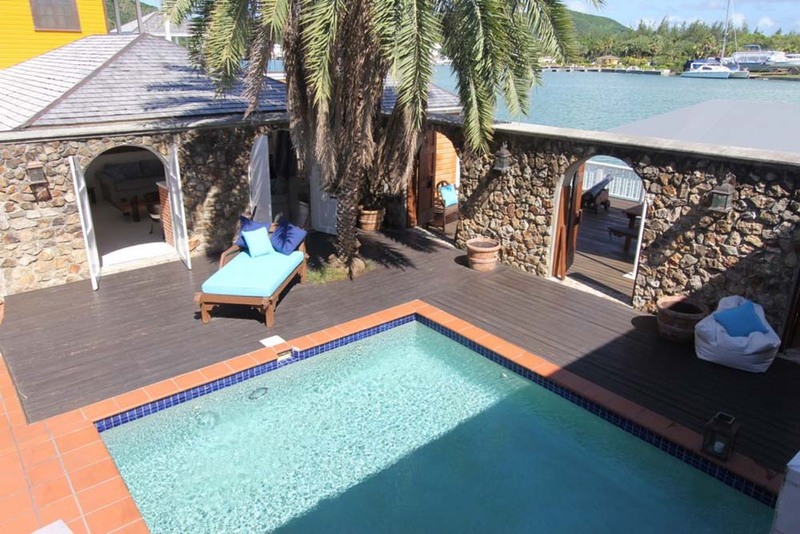 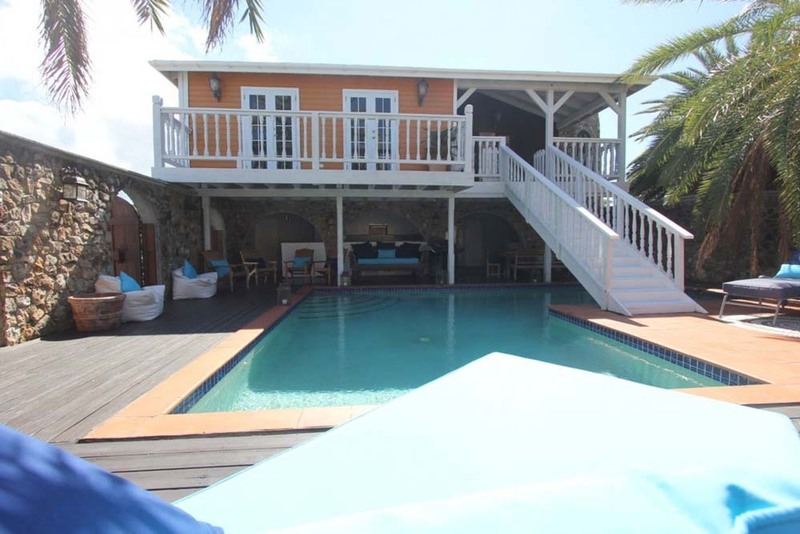 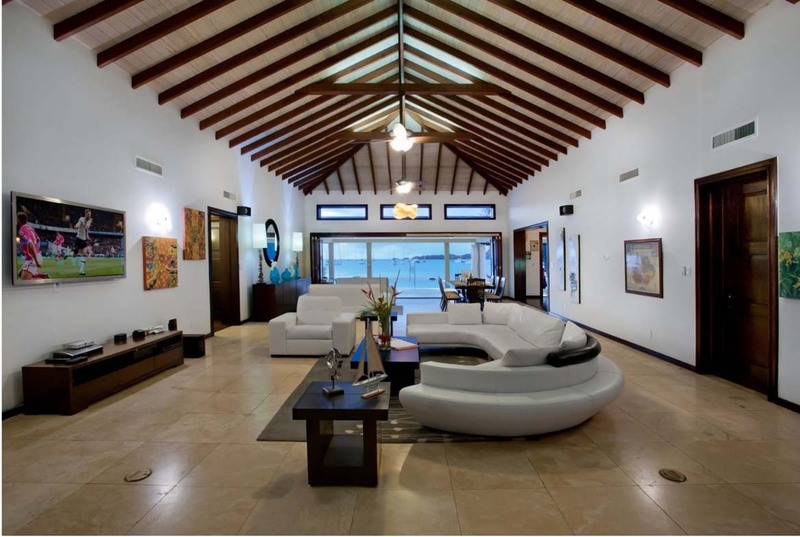 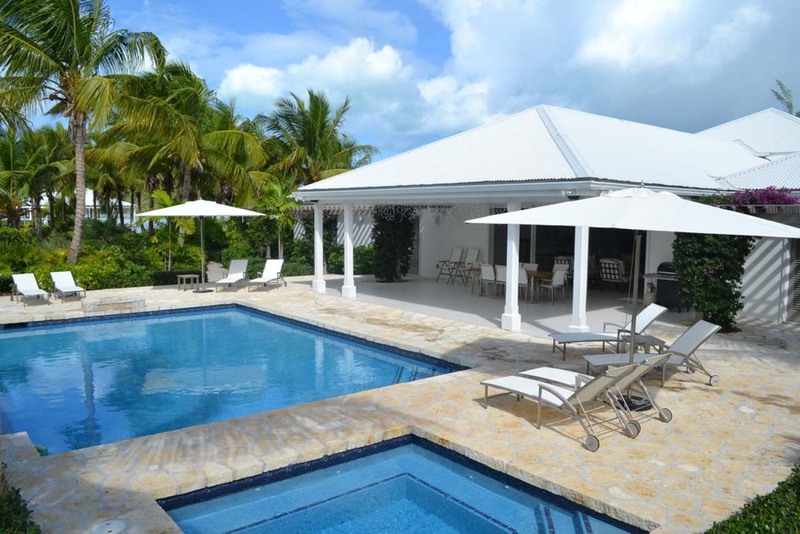 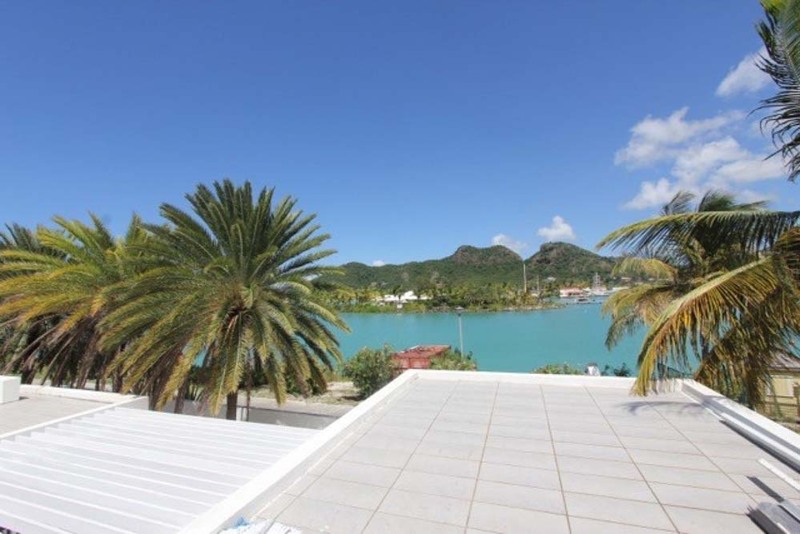 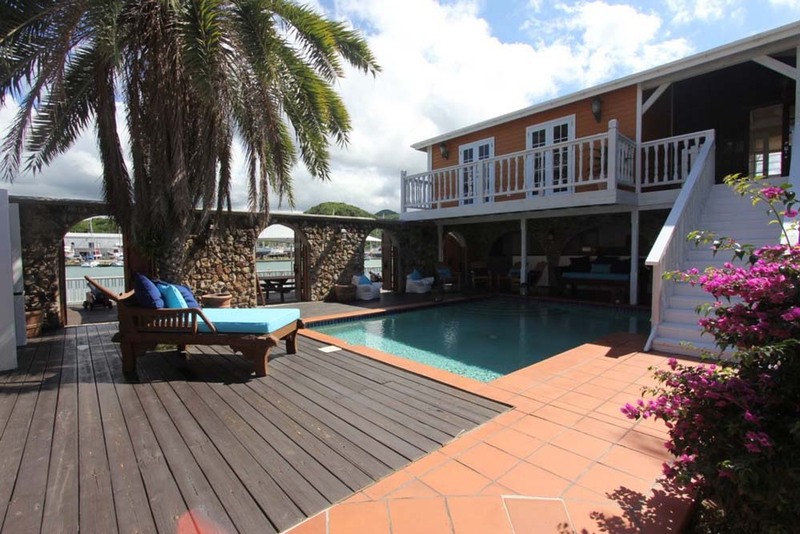 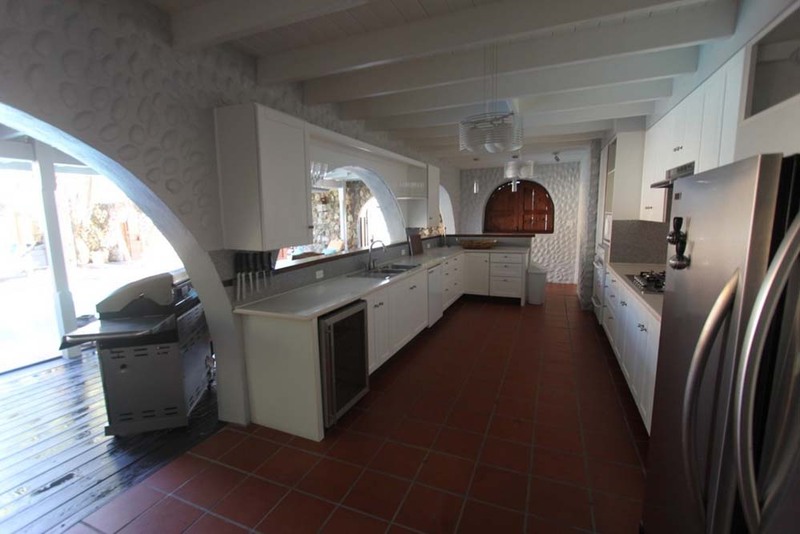 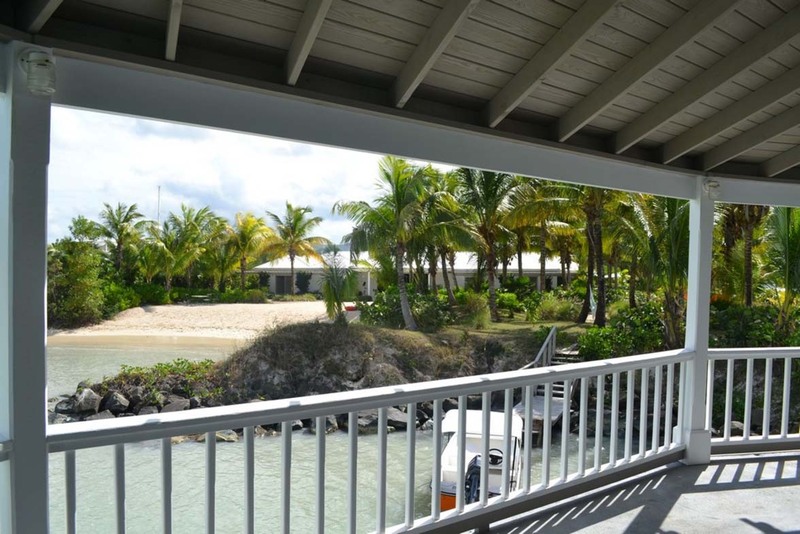 This villa is in a sought after spot among a few other properties in this roundup- within Jolly Harbour. 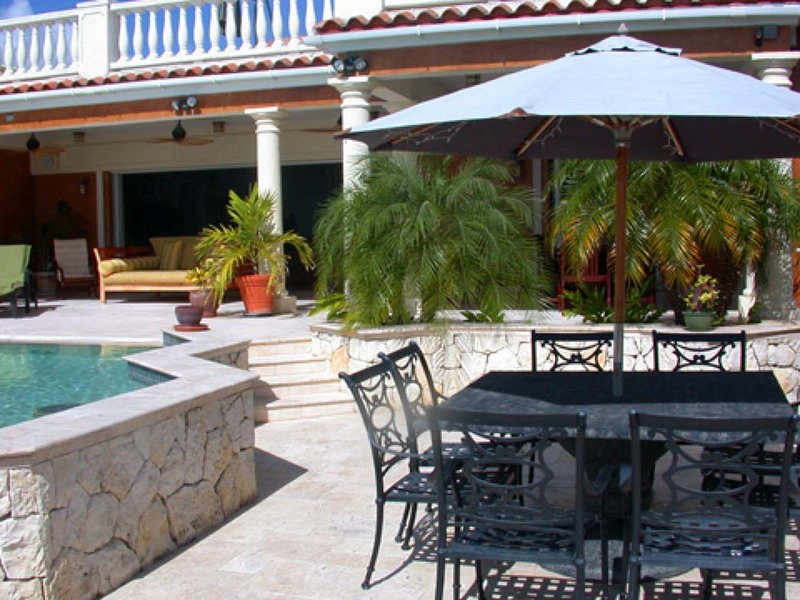 With an outside pool and dining area you are right next to the beach. 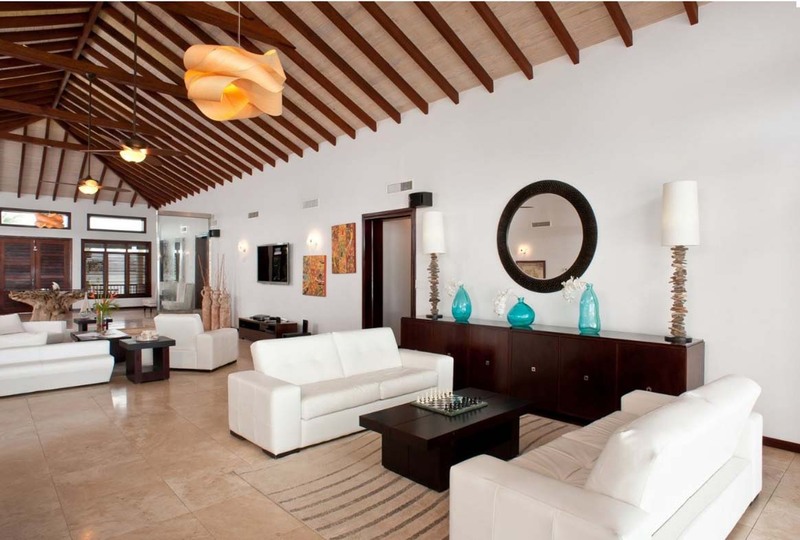 Each room features a TV and the furniture throughout is contemporary and the interiors bright and spacious. 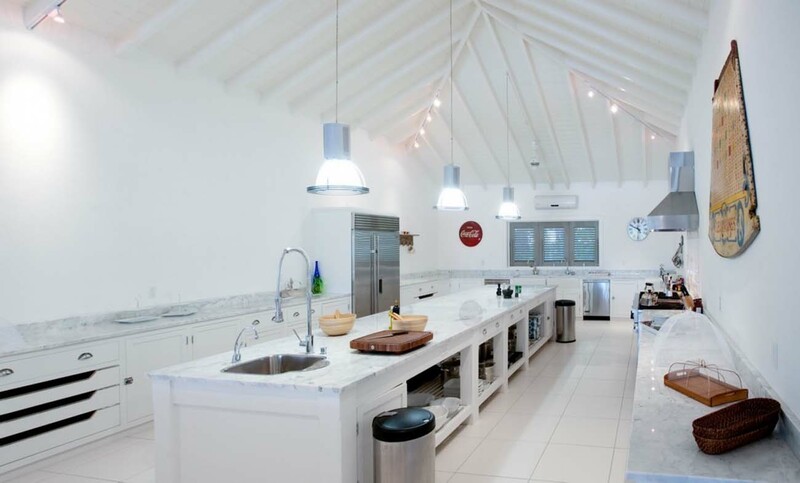 The kitchen is fully equiped with a pantry and 5 stove burner. 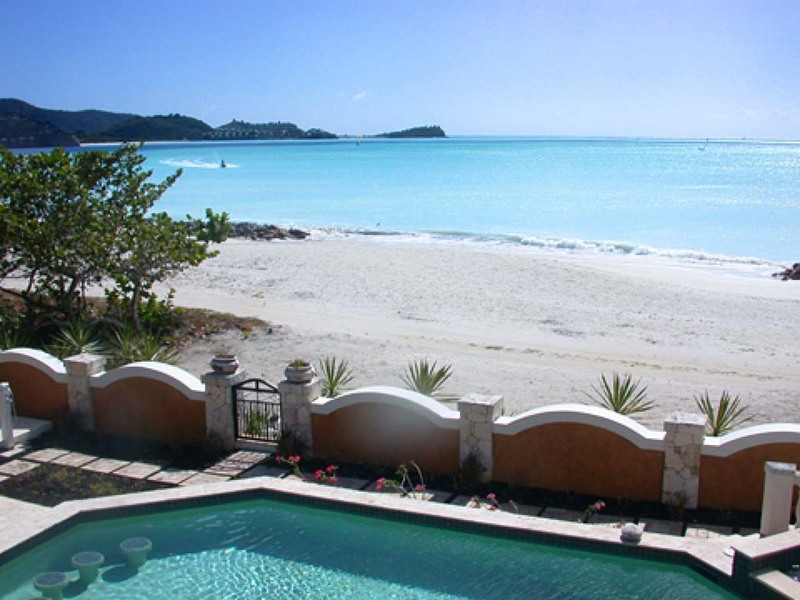 If you would like to learn more have a look at AllTheRooms's article on 'The 6 Best Beaches in Antigua' . 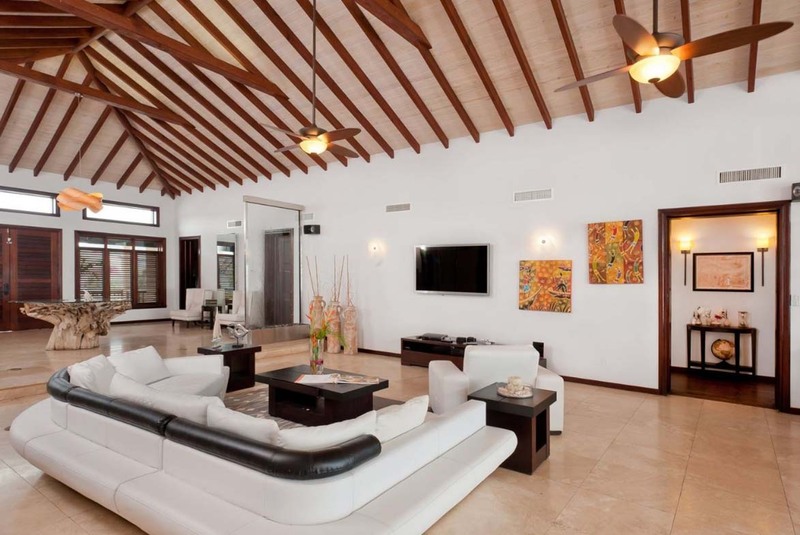 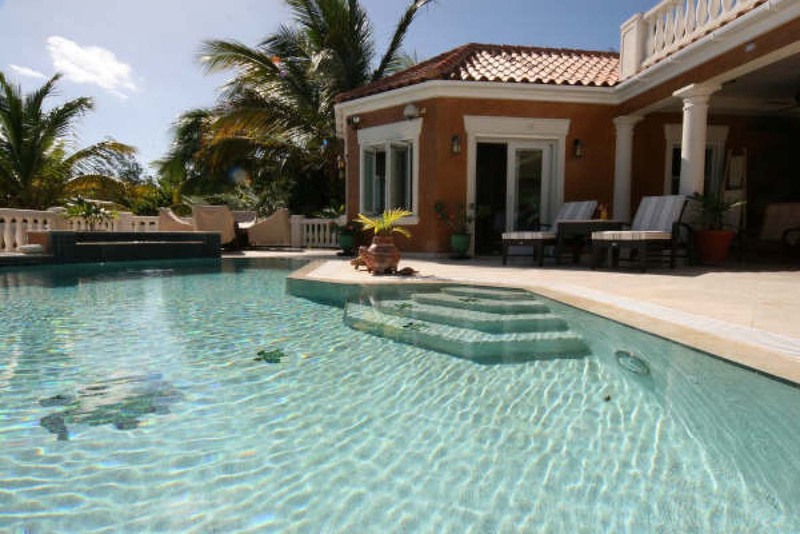 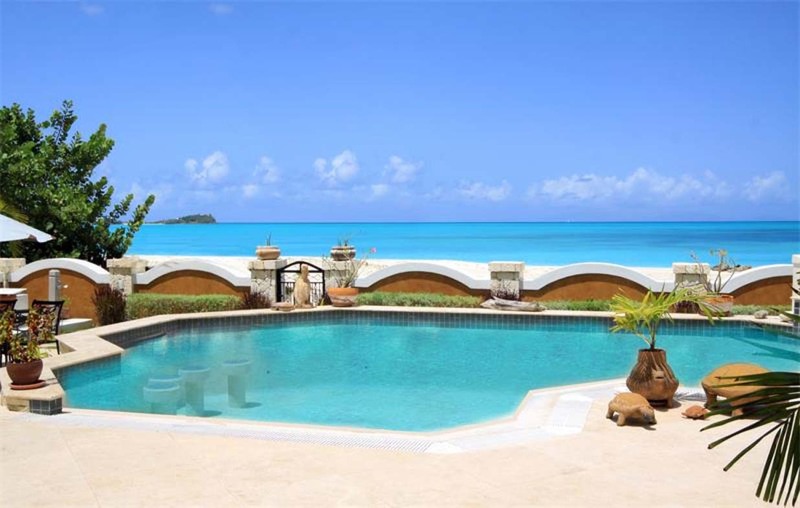 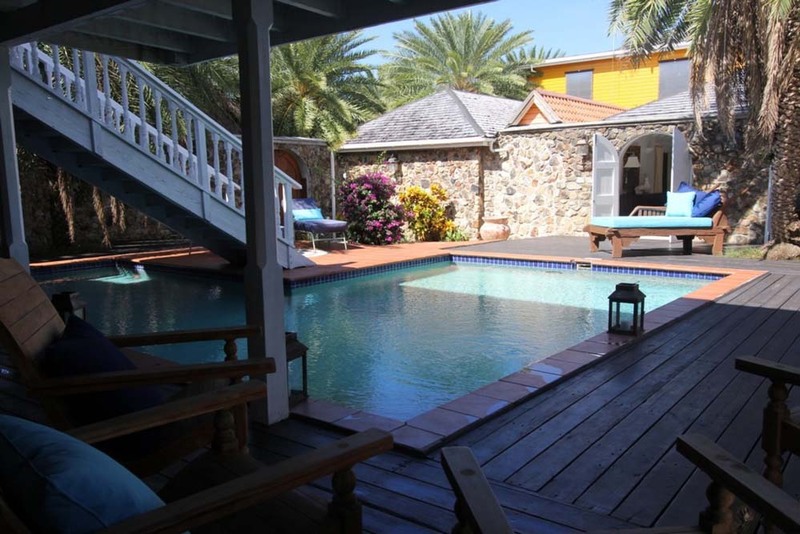 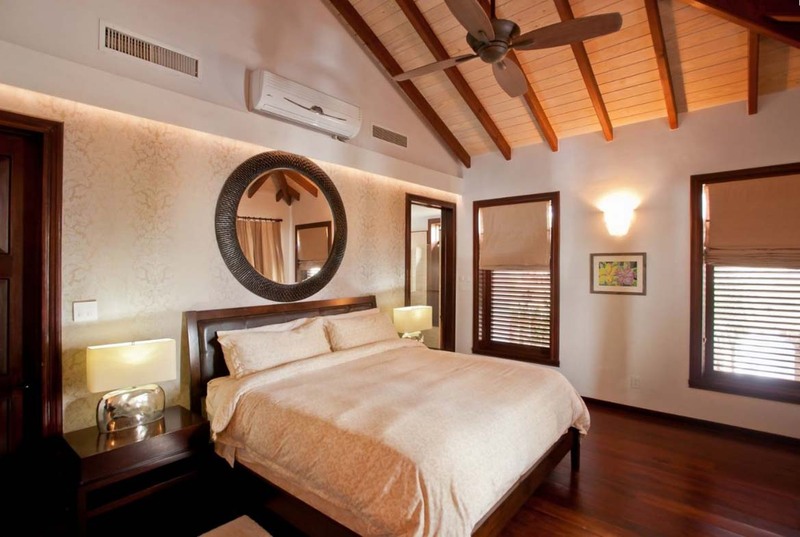 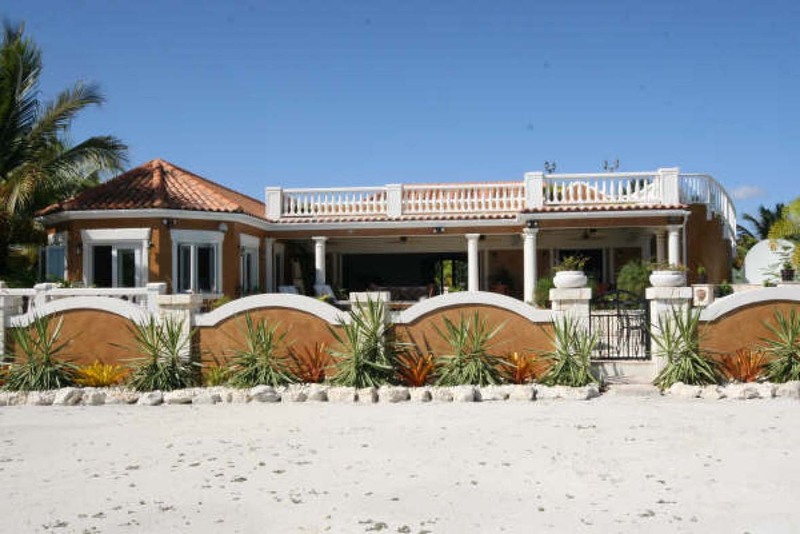 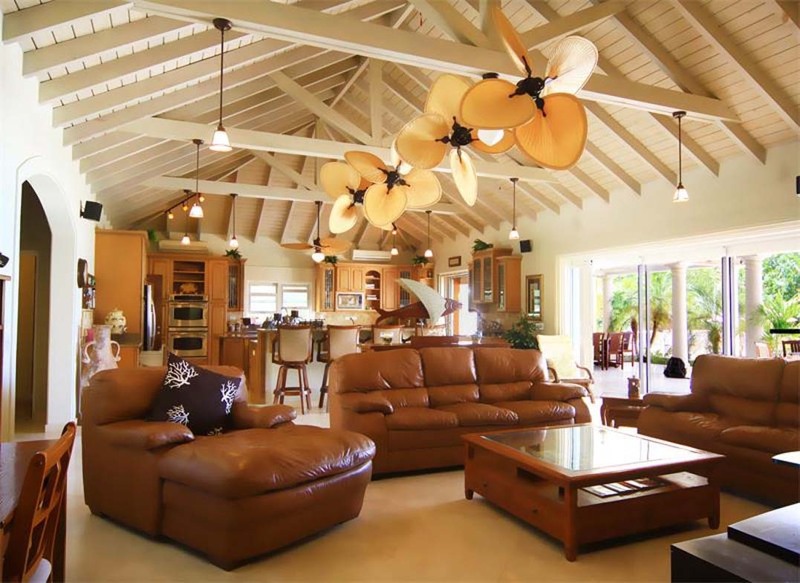 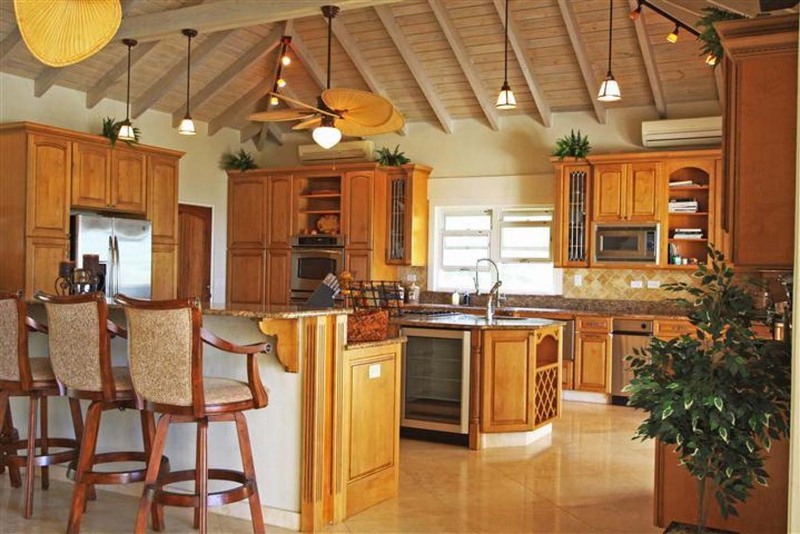 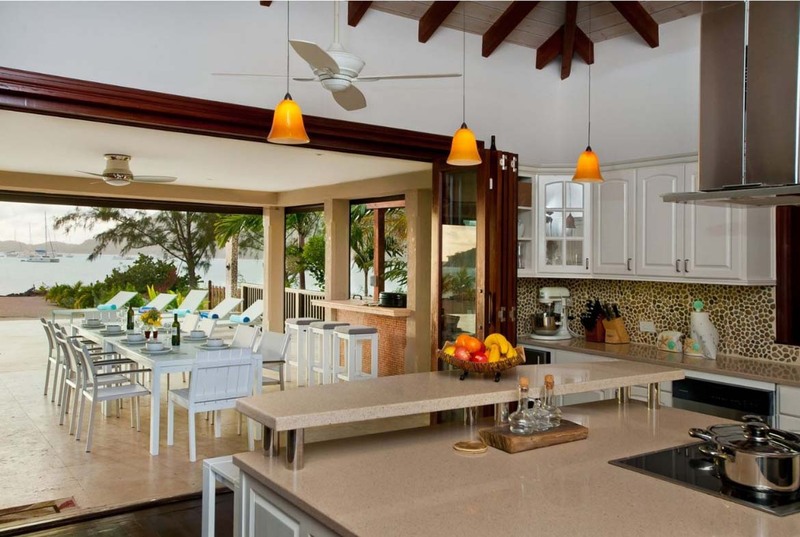 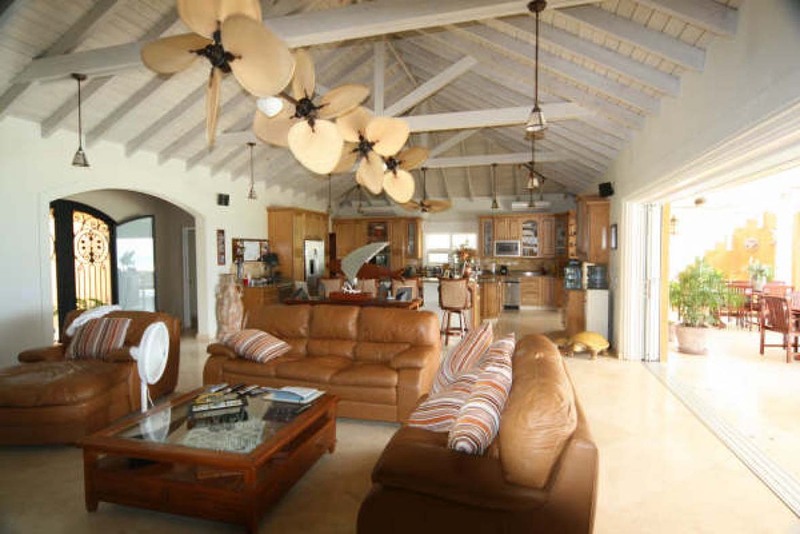 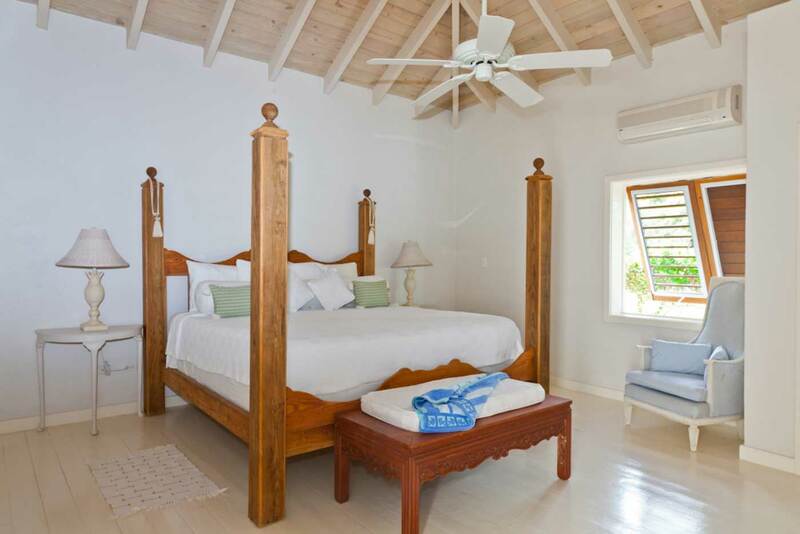 Sand castle villa is a 4 bedroom luxury villa (sleeping 8) set in the north finger of Jolly Harbour on the private beach. 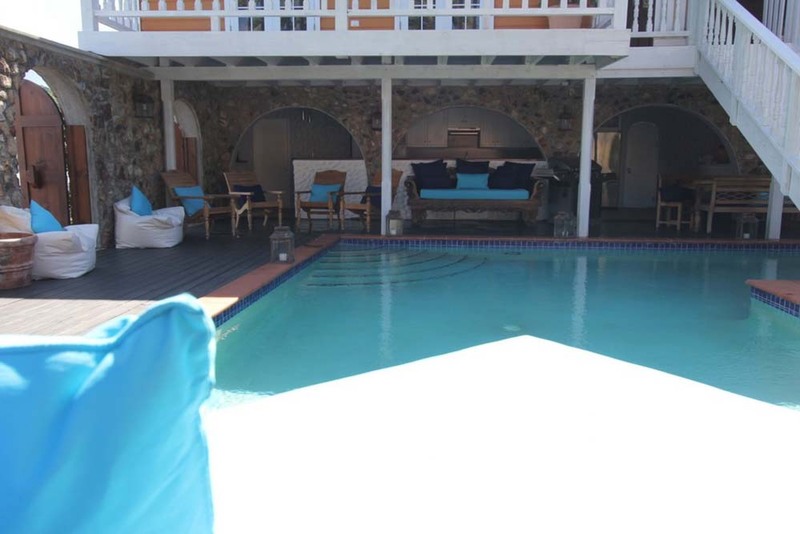 Perfect for weddings and groups with it's oversized pool and open plan lounge you will always have space to move in here. 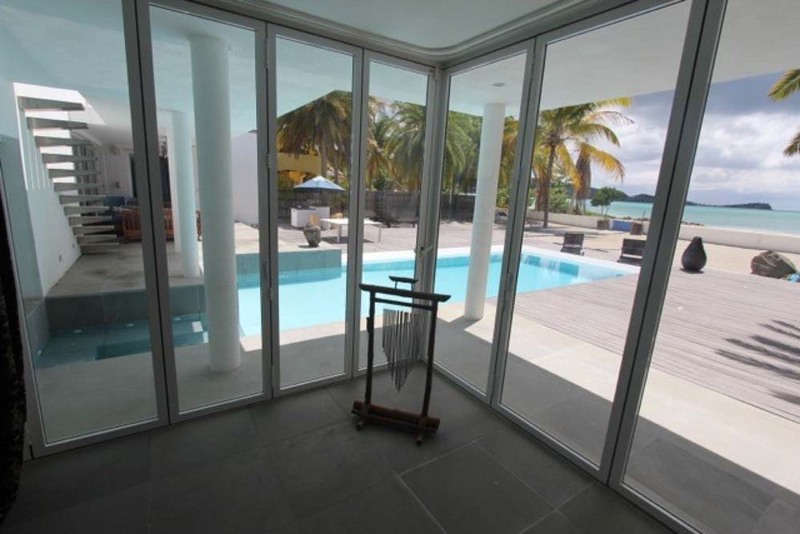 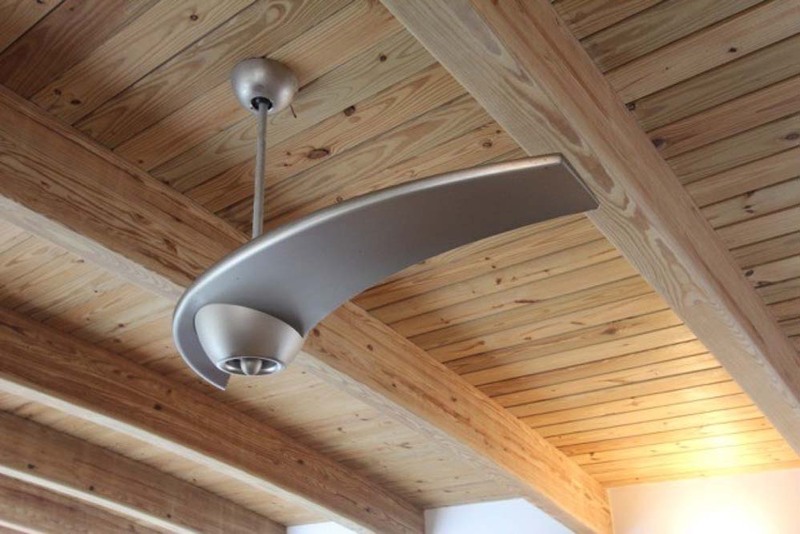 It is very well appointed with extra features such as pool table darts and jaquzzi. 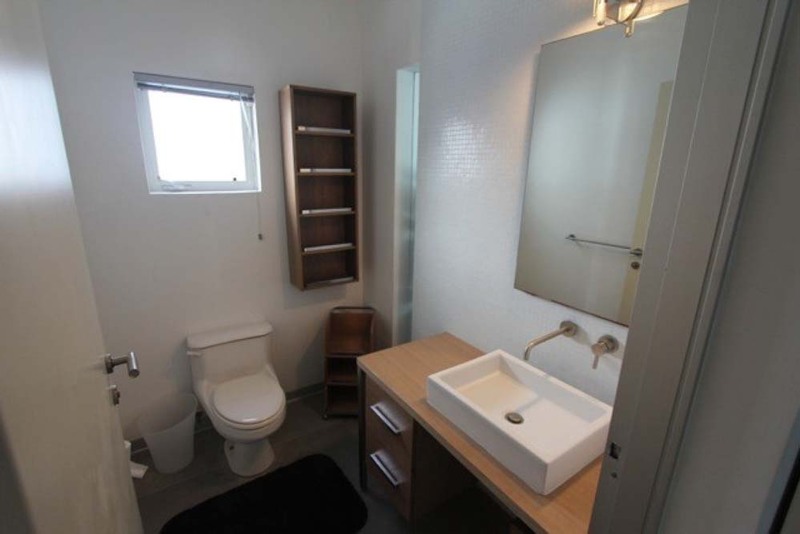 From $20,965 per week. 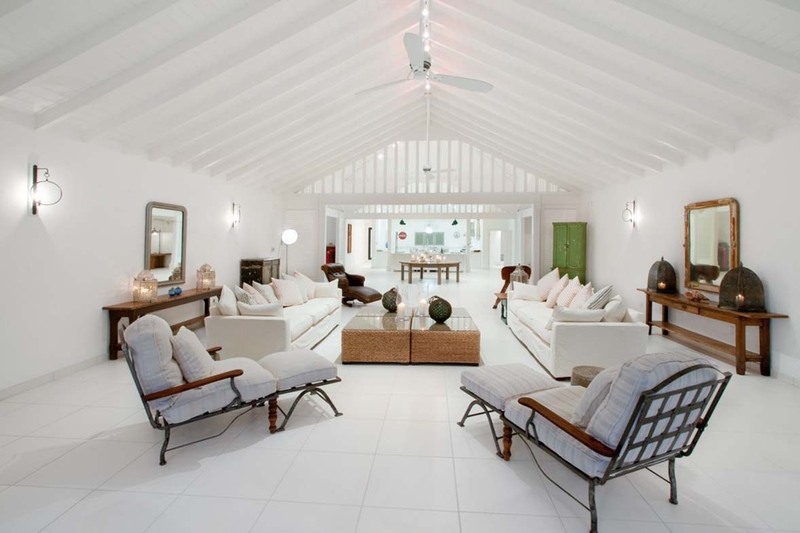 Dark wood contrasts well with the white interiors to allow the light to flow through and balance the spacious interiors (12,000sq ft.). 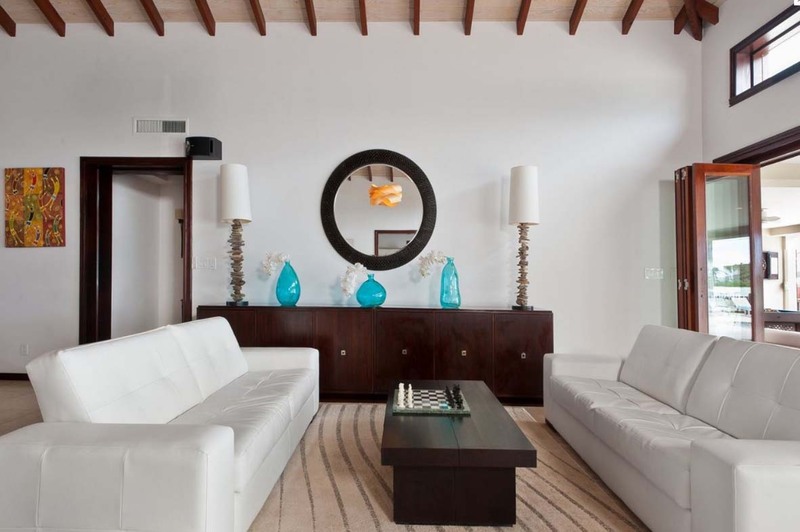 The furniture is designer and generously appointed- luxury is assured. 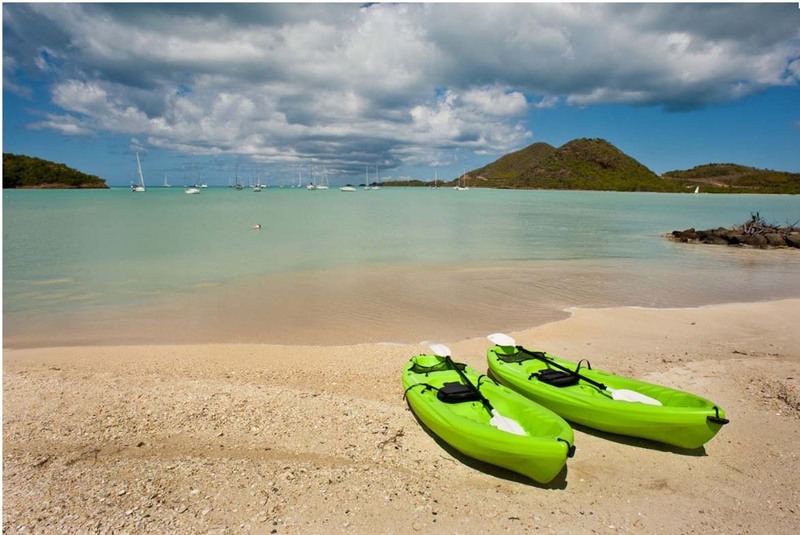 The sea here is calm and welcoming for a variety of watersports or just a swim. 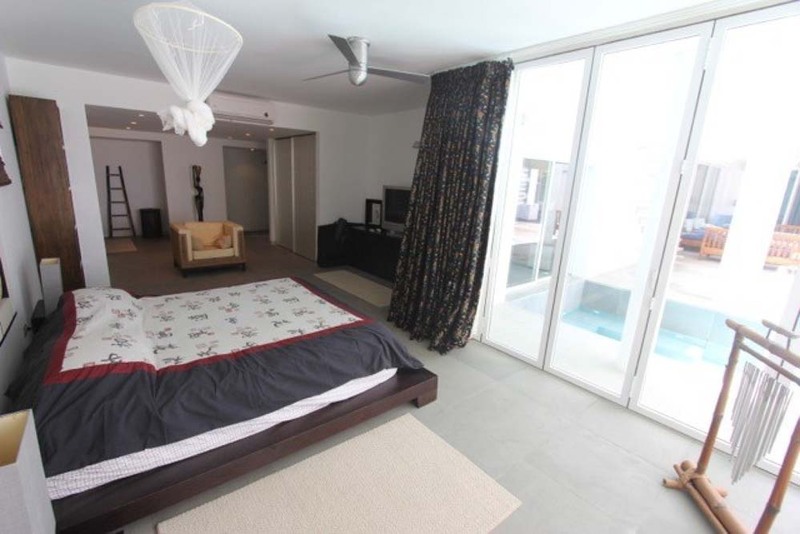 Features such as a personal chef can be added to the package which is very well designed for this price point:Night watchman, Concierge and daily maid. 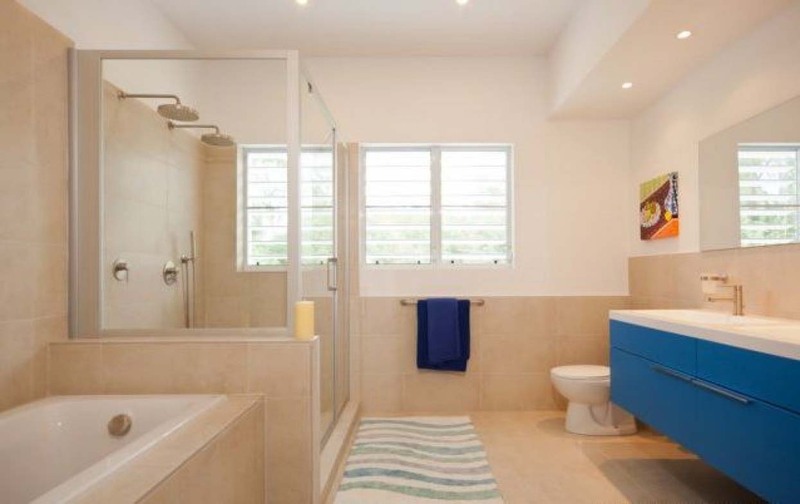 We offer other similar properties so please get in touch. 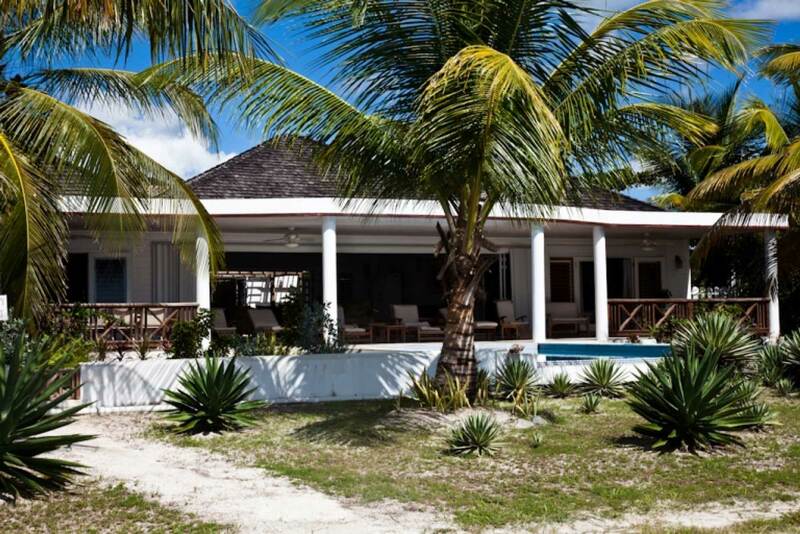 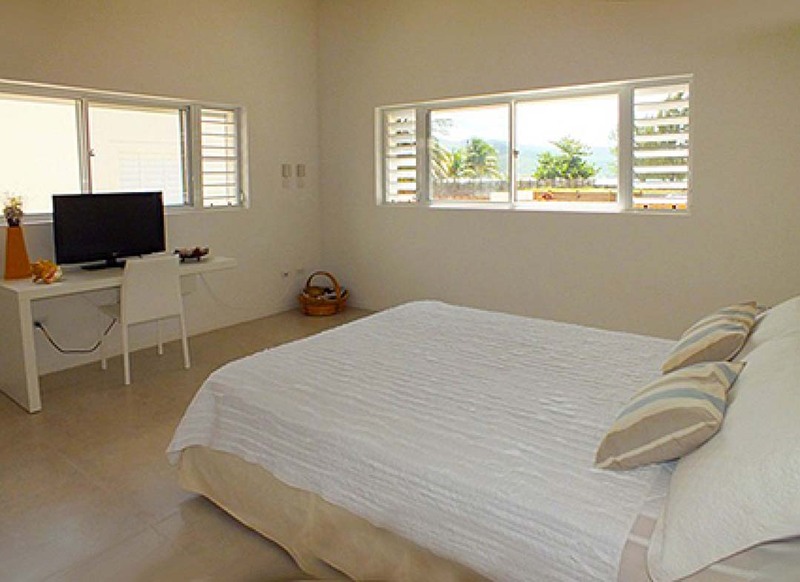 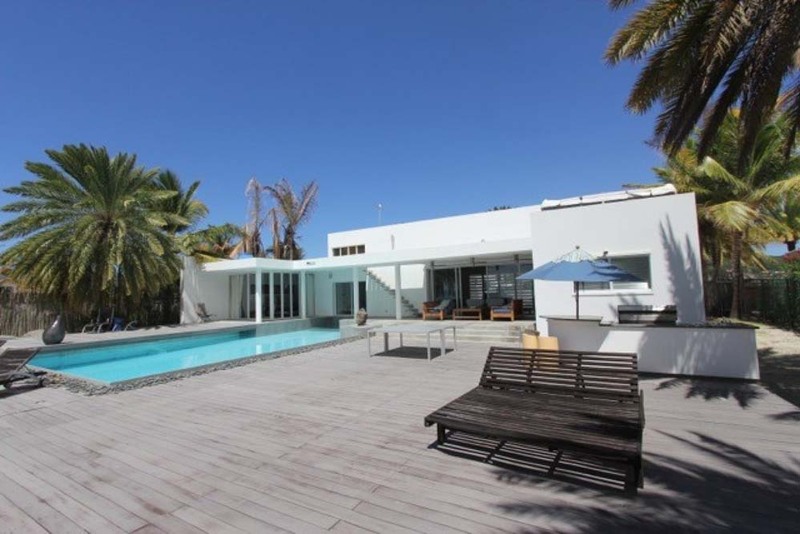 Another 4 bedroom property suitable for larger groups located right on the beach. 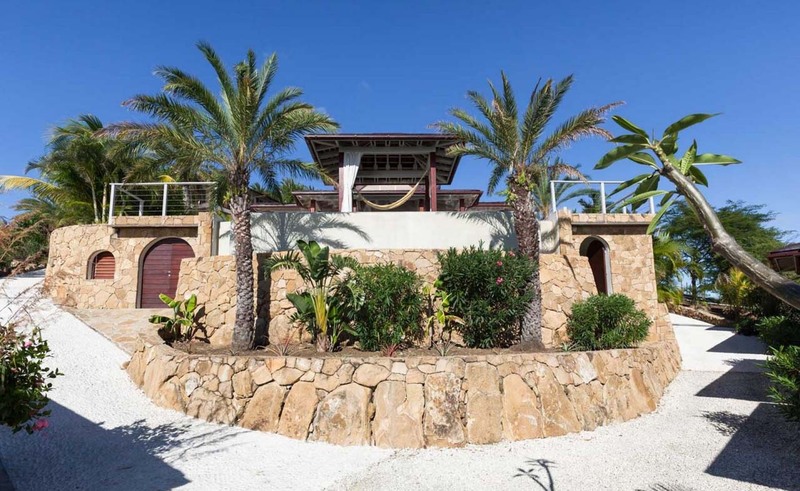 A more mediteranian feel exudes from the architecture and design for this property with terracota and stone walls outside and tan colours against cream and white inside. 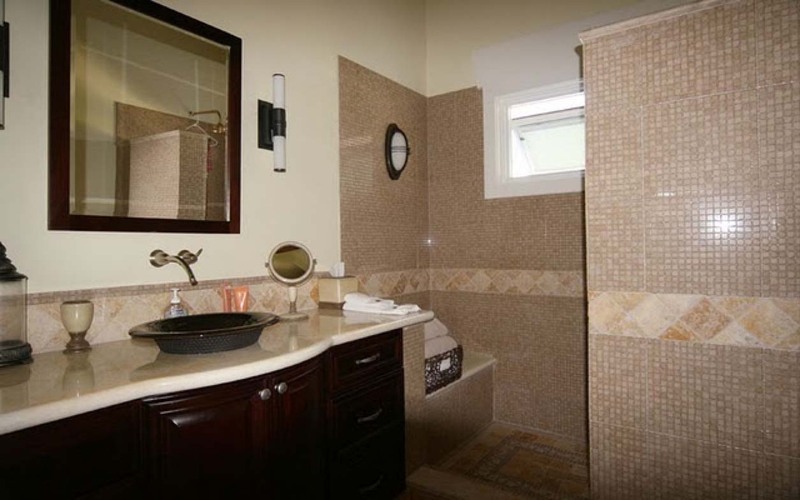 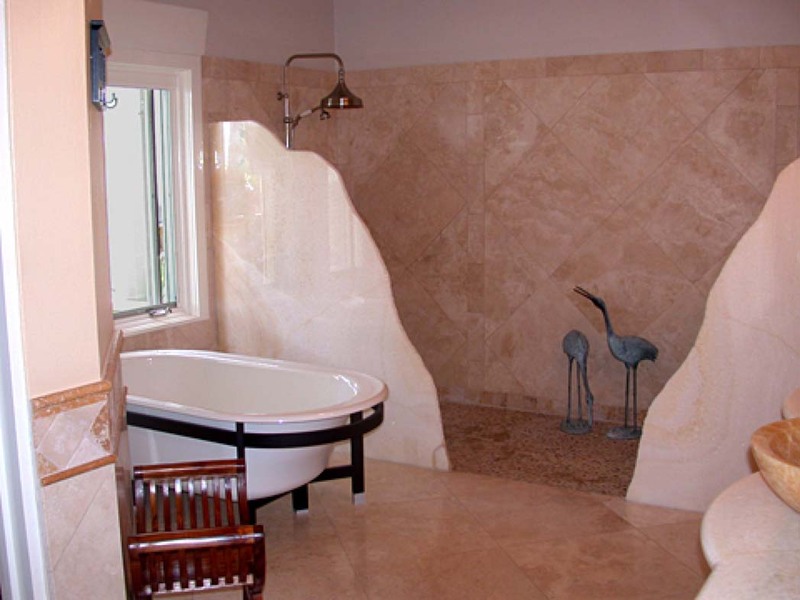 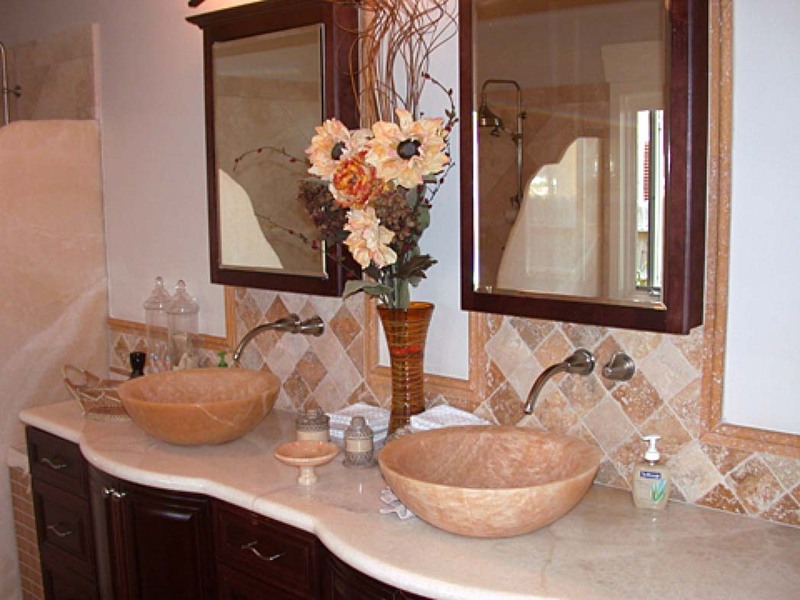 Peach is a colour that is also featured in some walls and of the 4 bathrooms. 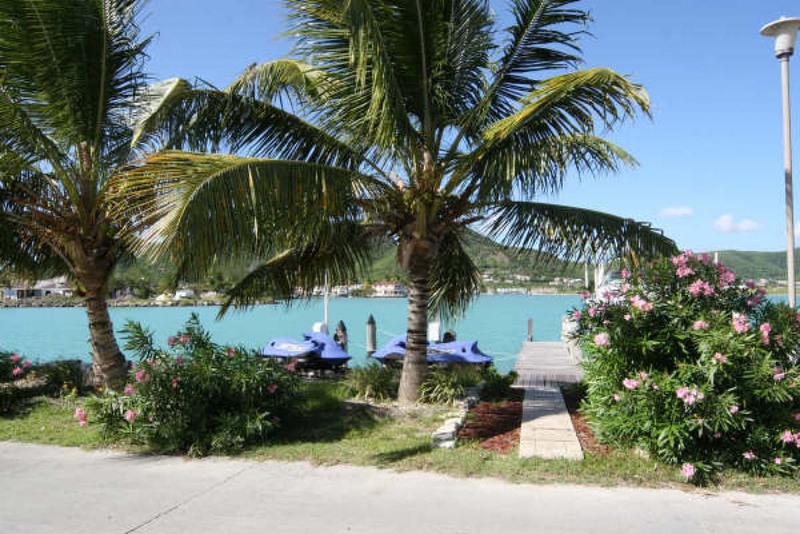 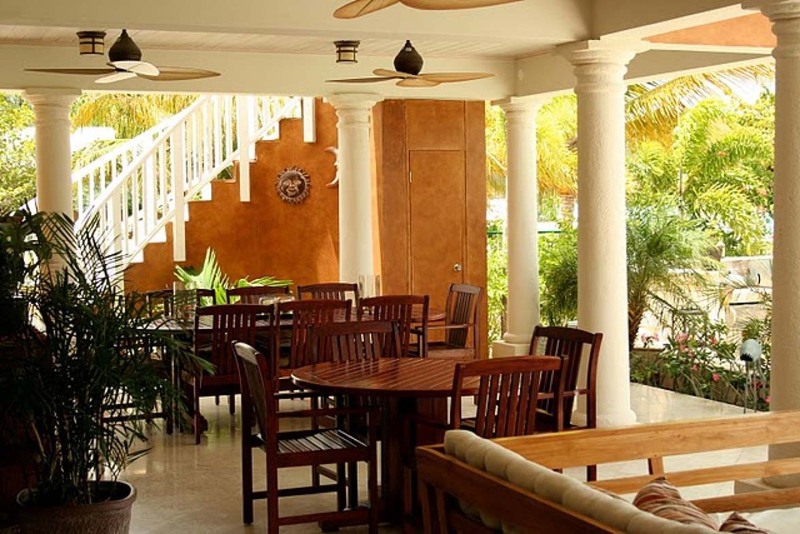 The attractions and features of Jolly Harbour of course exist for your stay while security with a night watchman and services of a concierge and daily maid provide you with all you need. 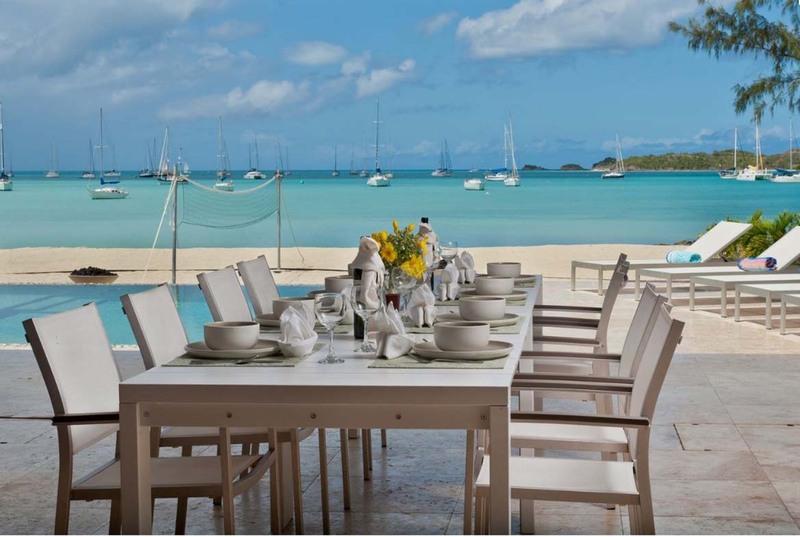 A chef can be arranged at an extra charge. 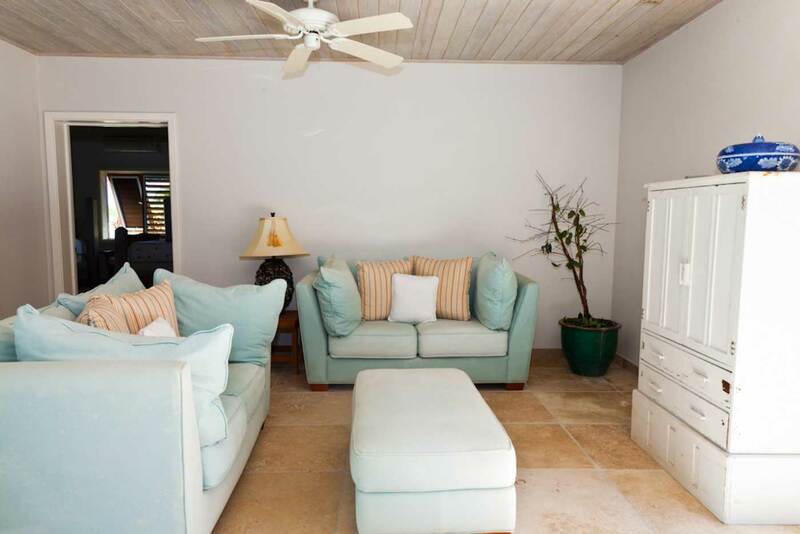 The rates for ocean breeze are 12,900 per week in the low season. 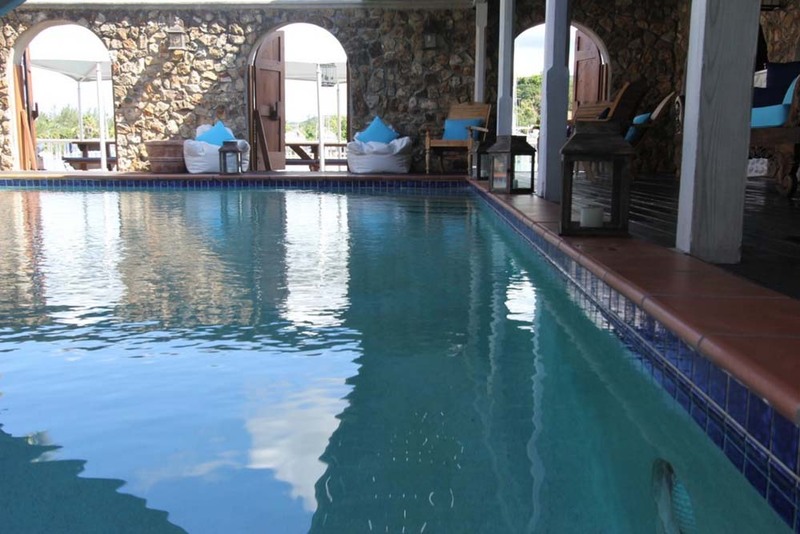 The swimming pool and jaquzzi's offer a fresh water dunk other than the ocean which is footsteps away. 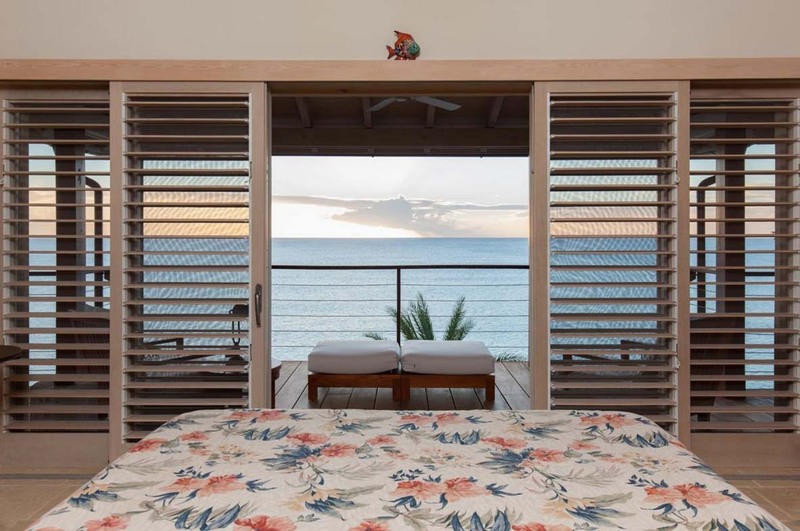 Sharing in common less than the beachside residences here, we have the Jolly View, a new take on modular comfort. 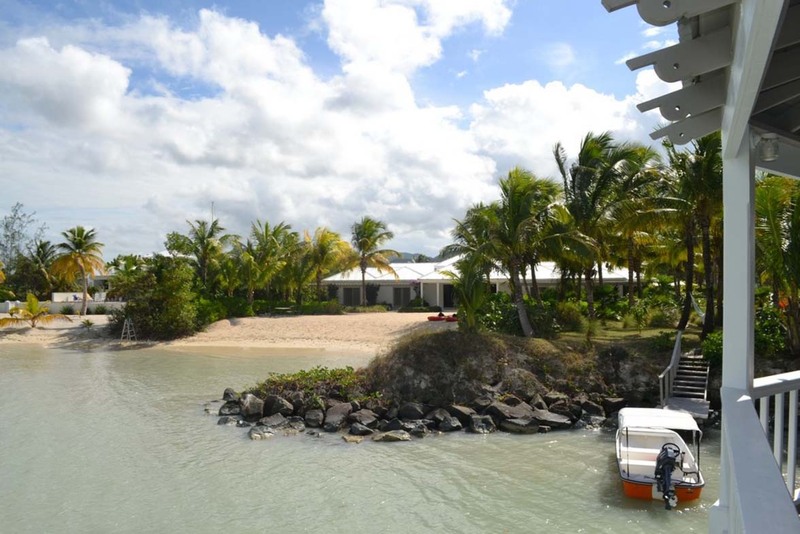 Just 2 bedrooms sleeps 4 in a private setting on the side of exclusive reeds point Jolly Harbour. 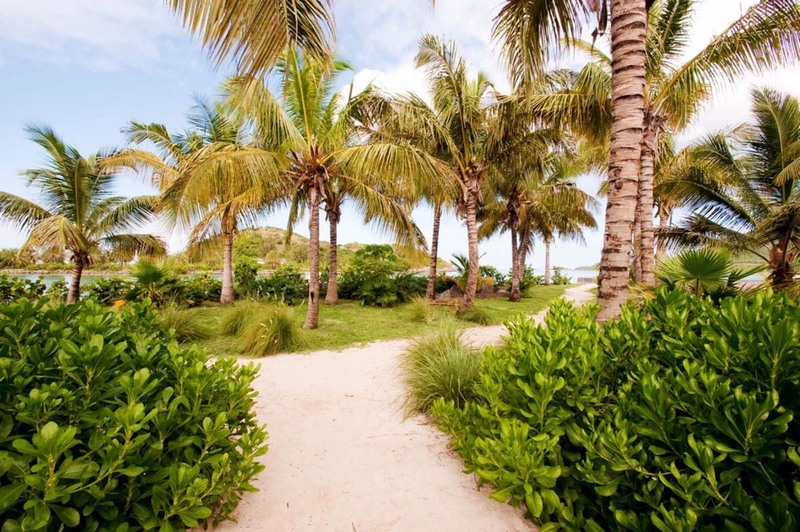 Not directly on the beach it is a short distance away. 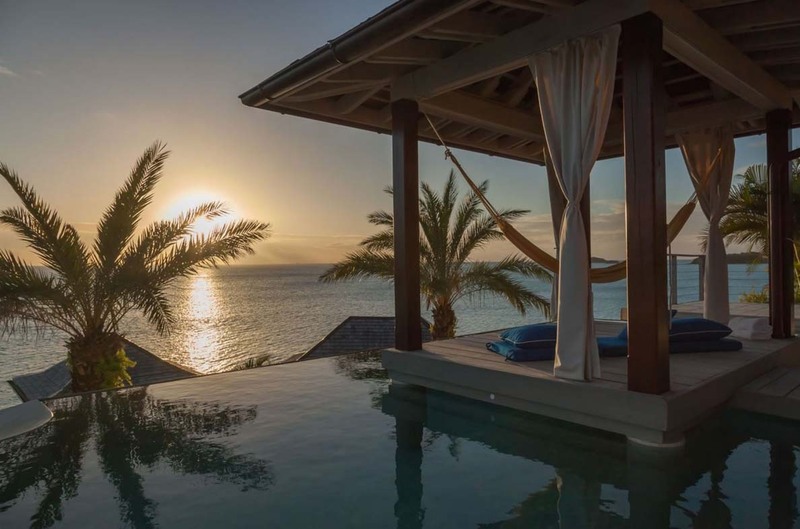 The benefits are soon to be seen and it's hard to put into words what you can see in the spectacular images in the gallery. 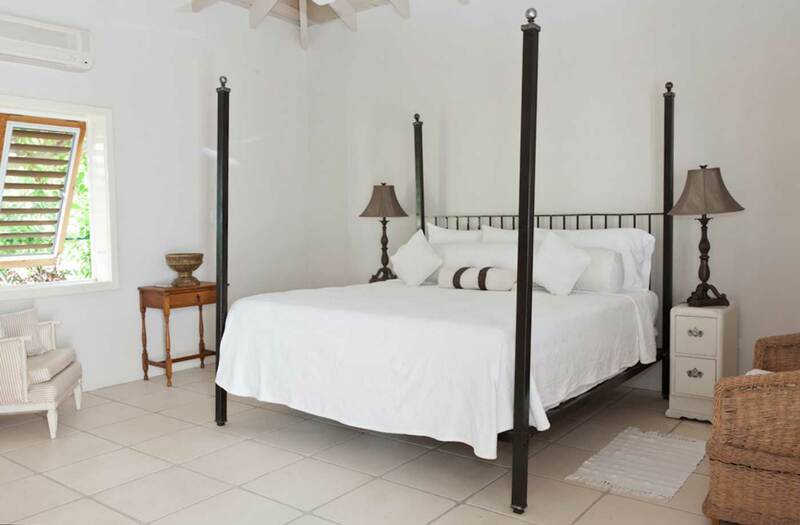 With a weekly rate of 9450 per week you can check with us for availability. 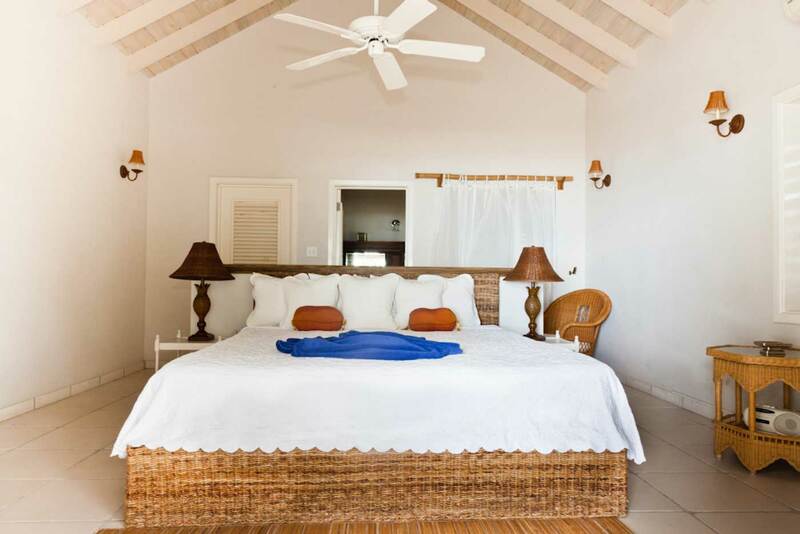 Beating the beachside villas for sheer design and views across to Montserrat and Nevis islands is Jolly View. 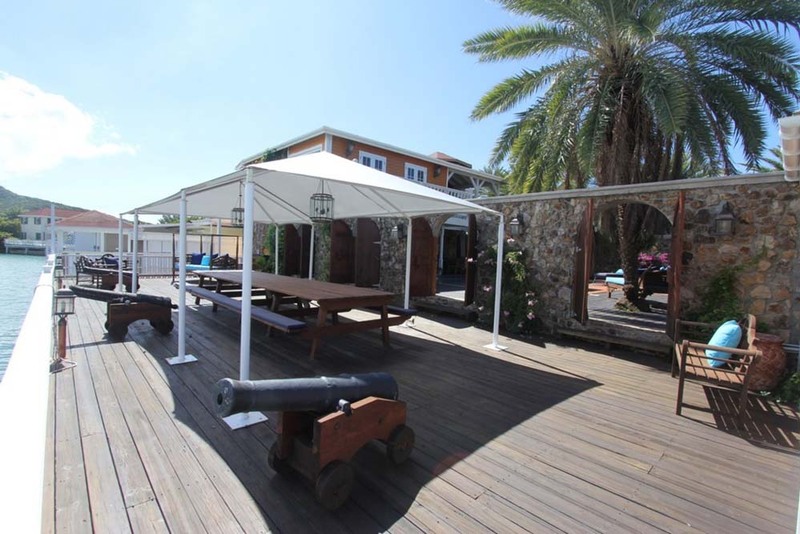 The modular design gives shaded areas in pergola style constructions allowing you the perfect setting and tranquility if you choose. 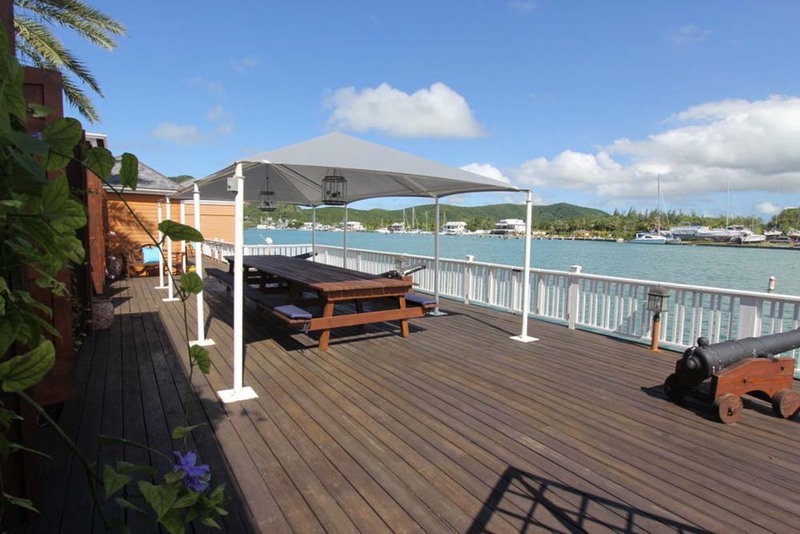 Having the facilities of Jolly Harbour on tap yet being the perfect distance away from the hub is a treat. 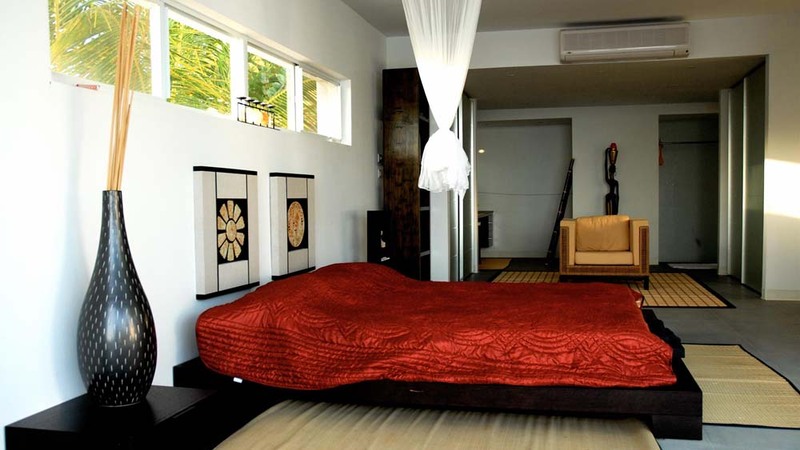 Another 4 bedroom property is the asian themed Dragons Lair. 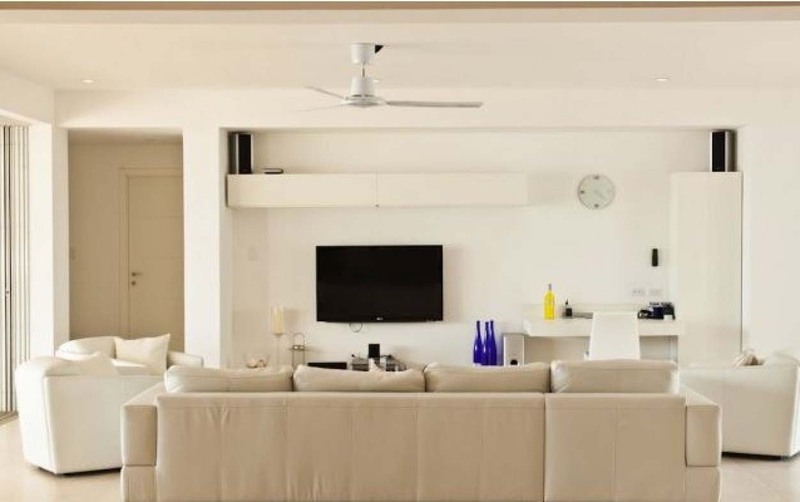 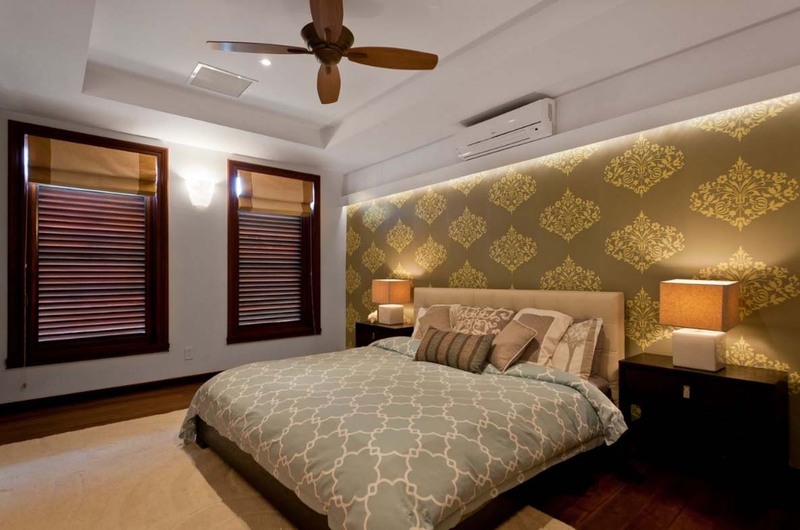 With a style of it's own interior and modern appliances and furniture you will have a great stay. 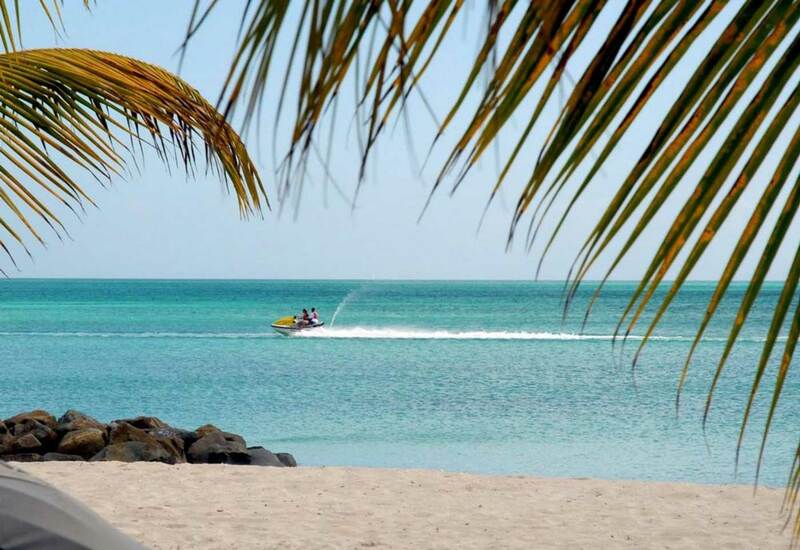 Located on the South finger and the beach of South Beach and Jolly Beach you have no excuse for wandering down to the Caribbean sea for a swim at 6.00am unless the rum hit you! 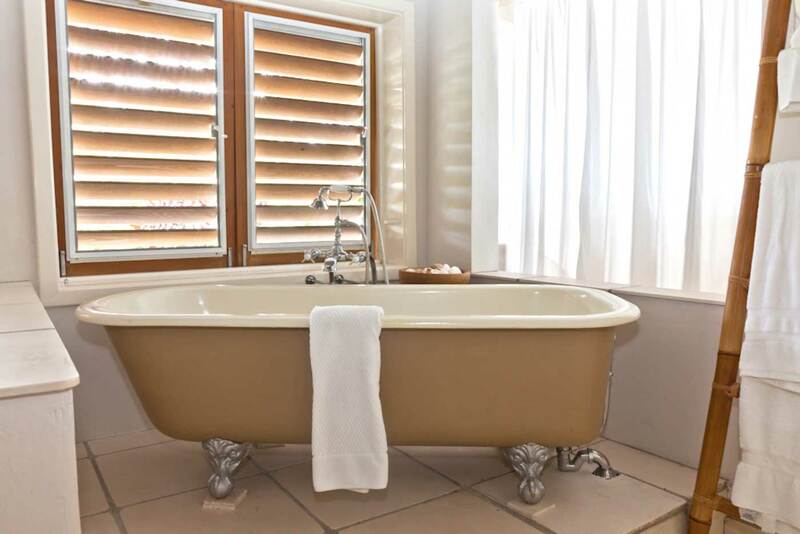 Cleaning inclusive, Concierge Service, Linen provided, Towels provided. 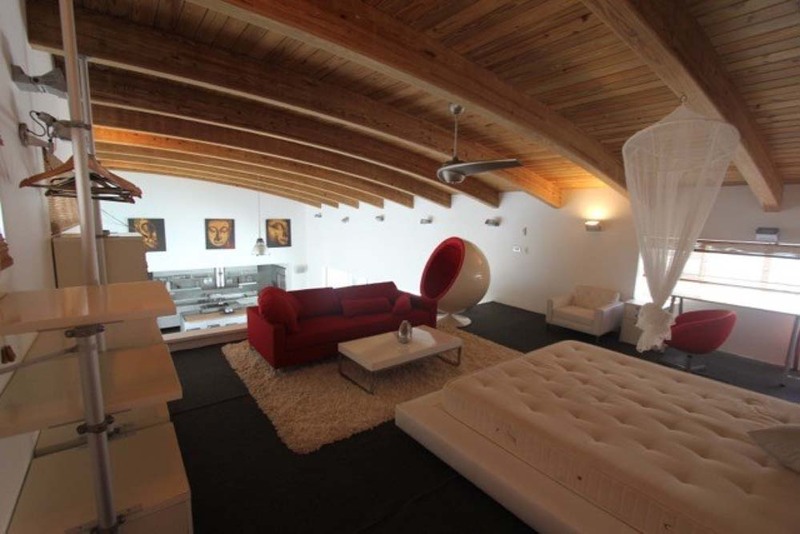 The photos don't do this place justice. 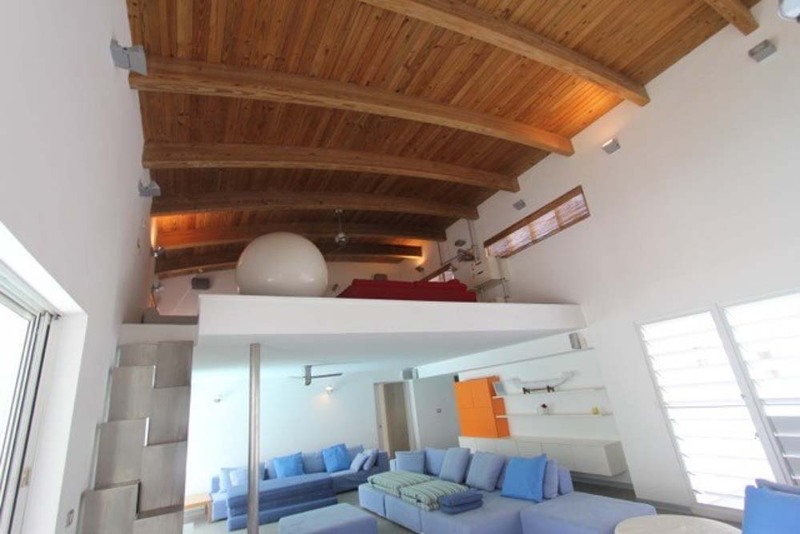 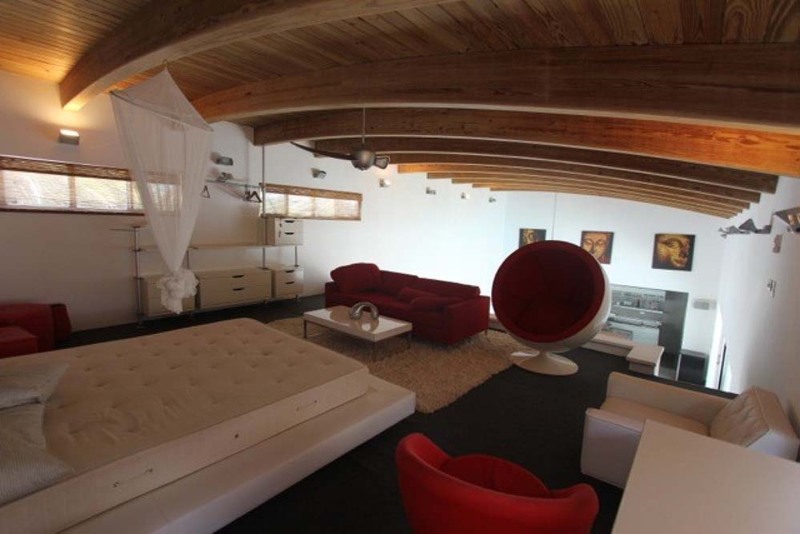 It can sleep up to 11 people with 4 bedrooms and a mezzanine lofted area. 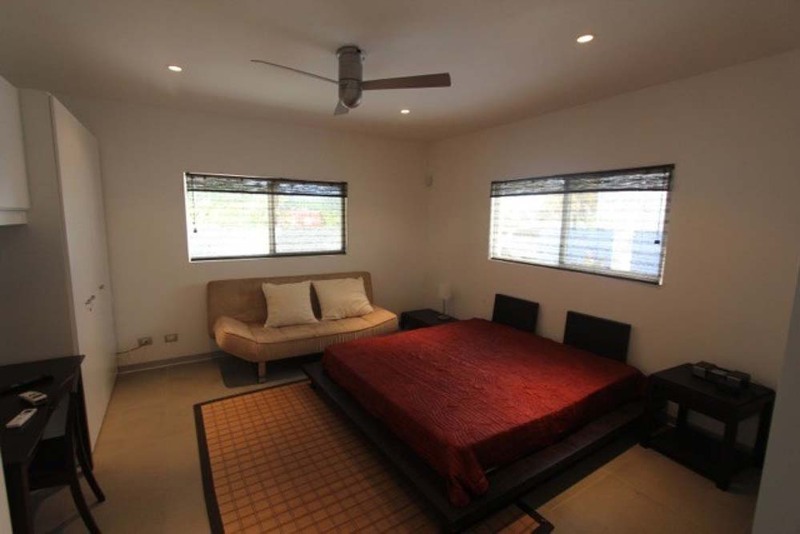 All the rooms apart from the mezzanine have a/c. 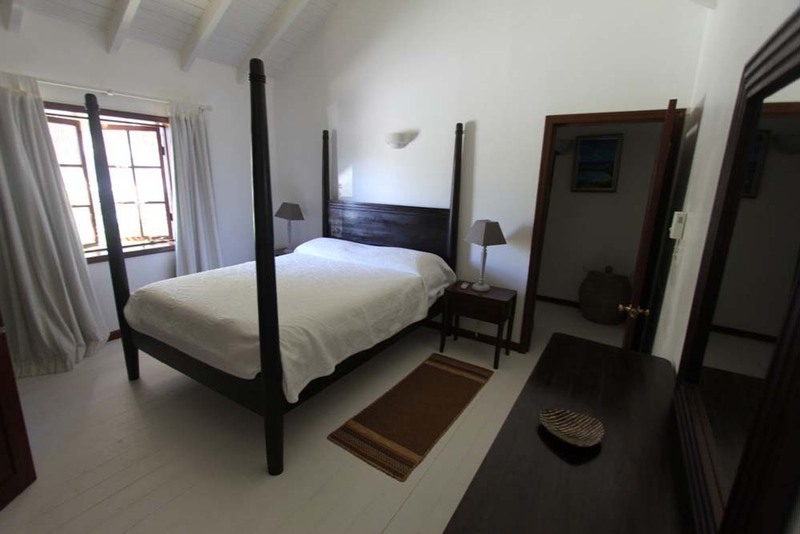 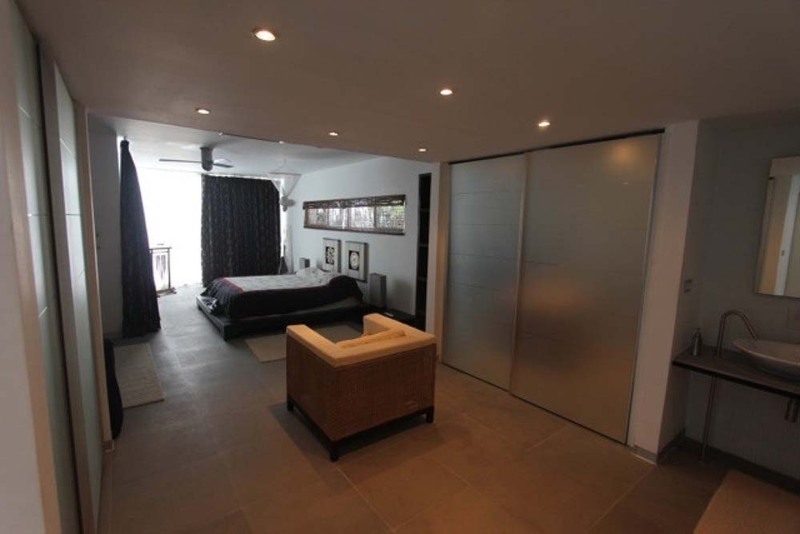 the 2 double rooms have ensuite bathrooms but the twins do not and nor does the mezzanine. 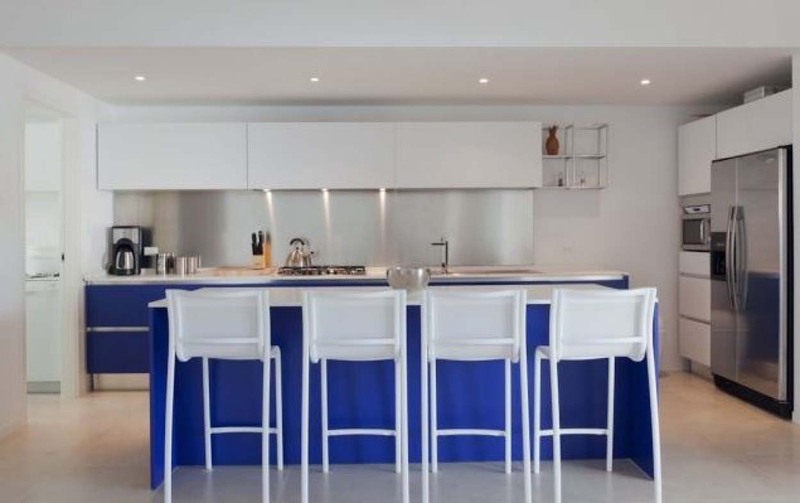 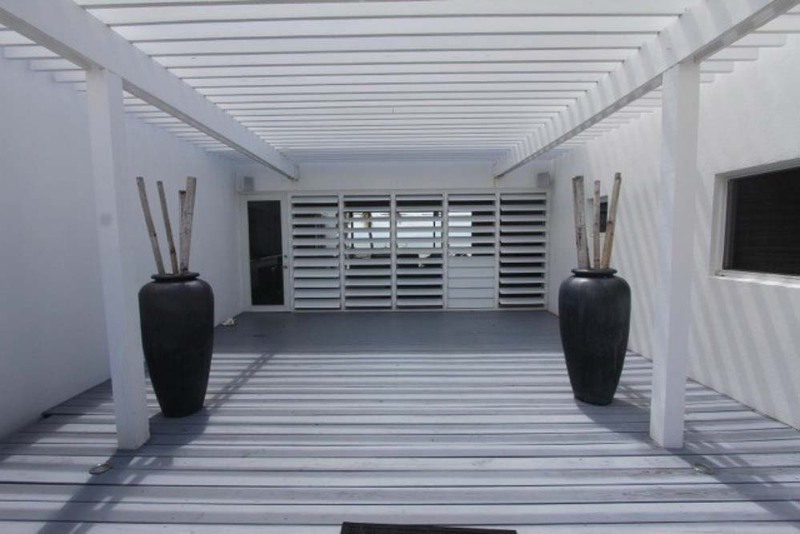 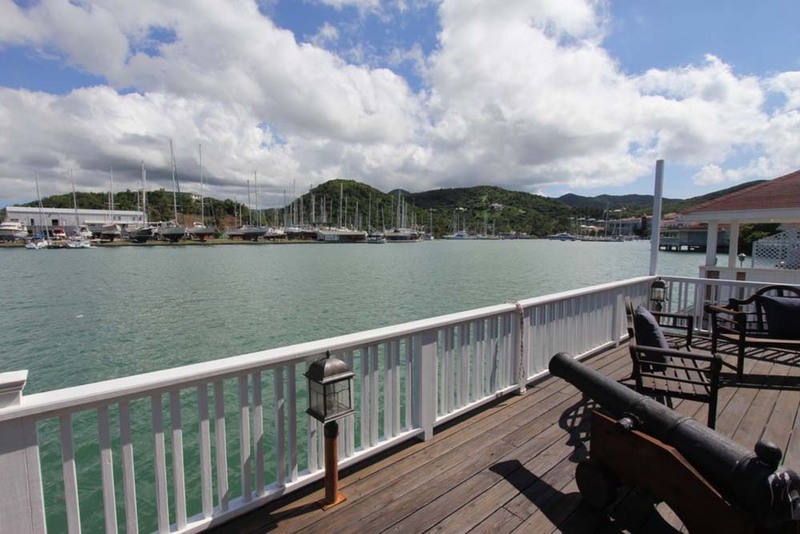 There is an upper deck with a jaquzzi which helps to differentiate this property from other similar sized property. 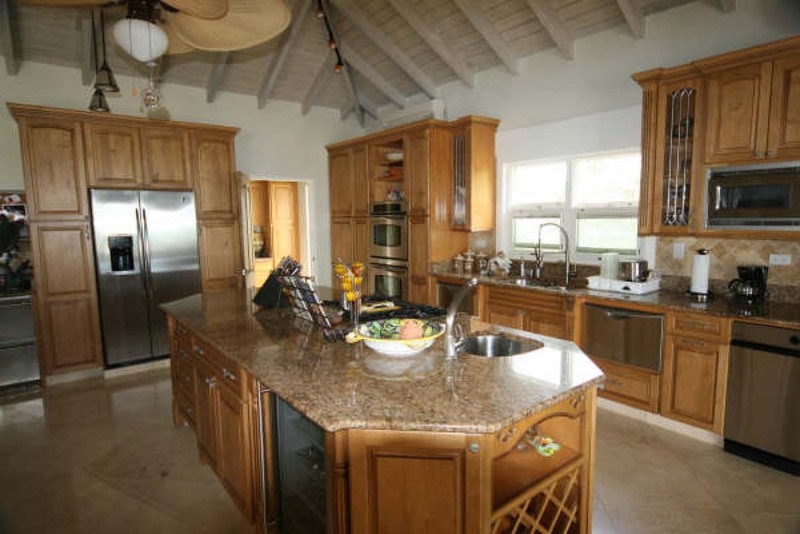 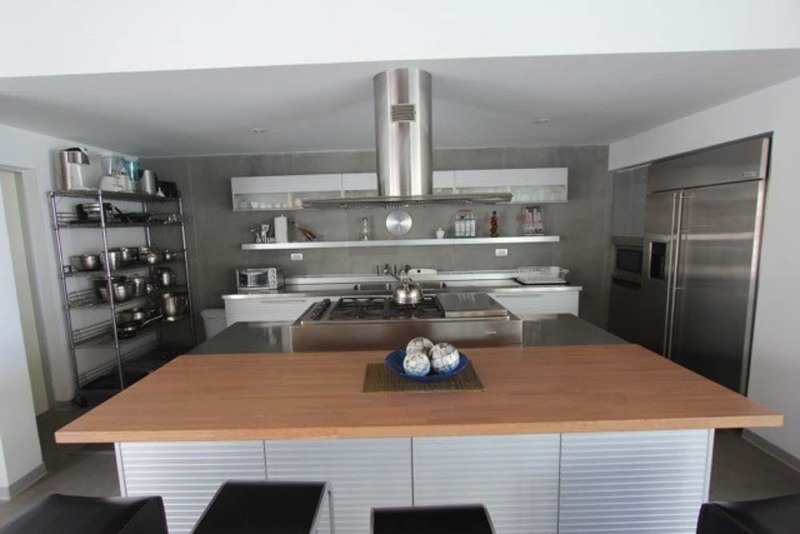 A full gourmet kitchen is at your disposal and if you want not to cook then consider hiring a chef for the week. 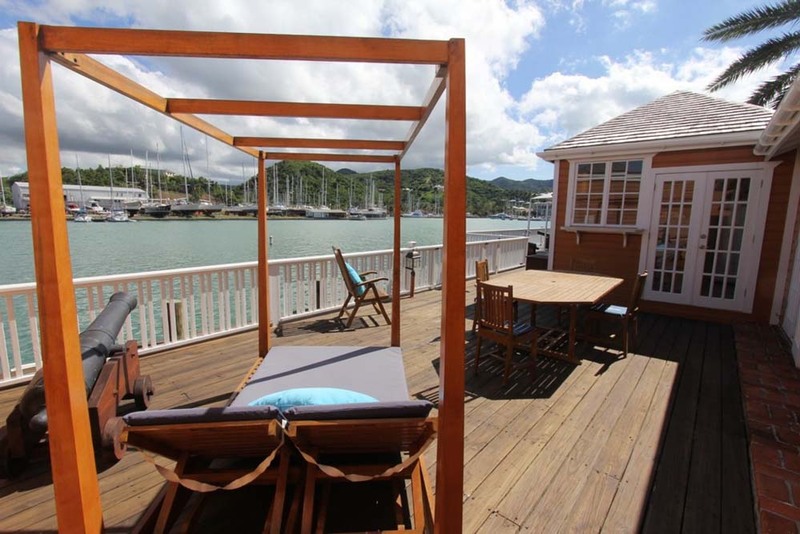 Our final property is not on the beach but has a marina view and attractive decking. 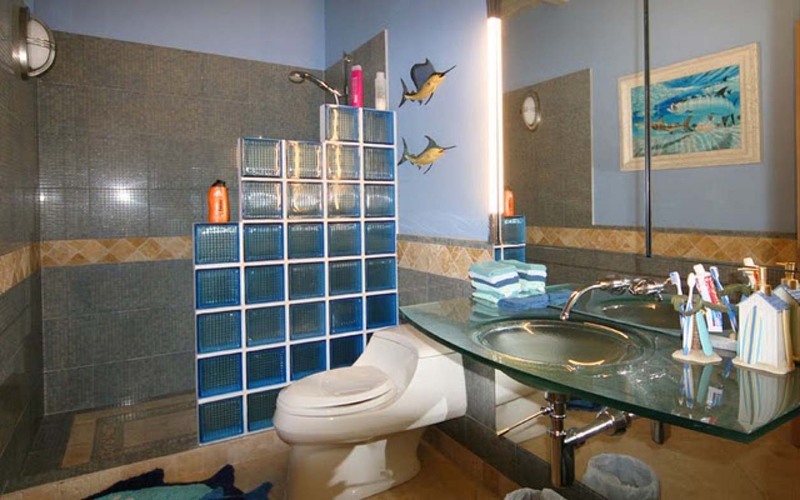 This has a capacity of 13 depending on the makeup of your party and their willingness to bunkbeds! 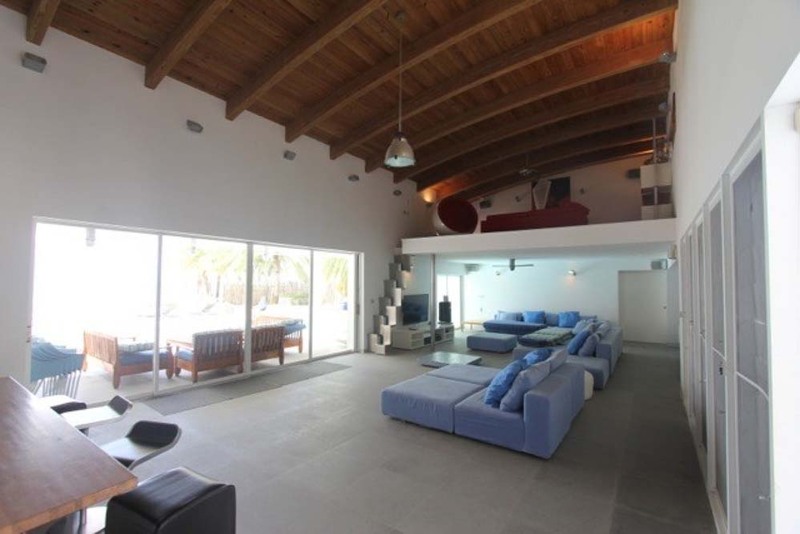 This property is available from 4500 per week in the summer season, check with us for special offers. 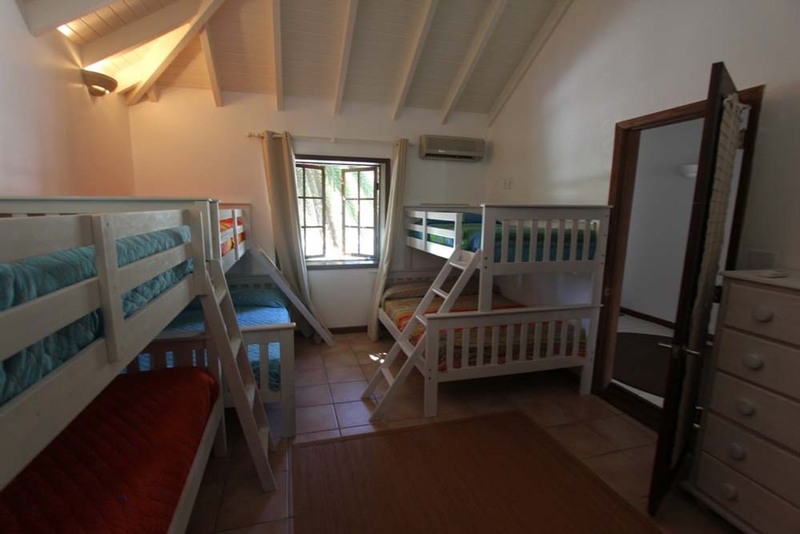 Chosen as it has a grand capacity to fit 3 large sized families due to the bunk beds in the 4th room. 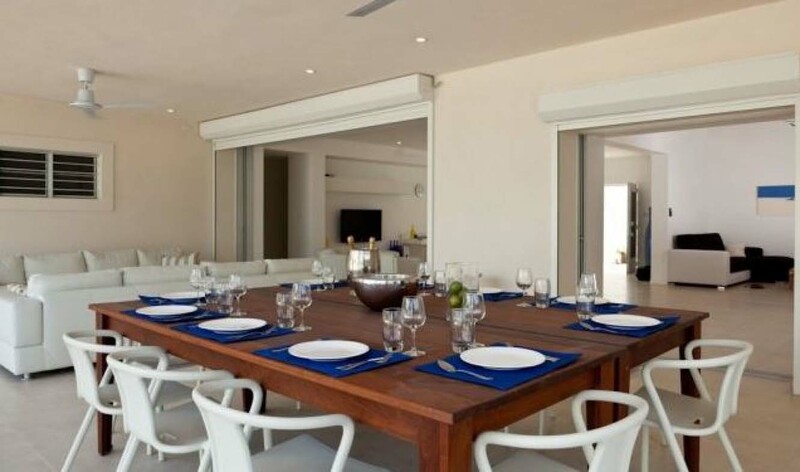 So 6 adults and 7 children is the capacity. 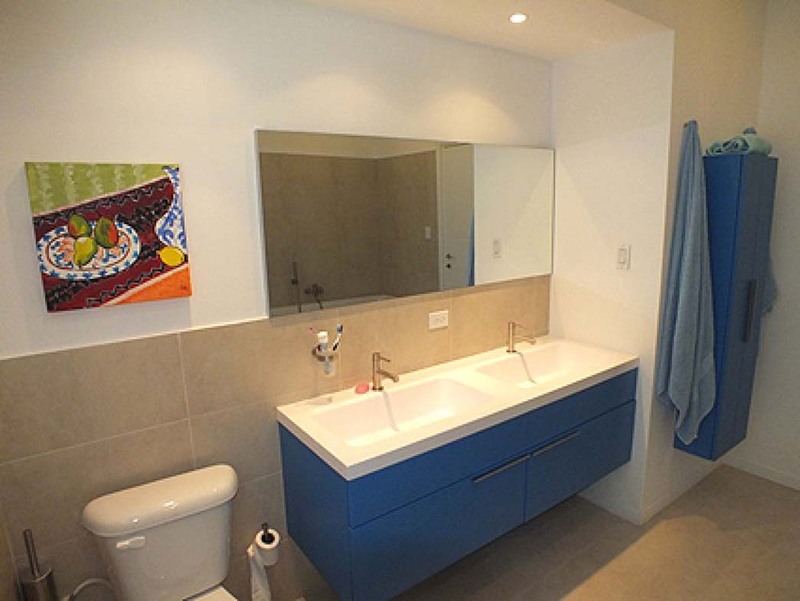 If you are interested in these or other rental properties then let us know by filling in a few details. 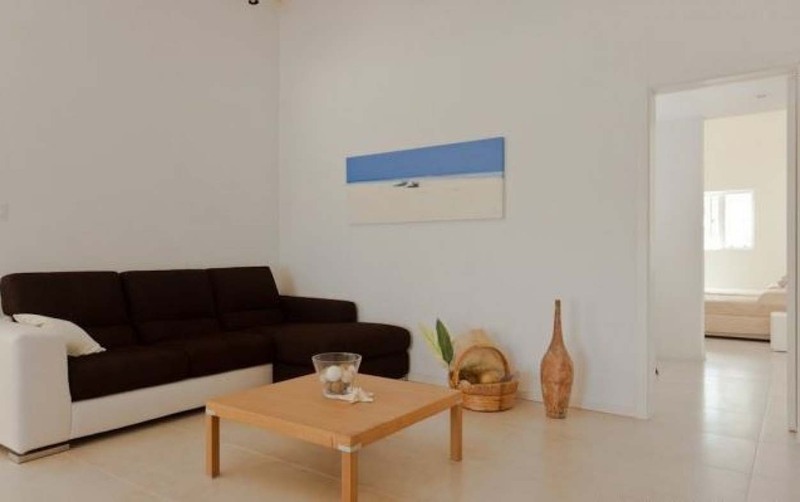 We don't list all the properties we can rent so if you see a property elsewhere then get in touch and we will see what we can do. 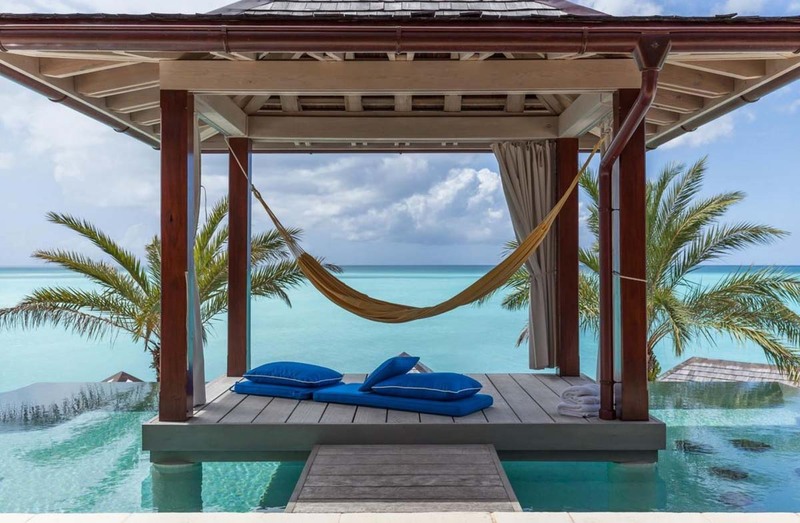 Copyright © 2019 Best Antigua.